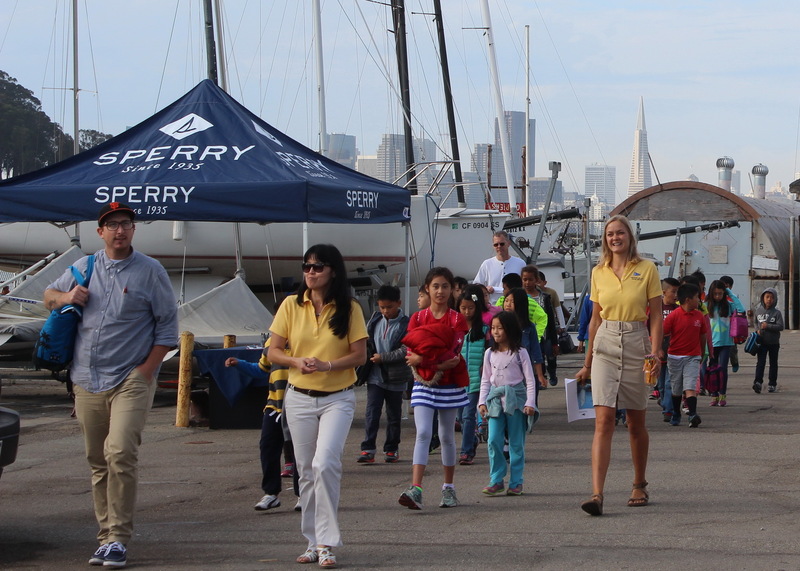 TISC Opening Day and Safe Boating Day packed Clipper Cove with 723 excited attendees. 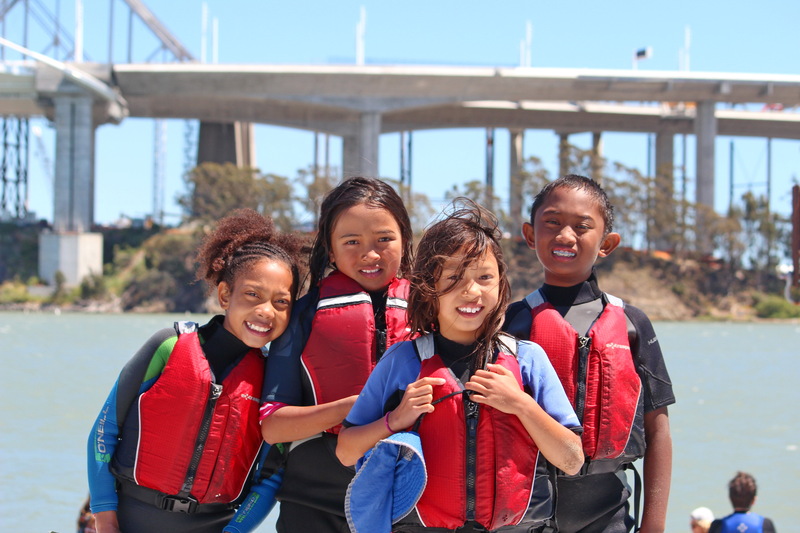 Thank you staff, sponsors, volunteers and Mother Nature for providing free sailboat rides & paddling on protected waters, fun, games and free life jackets. Planning and promotion starts months in advance. Then our trusty army of 50-plus volunteers starts arriving Friday afternoon, early Saturday morning and stay well past closing. 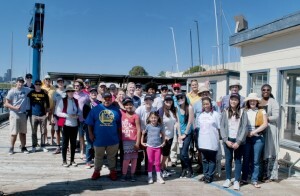 Opening day would not be possible without volunteers from the Cal Boating team, the Vanguard 15 racers, Envision Academy Sailing Team (E*A*S*T), TISC tenants who helped with set-up & boat driving, and the local Treasure Island community. 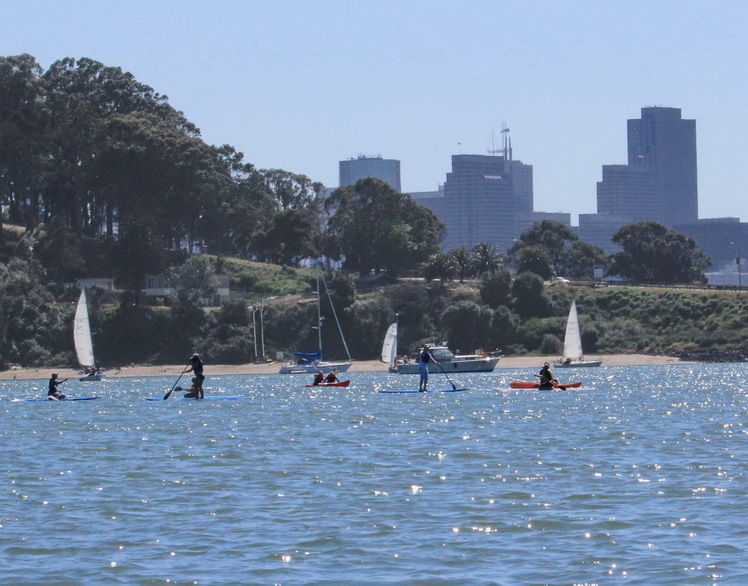 Visitors from all over the Bay Area lined up for the free sailboat, kayak and paddle board rides. 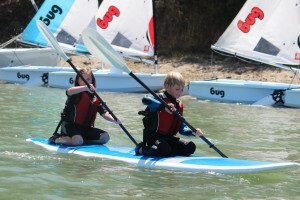 Our fleet of J/24’s, RS Ventures, kayaks and stand up paddle boards were all voted MVP’s of the day. 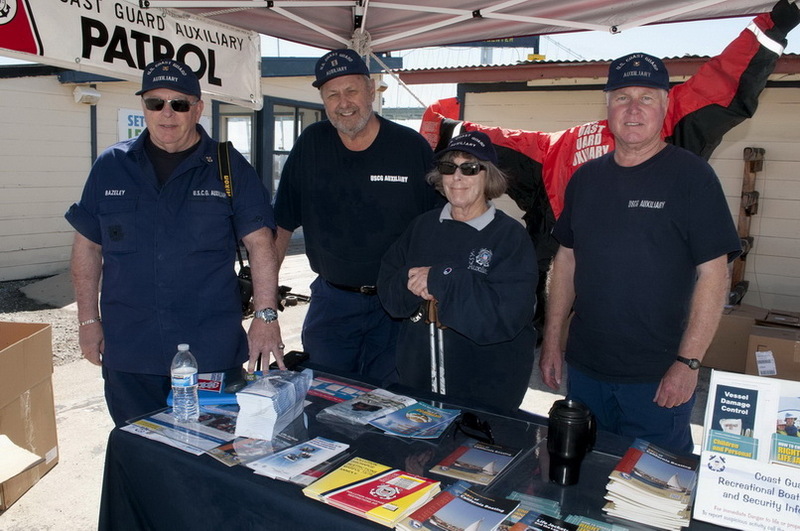 US Coast Guard Auxiliary answered questions and further stressed safe boating. 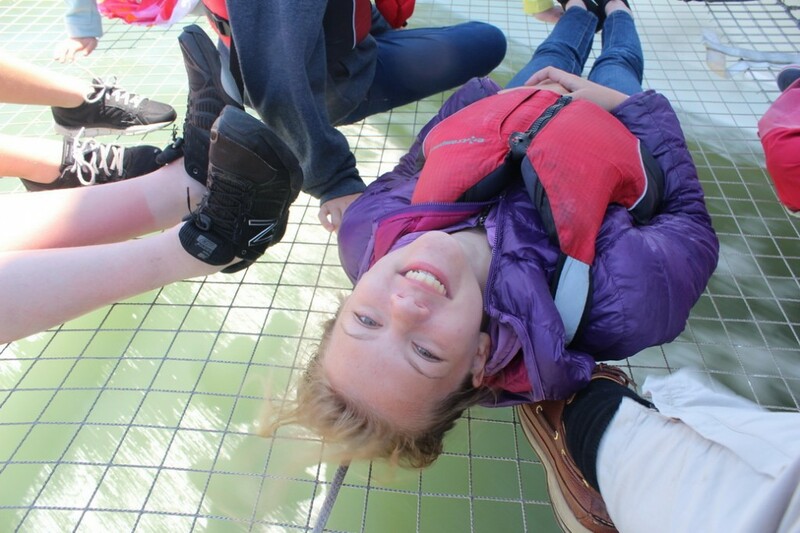 And passed out the free DBW life jackets. 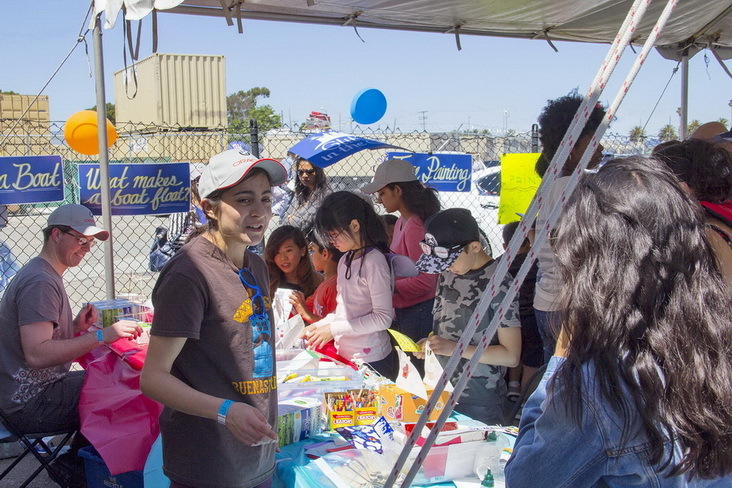 Talented supporting cast from Glitter in the City and TISC volunteers kept kids of all ages psyched and occupied during the day. 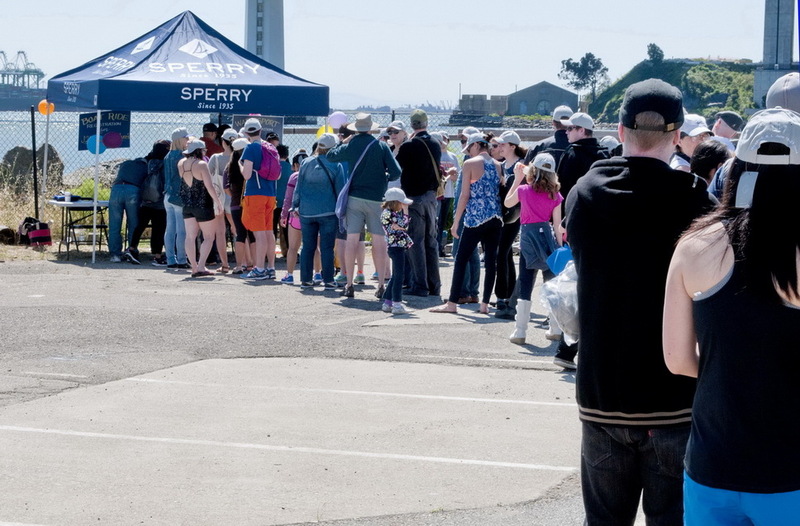 Needless to say Peets Coffee in Berkeley and Beauty’s Bagels in Oakland were morning favorites, while Adam’s Grub Truck was the preferred afternoon stop for many hungry sailors. 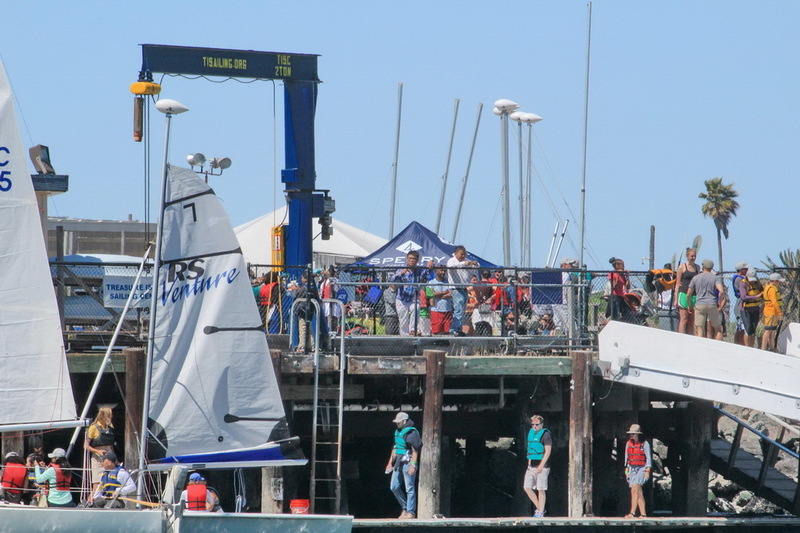 Clipper Cove is the only venue in San Francisco Bay that can host events like this because of the steady winds, protected space, lack of current and easy water access via docks and ramps. It’s no wonder nearly 4,000 children, youth and adults sailed or paddled on Clipper Cove last year. 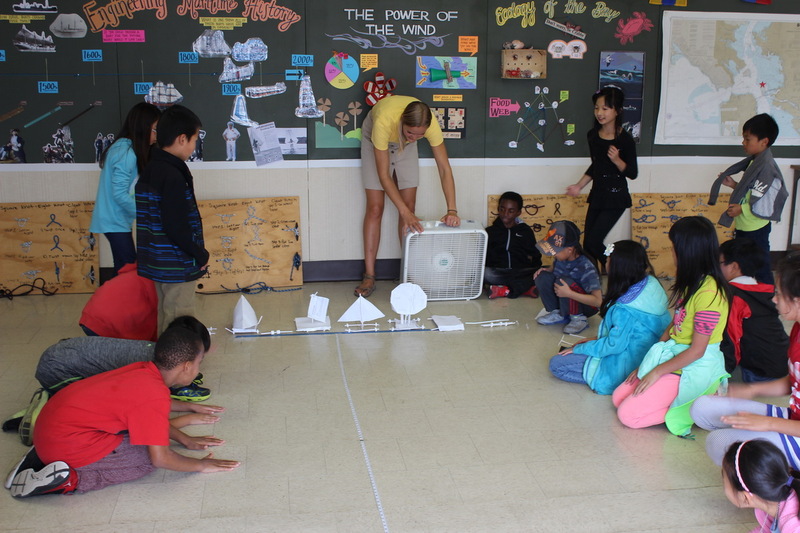 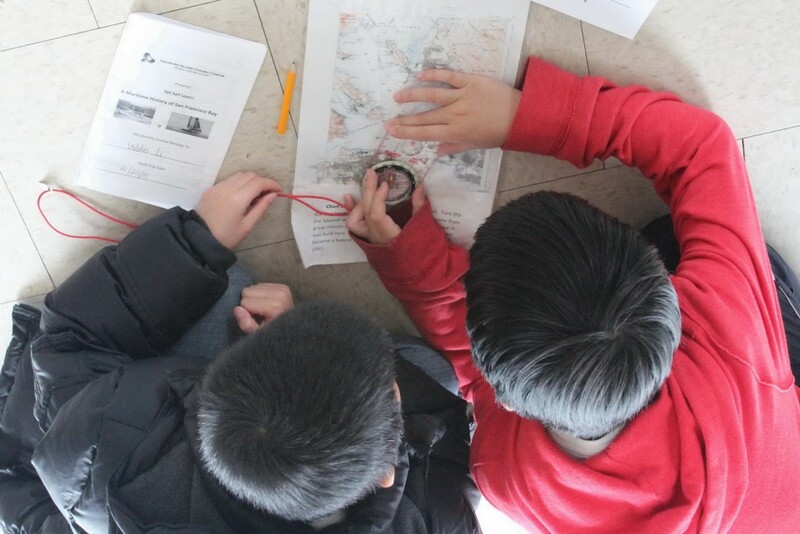 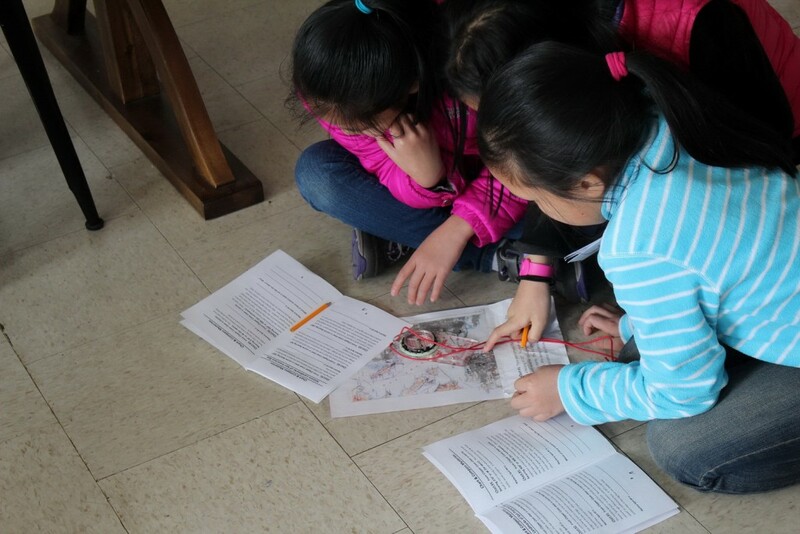 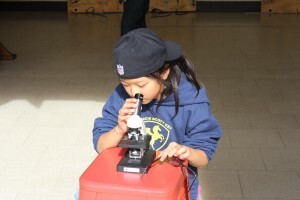 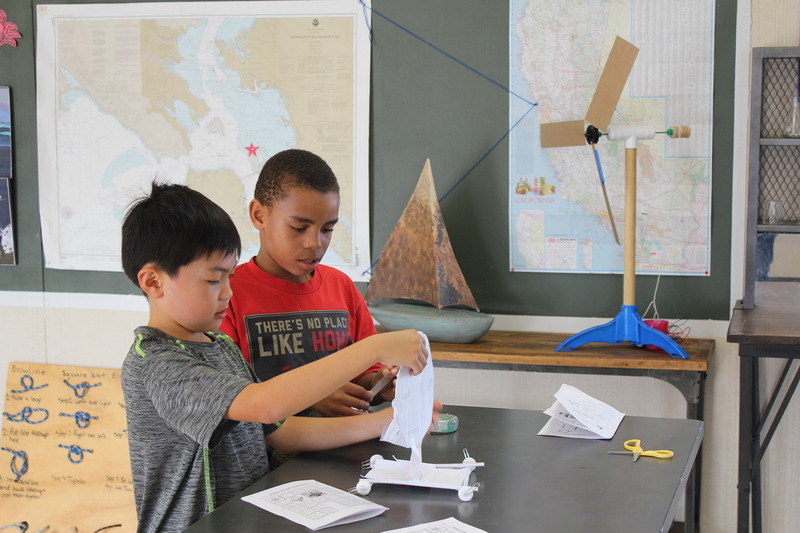 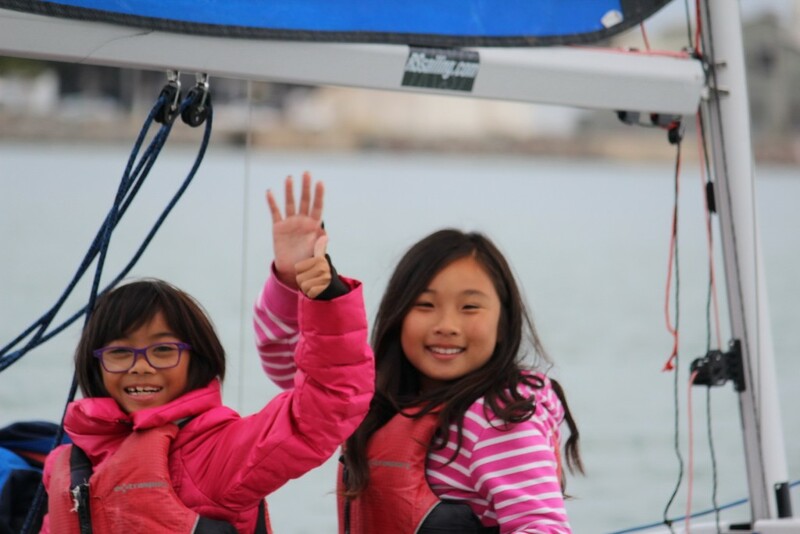 This number 1,338 San Francisco 4th graders who took part in 51 TISC-sponsored hands-on STEM classes plus sailing in RS Ventures during 2015 (since Fall, 2013 SSL inception, TISC has sponsored 3,566 students in 135 classes from 31 SFUSD elementary schools). 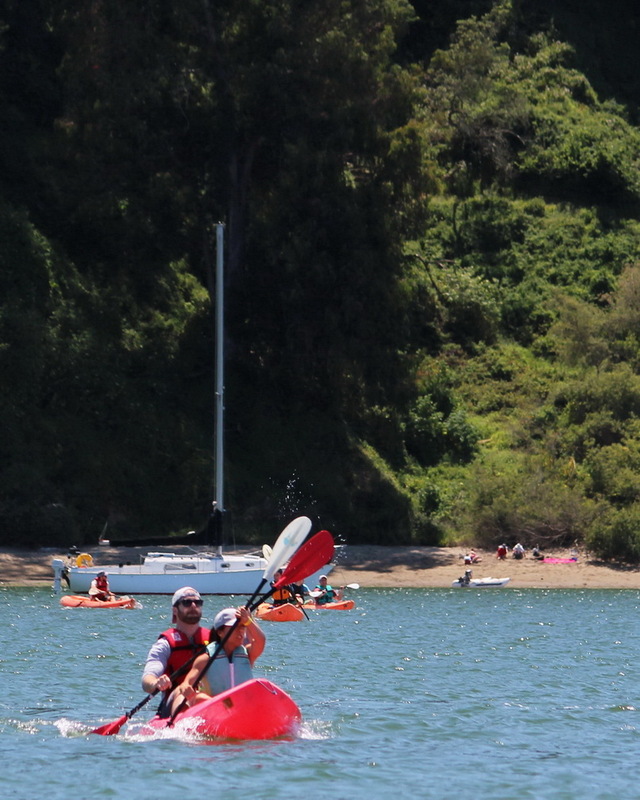 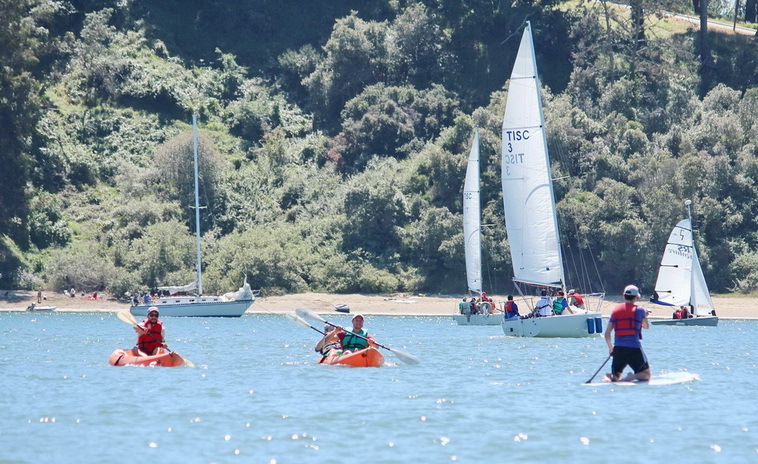 On this picture perfect day all areas of the cove provided a fun, safe and protected place to sail and paddle. 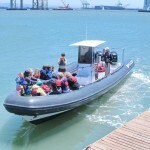 As ideal and safe as Clipper Cove is for our opening day festivities we still had several safety boats on duty. 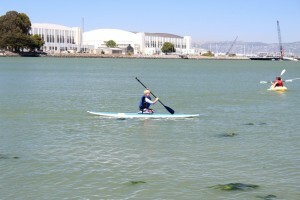 In a few cases even the light winds lead to a few paddlers “calling for a taxi”. 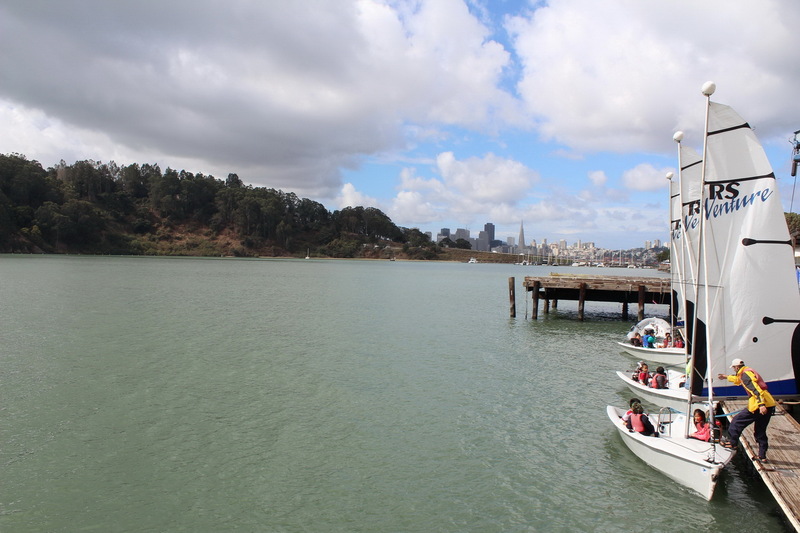 I didn’t see much traffic to and from the marina, however the boats I did see were careful and respectful of the smaller craft that dotted the cove. 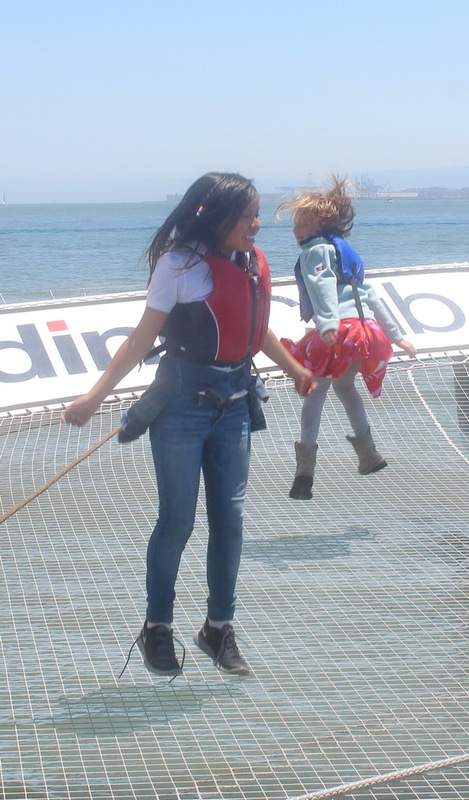 Not everyone was ready for getting out on the Cove, and our team had plenty of fun and games lined up for the future sailors. 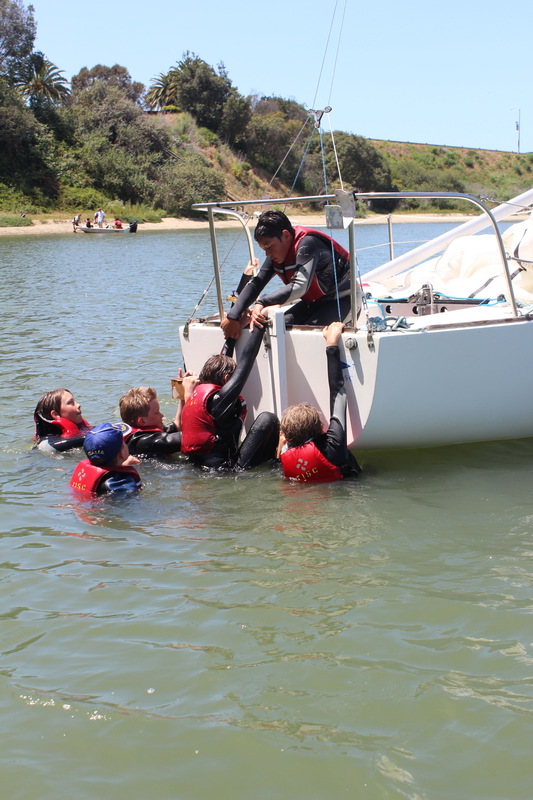 Which is not to say kids were left ashore. 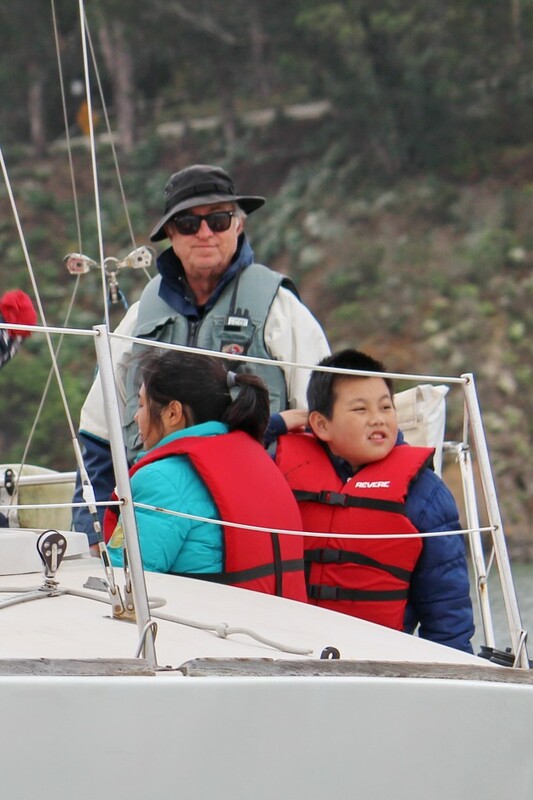 To the contrary they were focused and engaged in all points of sail (including the very active 2 year-old who triggered our man-overboard drill when he threw his dad’s new hat overboard). 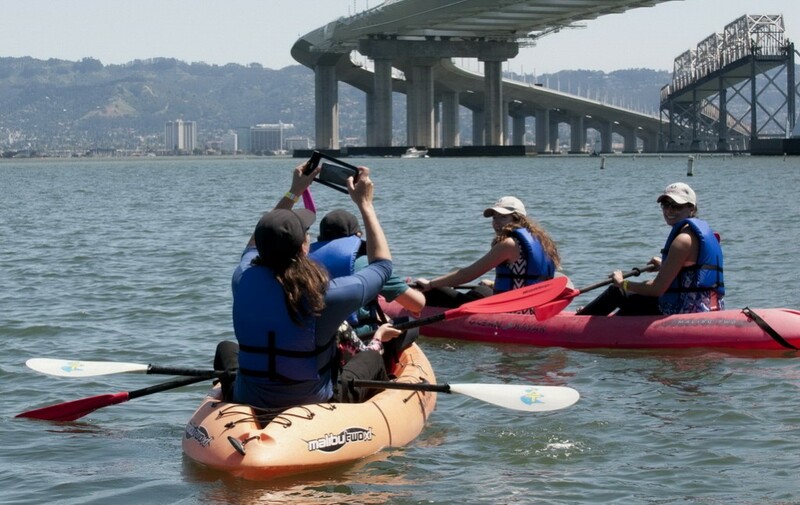 Based on the many phones and cameras I saw, I’m guessing Facebook, Twitter and Instagram had plenty of action from our visitors. 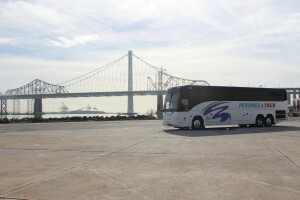 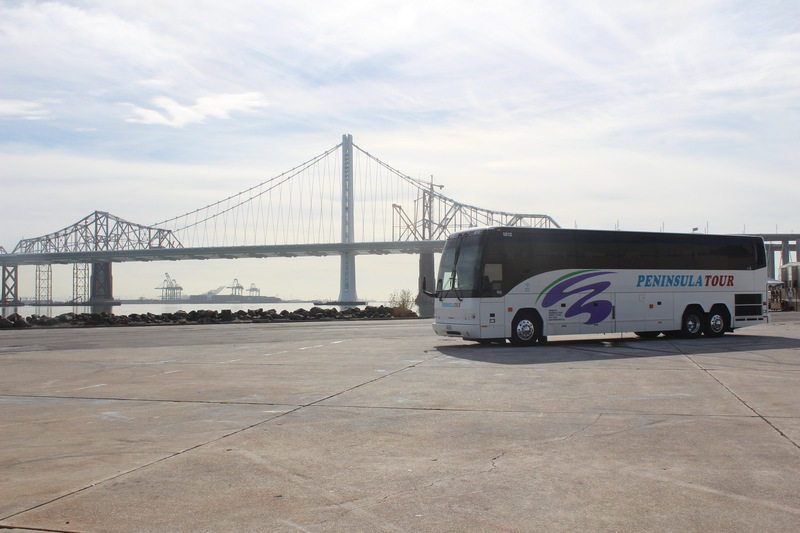 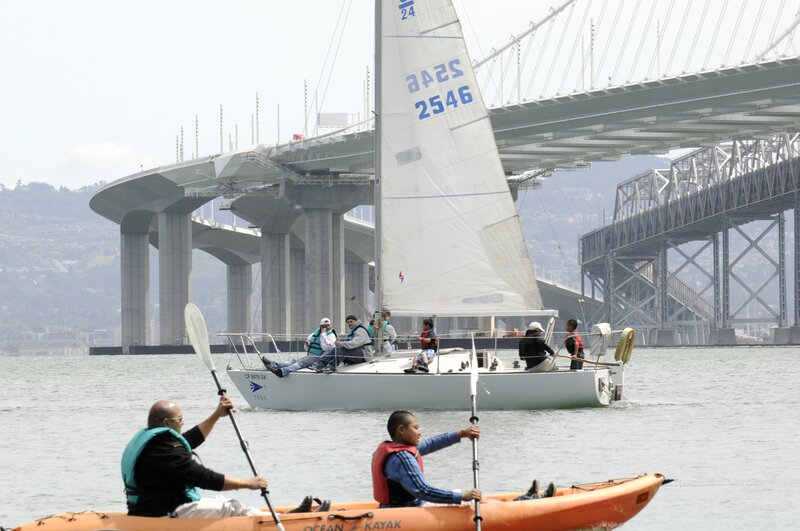 Clipper Cove is a great place to admire the new Bay Bridge. 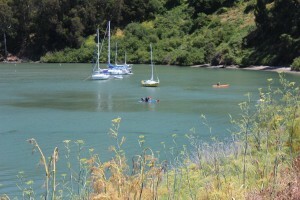 Hard to see in the above photo, however the eastern area of the cove is very shallow before getting much deeper as you depart the cove and head to the flats. 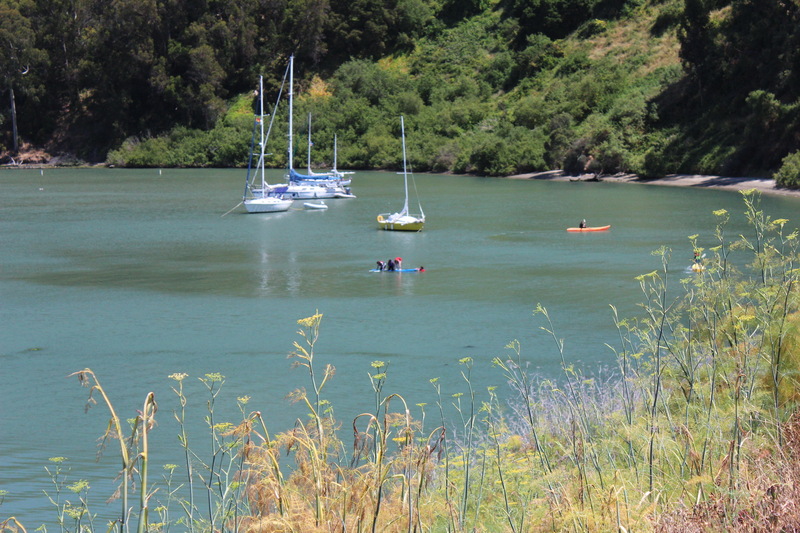 And this bottom bathymetry is exactly what keeps the high currents out of the cove. So another TISC Opening Day is on the books. 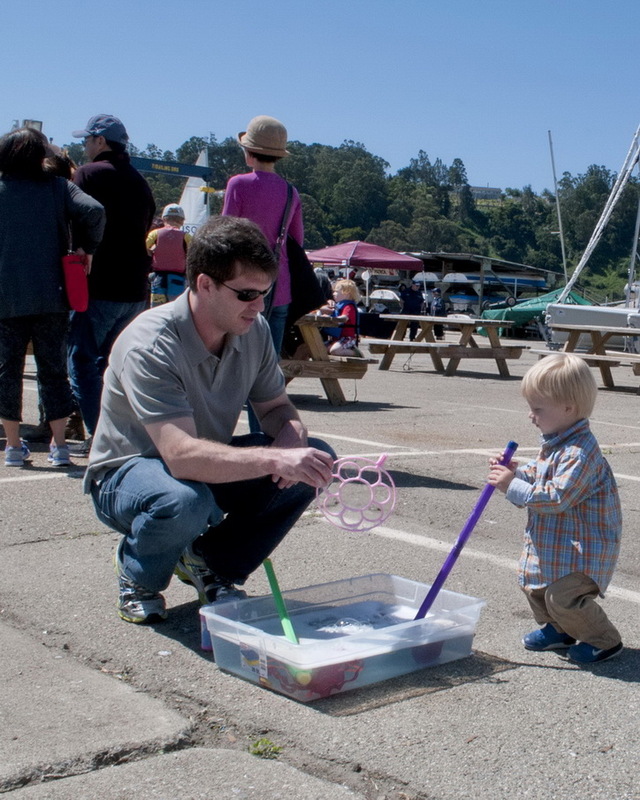 Now YOUR family’s fun can begin. 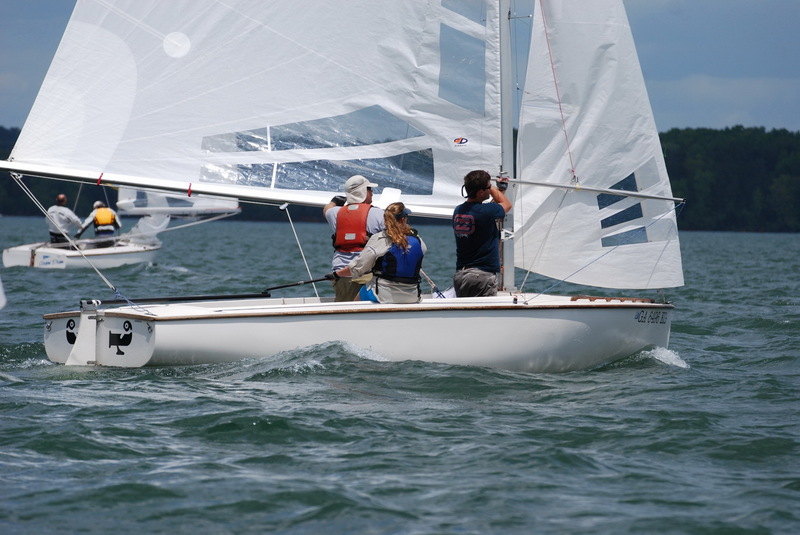 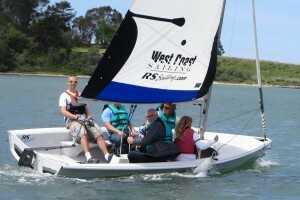 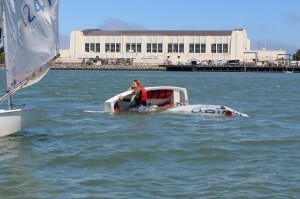 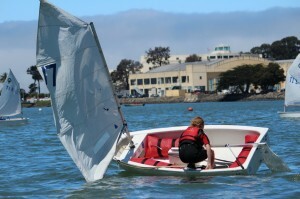 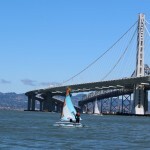 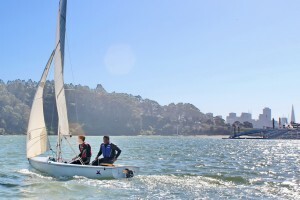 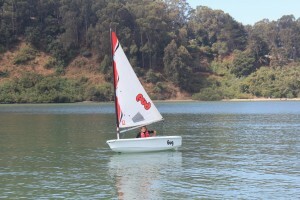 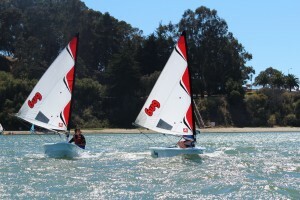 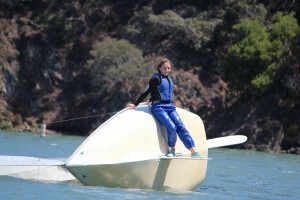 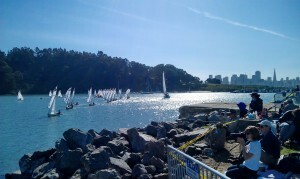 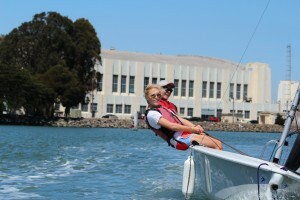 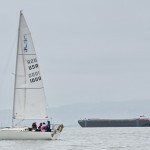 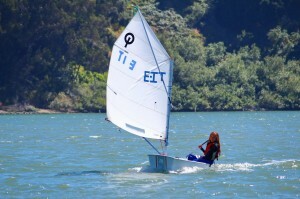 Here’s the link with an overview of the many classes offered by Treasure Island Sailing Center: http://tisailing.org/basics. 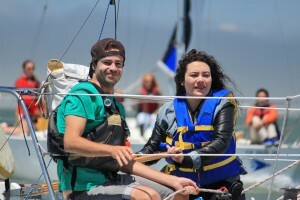 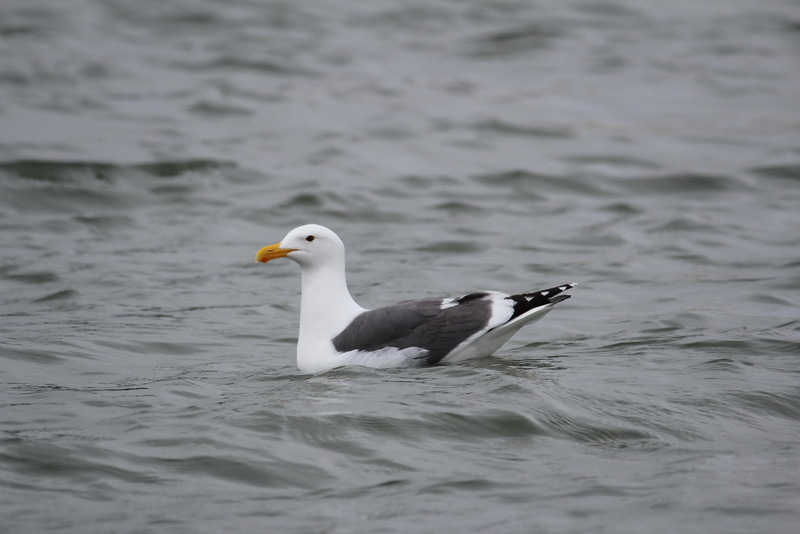 And as you head out onto California waters this summer, WEAR YOUR LIFEJACKET. 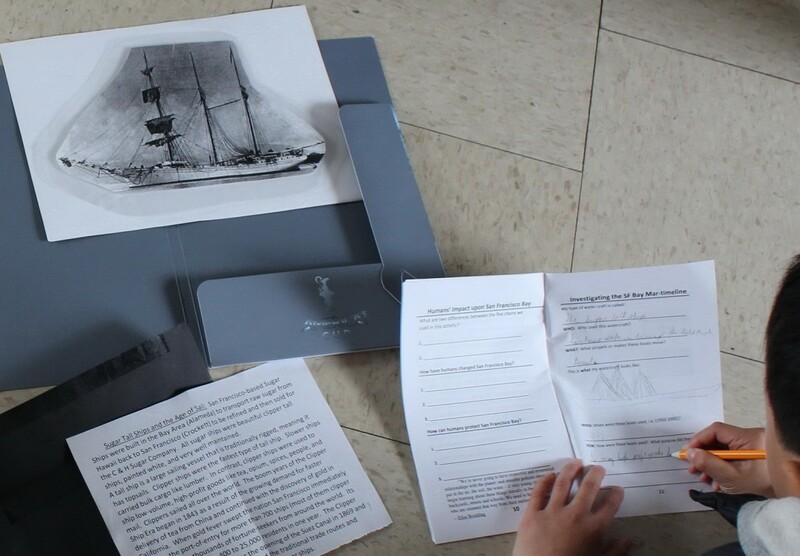 PS – A special tip-of-the-hat to Valerie Santori and Andrew Shaw for many of the photos in this blog post. 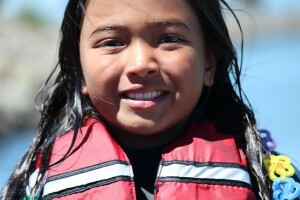 Here is a fun, interactive page your kids can use in the car on the way to their favorite water spot: http://www.dbw.ca.gov/AquaSmart. 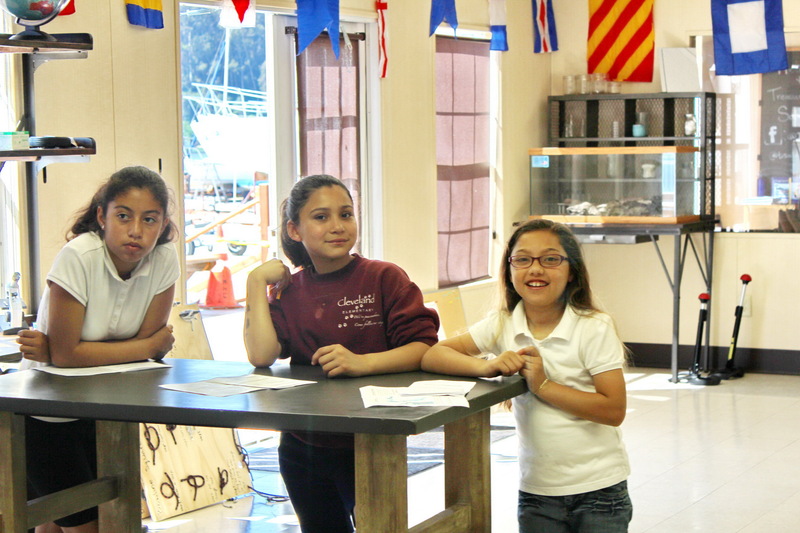 The kids from Jefferson Elementary studied Marine History and smiled a lot. 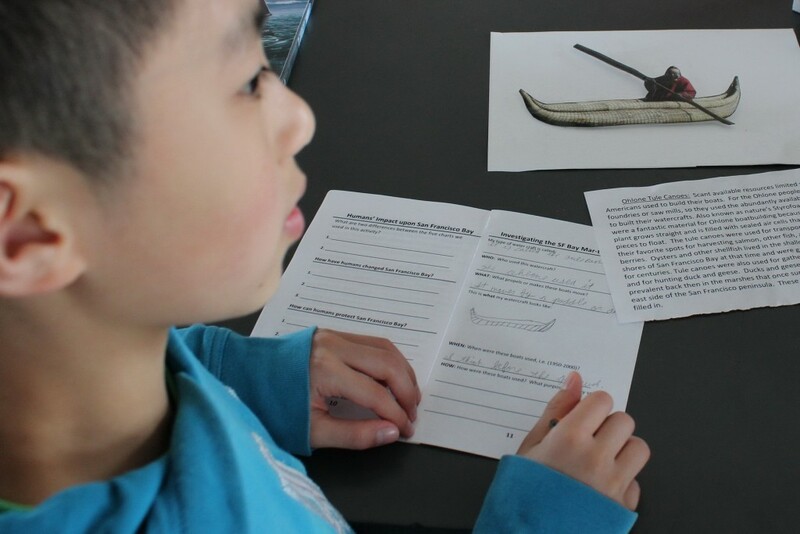 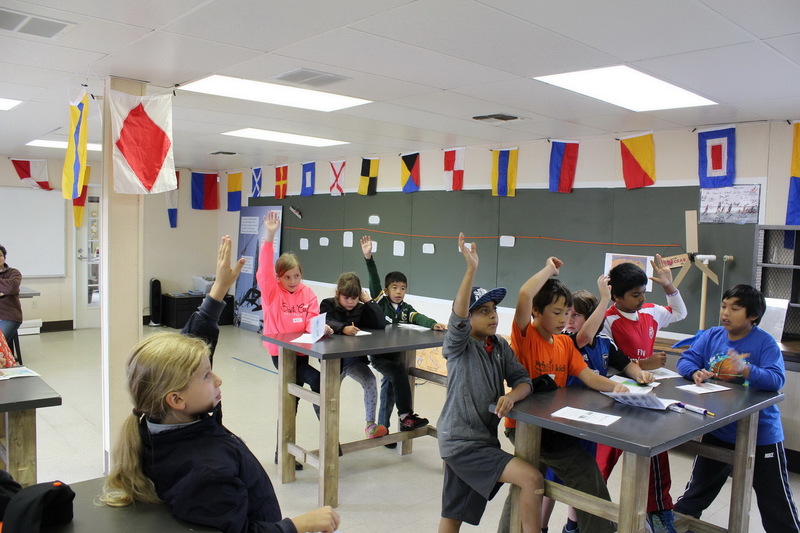 Their comments and questions about sailing and history were engaging and non-stop – in the TISC activity center and while sailing on Clipper Cove. 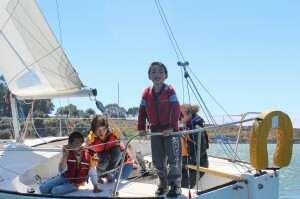 I have a new sure-fire way to select titles for Set Sail Learn blogs – just ask the kids. 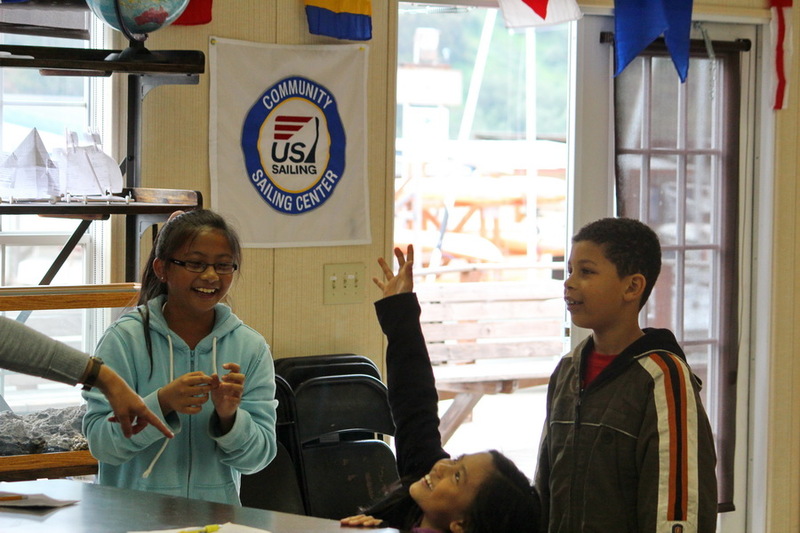 “Can you please give me six words that describe your day here at TISC” usually works like a champ. 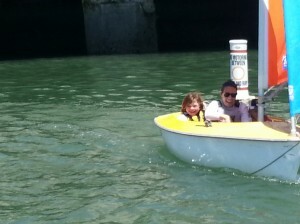 One smiling fourth immediately replied “I got to steer the boat.” Bingo- blog title. 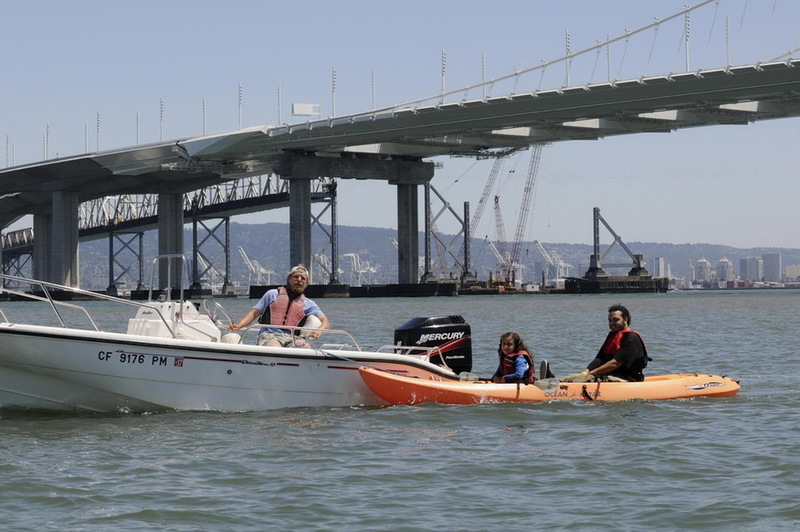 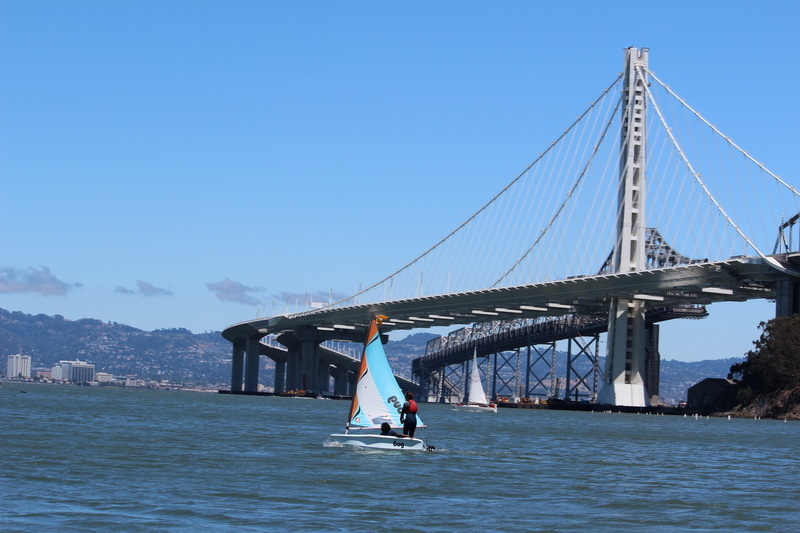 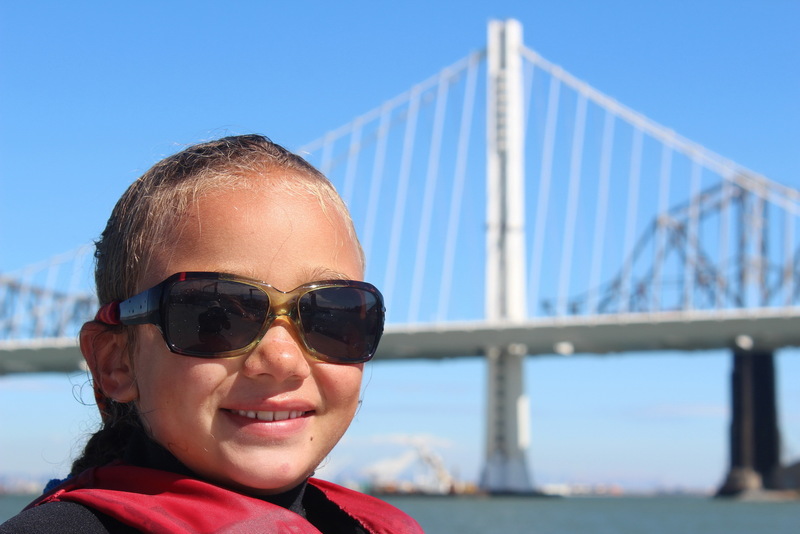 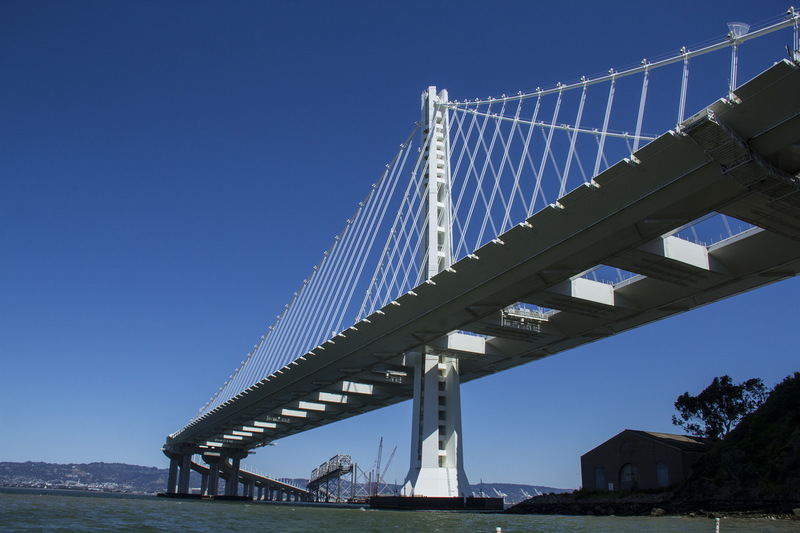 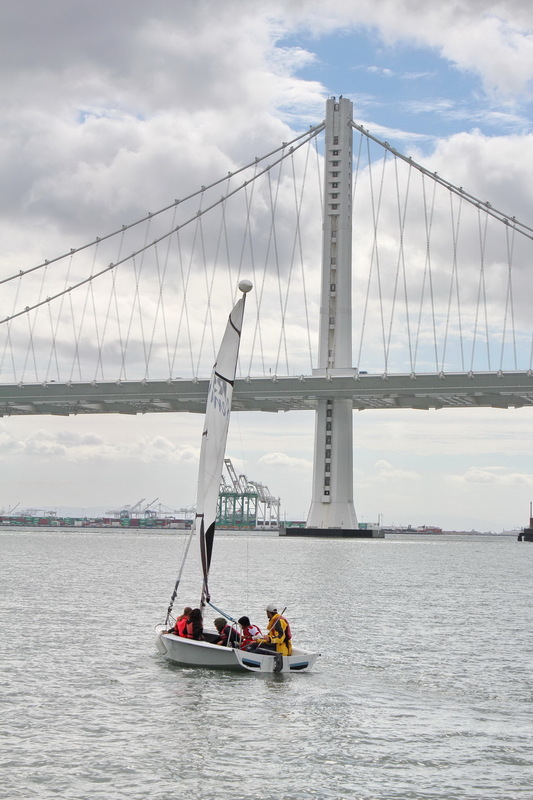 Always nice to see self-confidence in so many kids who in general have not been on San Francisco Bay, certainly have not sailed or actually touched the water and in many cases have not been over the Bay Bridge. 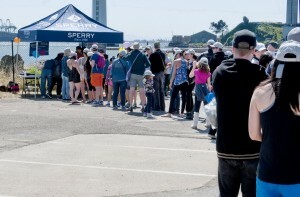 As you can see they were psyched up and ready for the day when they arrived. 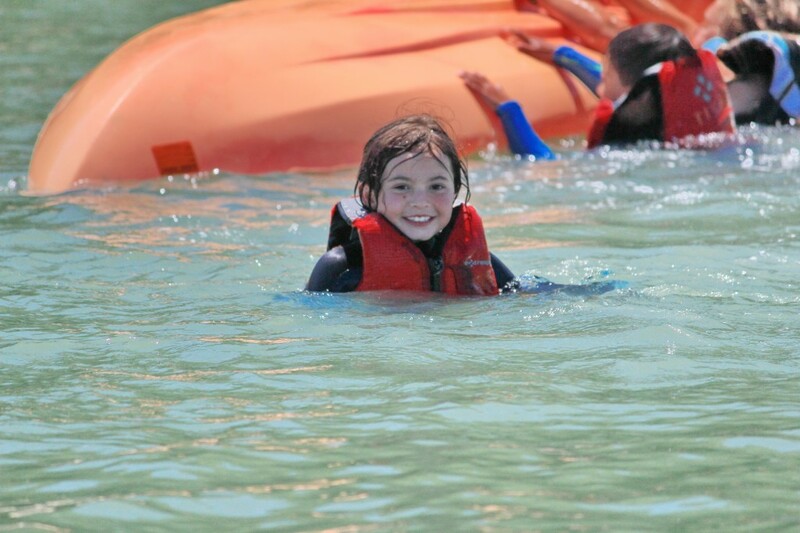 Of course smiling goes both ways – our lead instructor Zoe Wadkins can also light up a room with her smile. 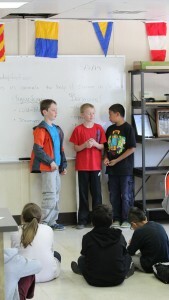 After introduction, paperwork is passed and safety drills are completed. 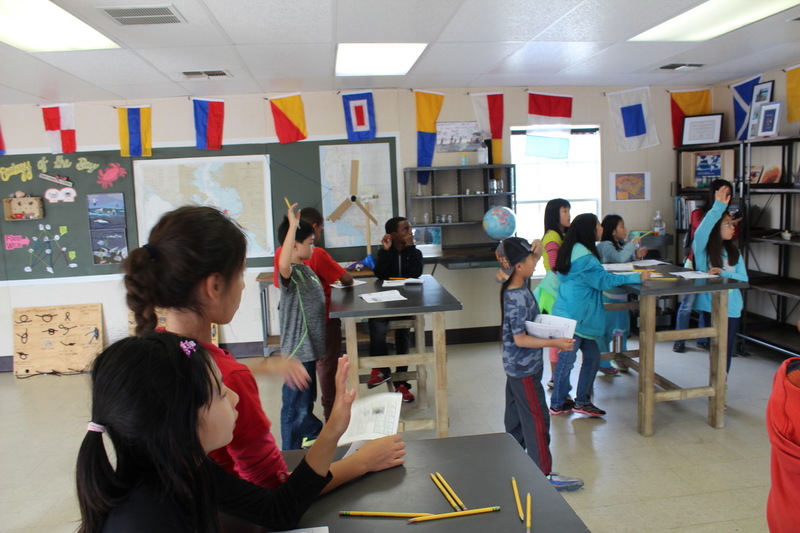 Then kids are split into two groups. While first group departs our dock for Clipper Cove the second spend time in the activity center on the day’s lesson. 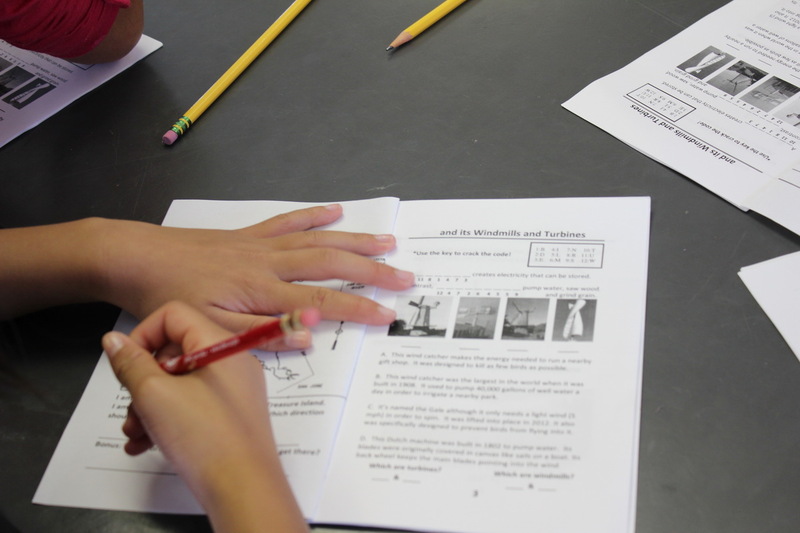 TISC provides workbooks in advance of each class. 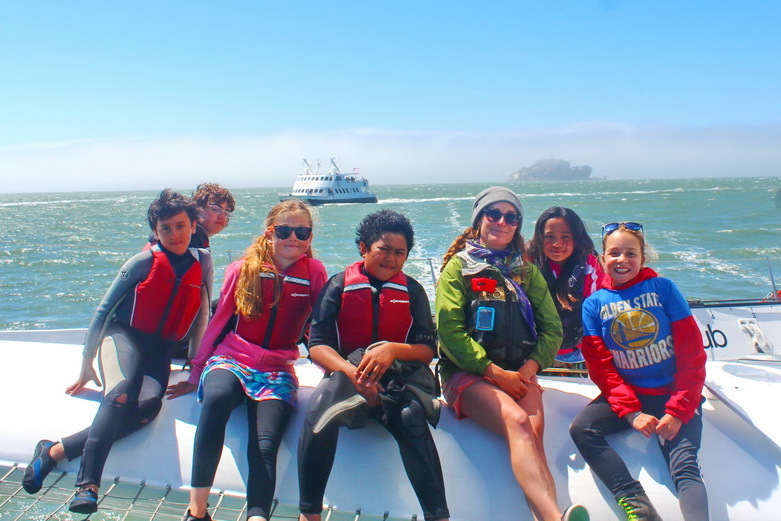 They cover Renewable Energy, Ecology of the Bay or Marine History depending on which curriculum was selected by their teacher. 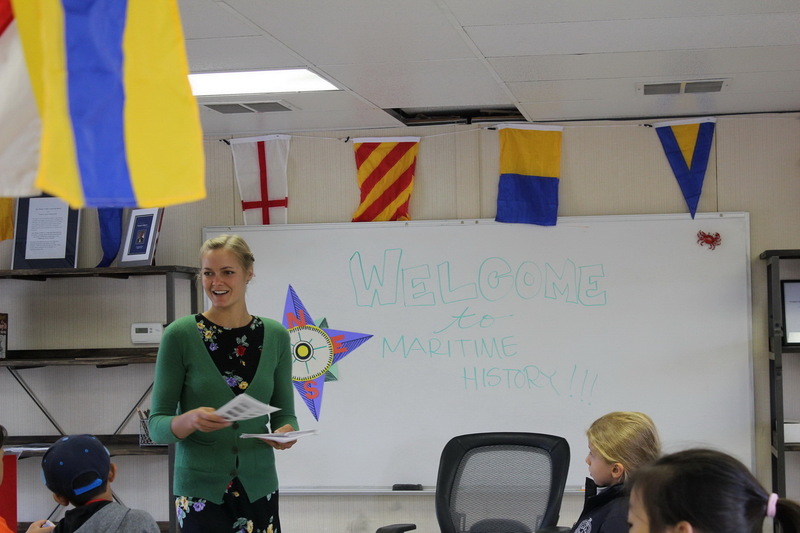 Jefferson selected Marine History. 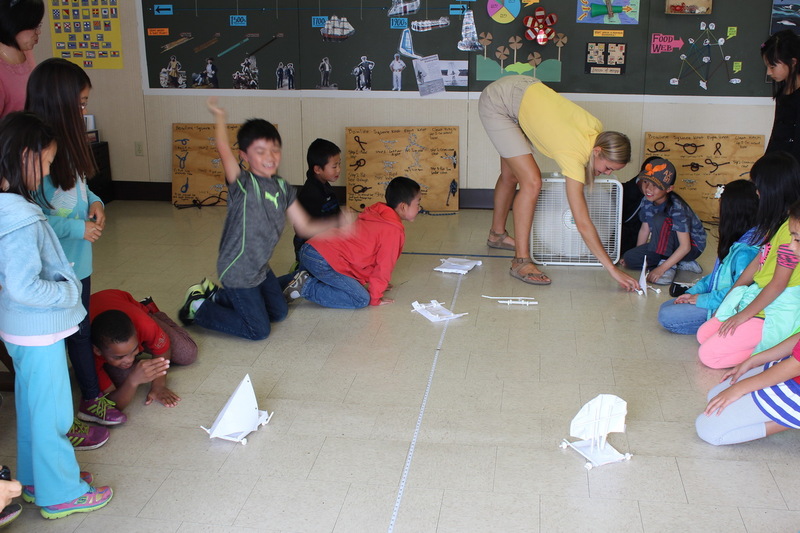 We used the term “activity center” or “learning center” to describe the inside space where SSL and other classes meet. 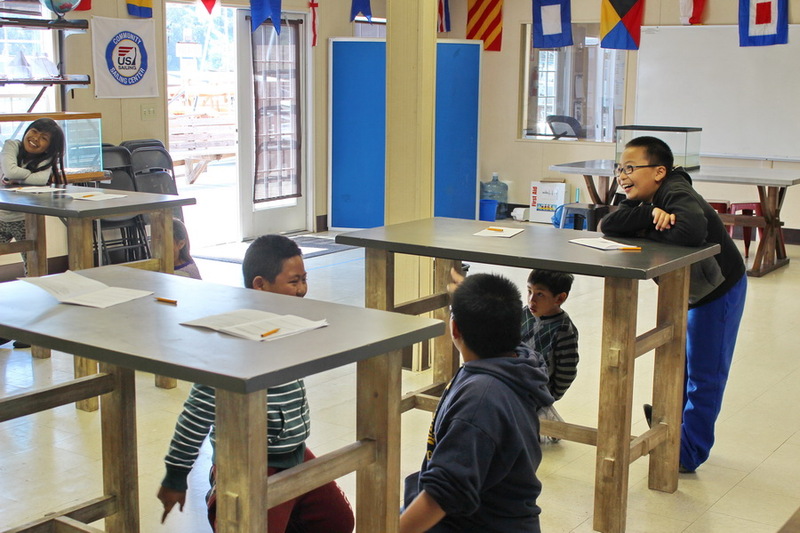 Classroom seems too formal, we have stand-up tables not desks, and sitting down is not part of our curriculum. 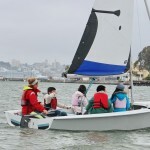 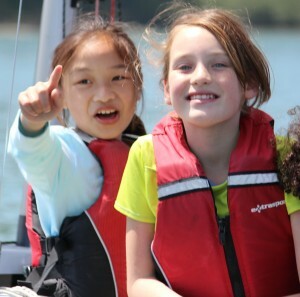 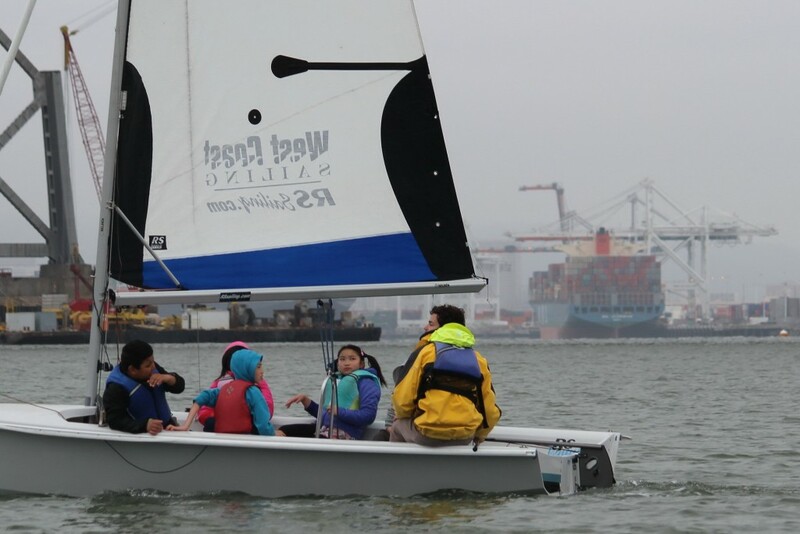 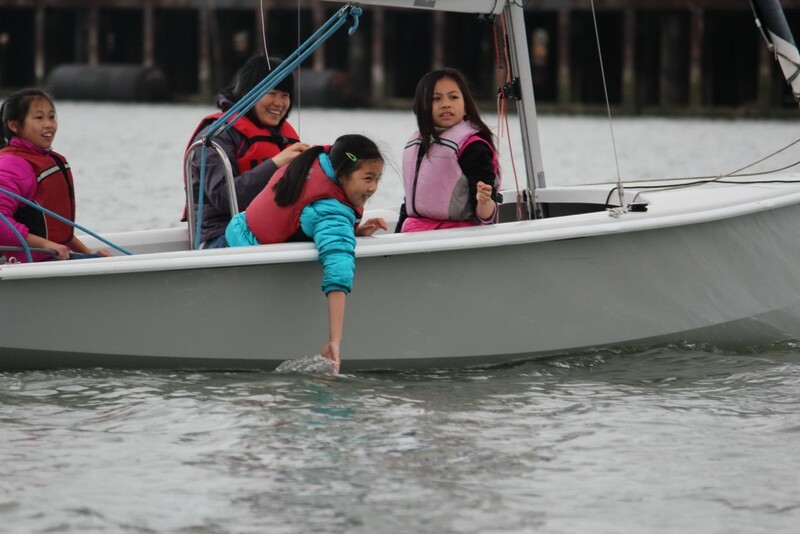 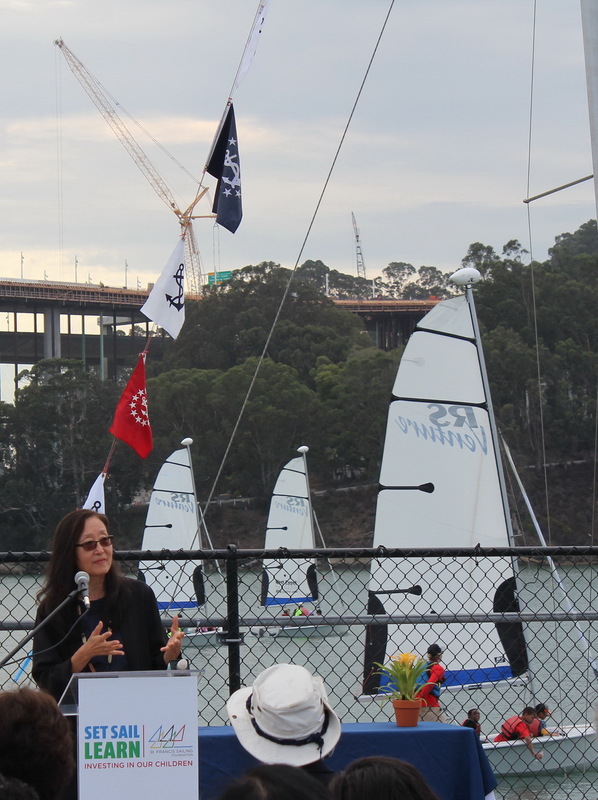 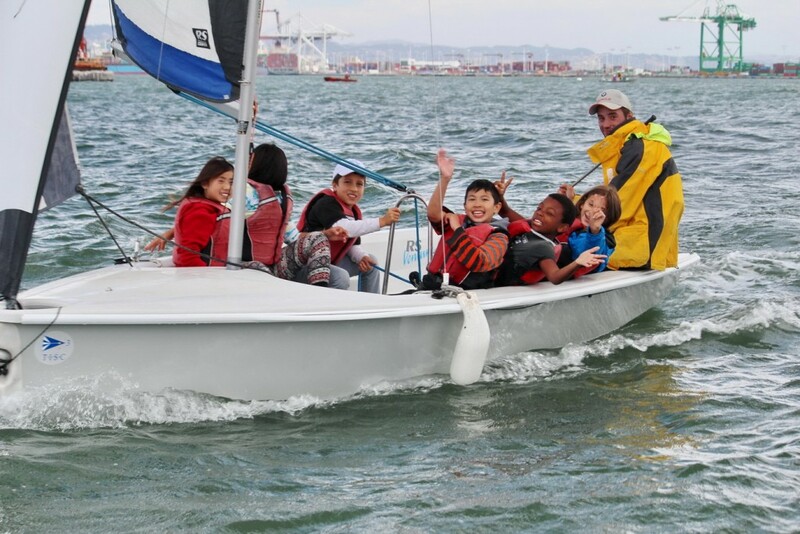 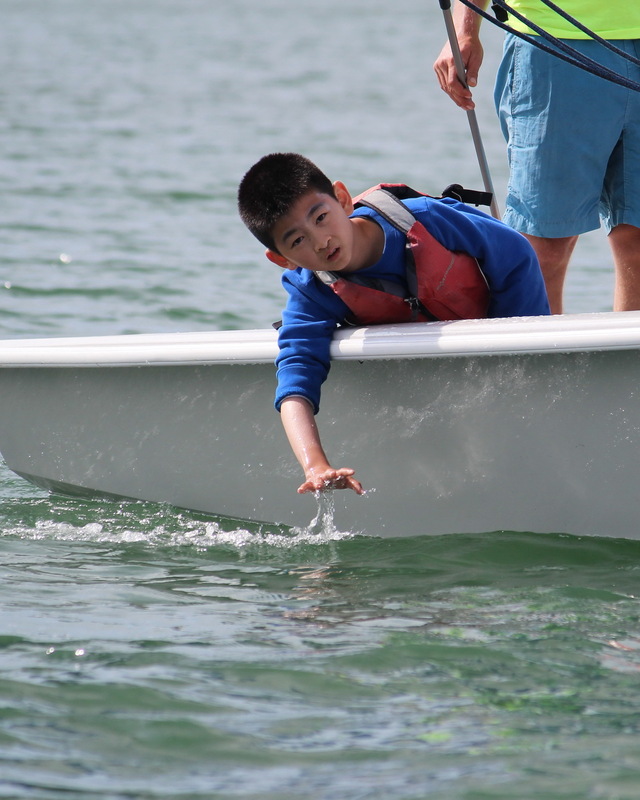 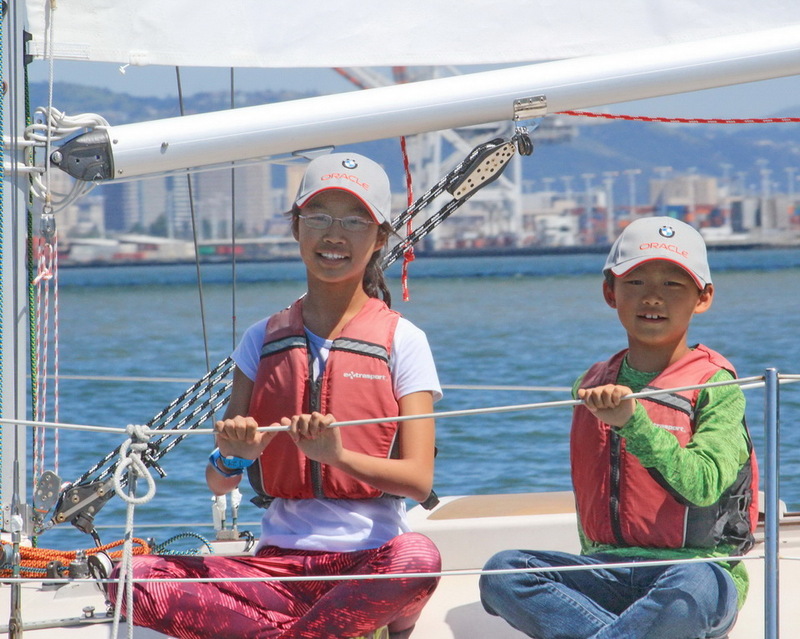 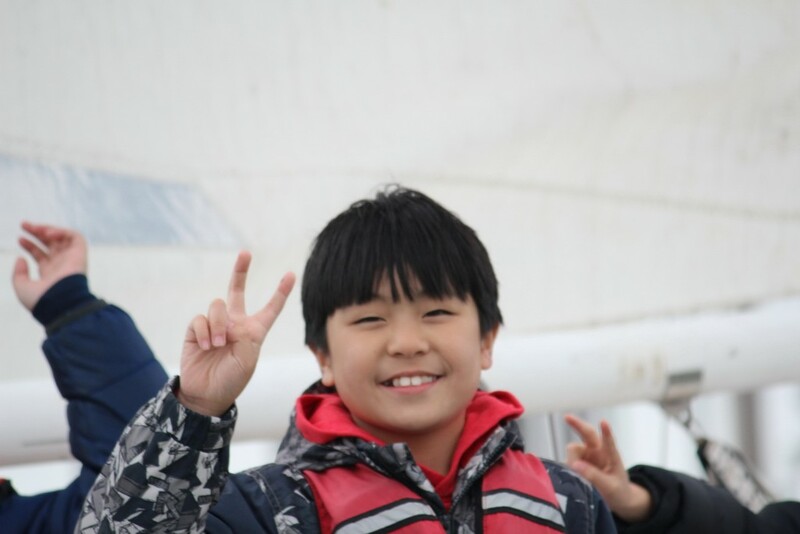 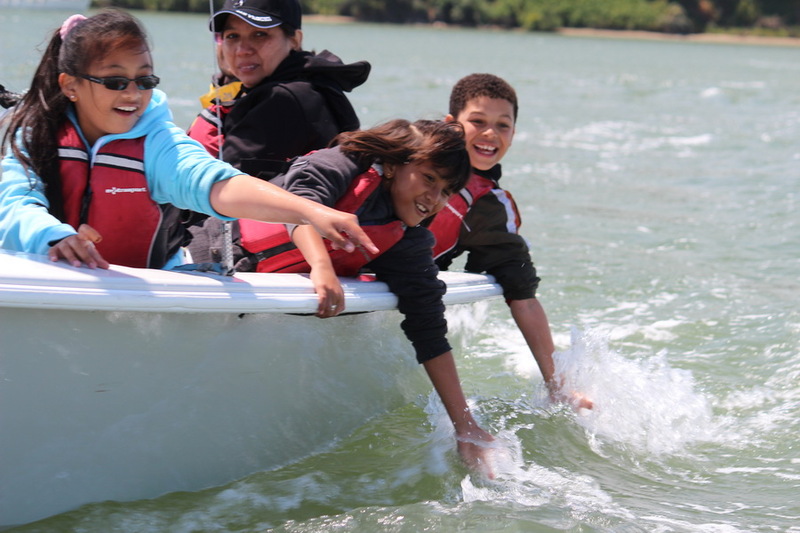 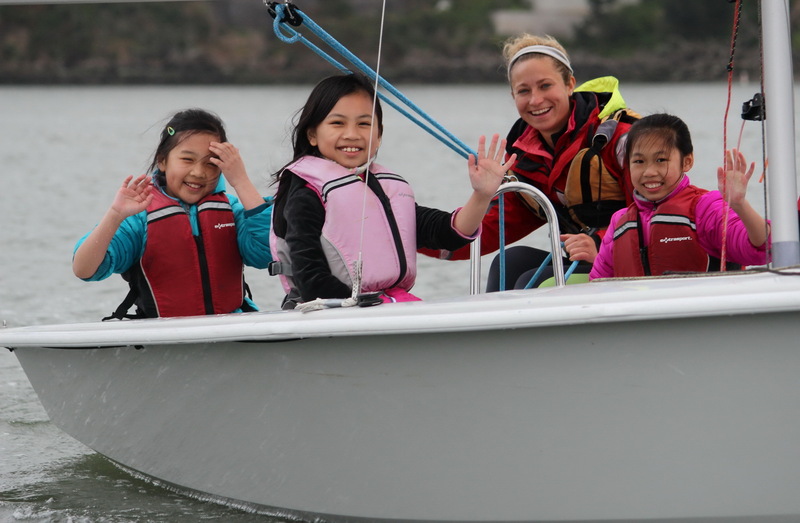 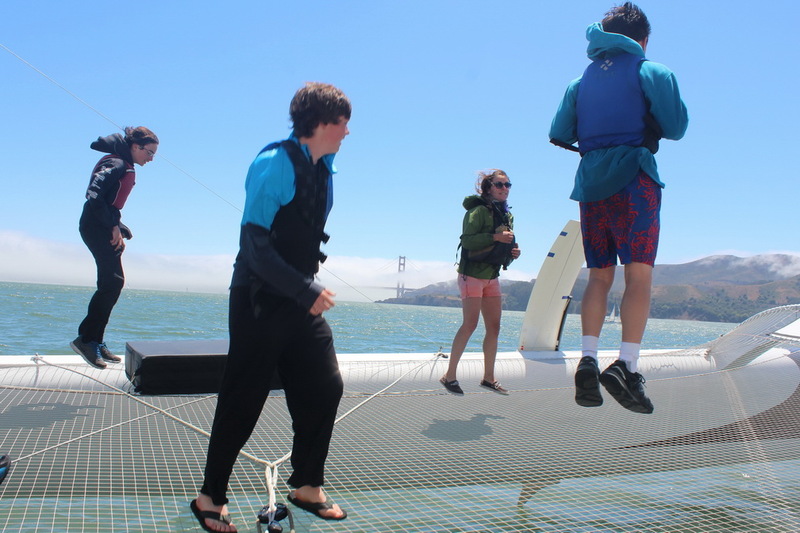 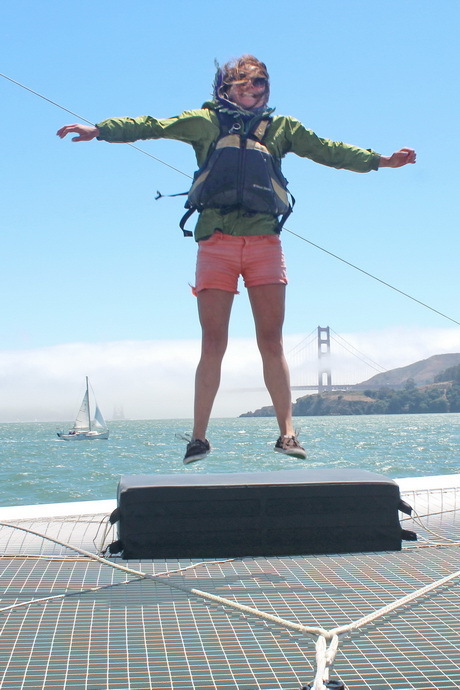 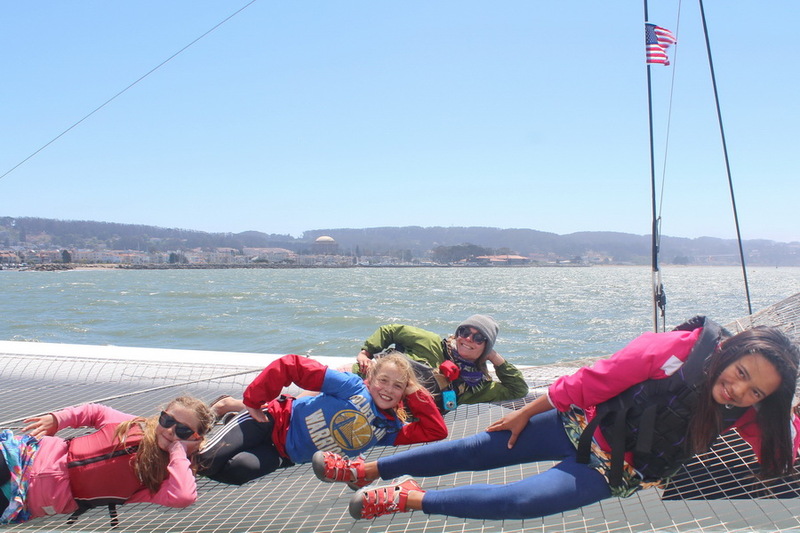 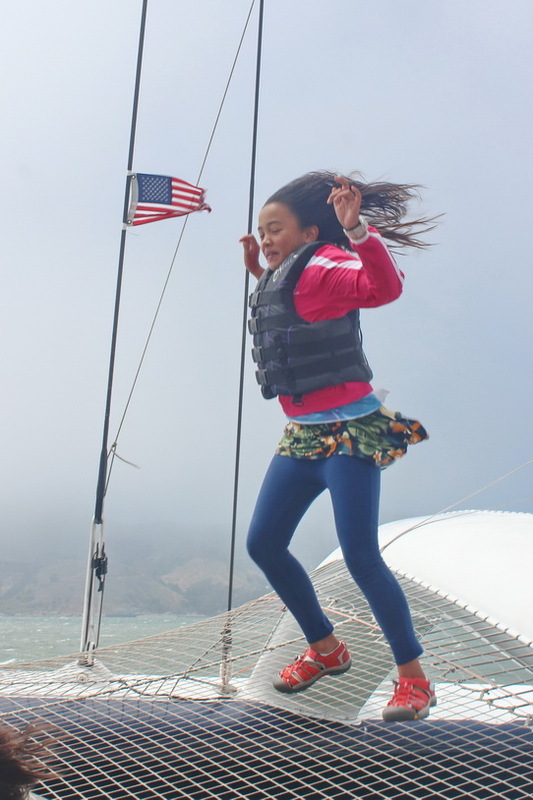 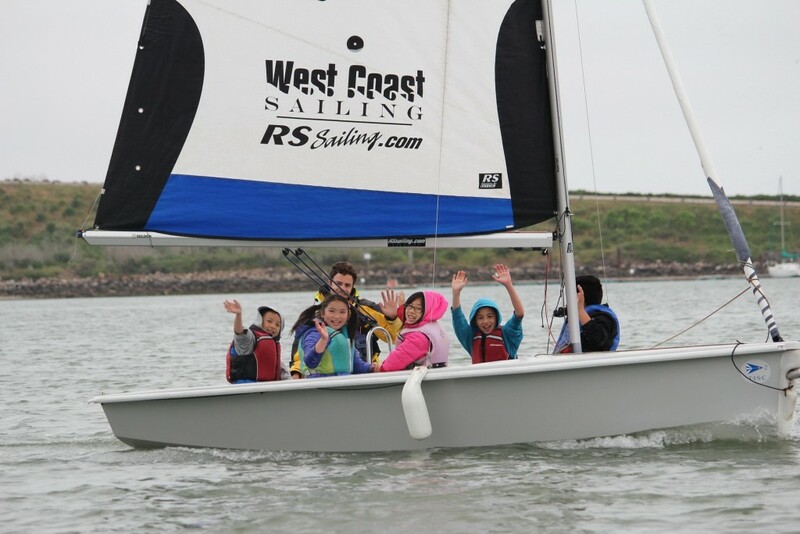 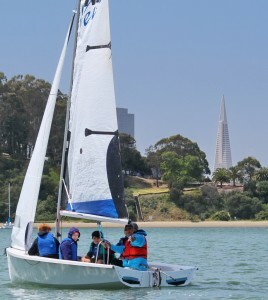 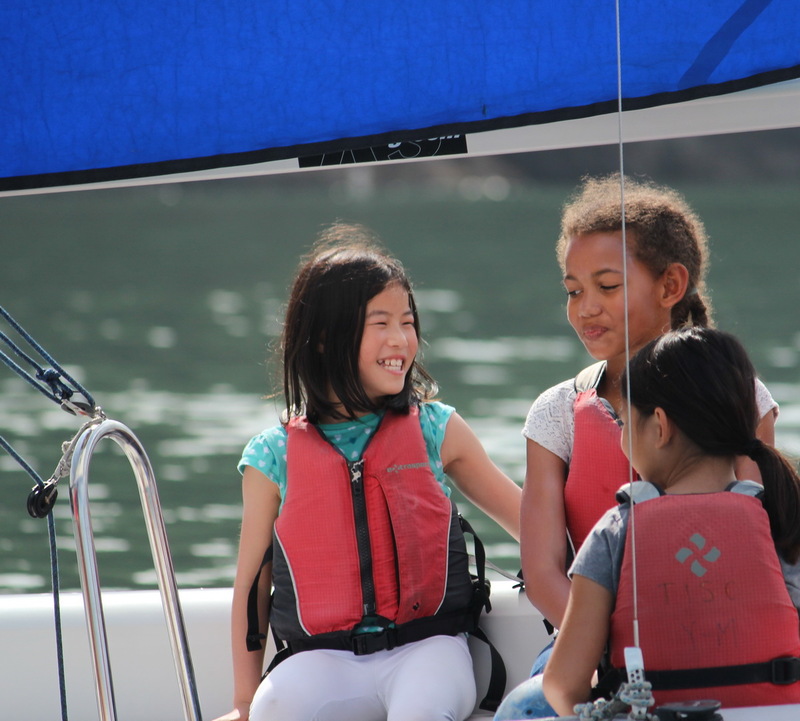 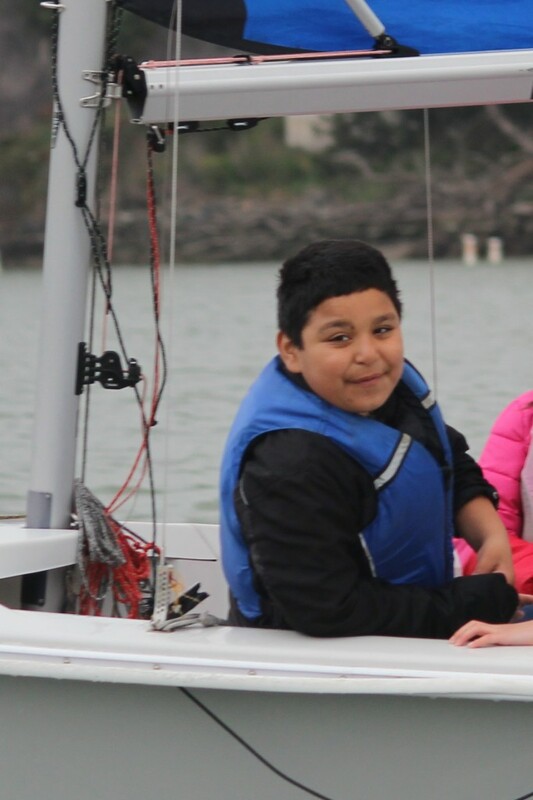 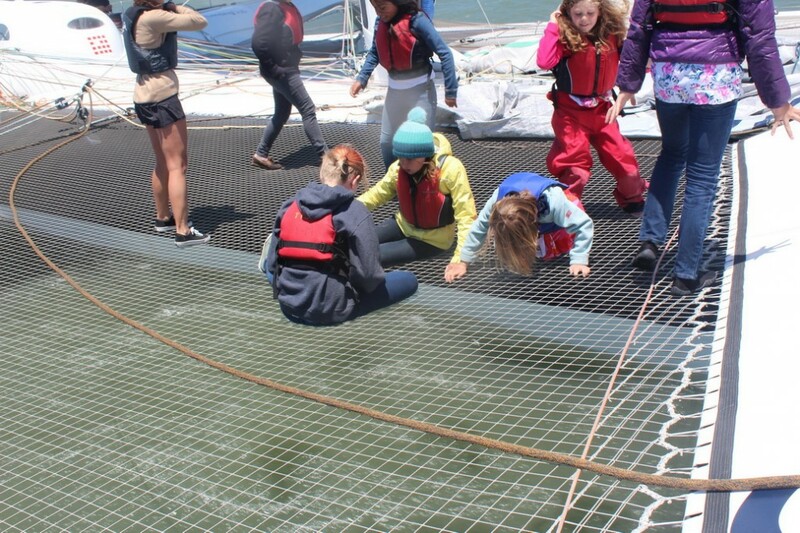 Sailing on Clipper Cove provides SFUSD fourth graders the opportunity to touch the water, feel the wind, and truly connect to our environment. 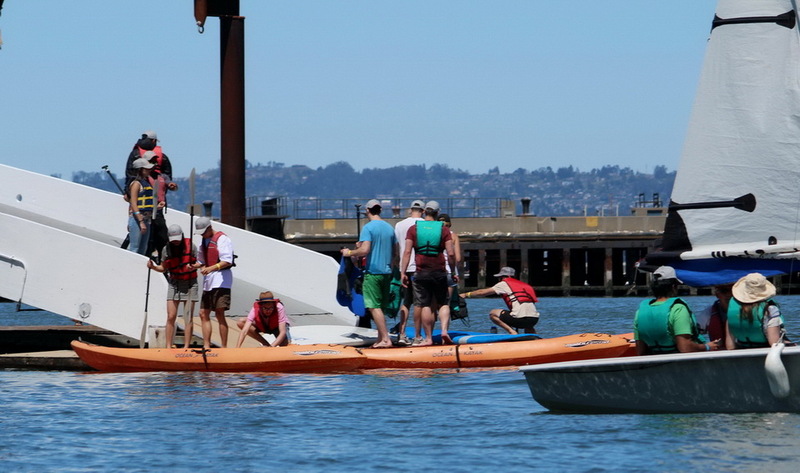 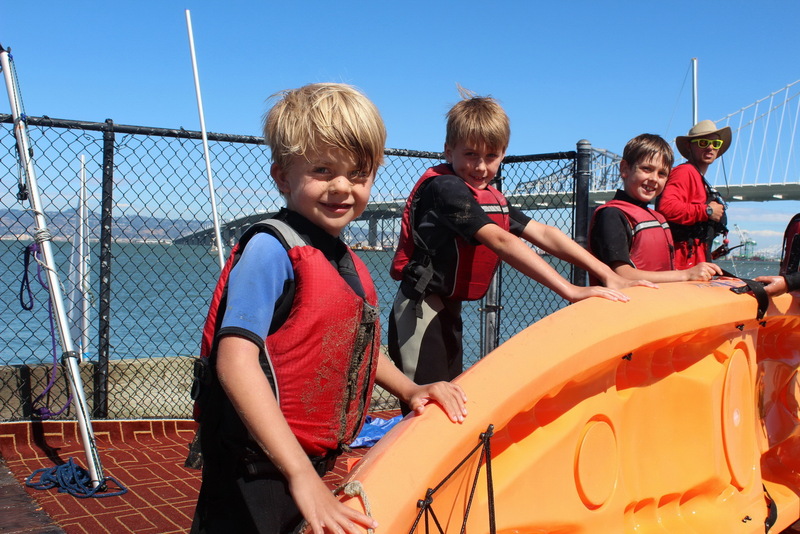 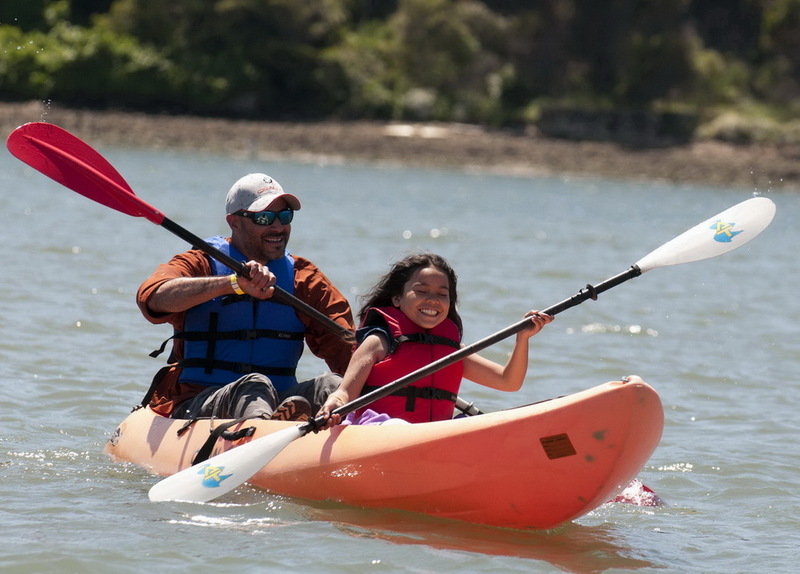 We feel this type of hands-on is one of the best ways to instill stewardship into the minds and bodies who will one day bring their families sailing and boating on Clipper Cove, SF Bay and other great playgrounds. 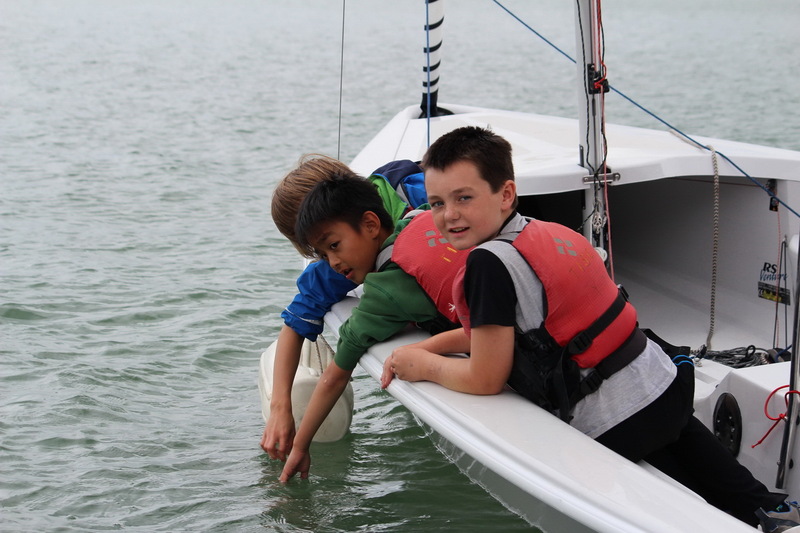 Kids study wind, tides and currents while out on the RS Ventures. 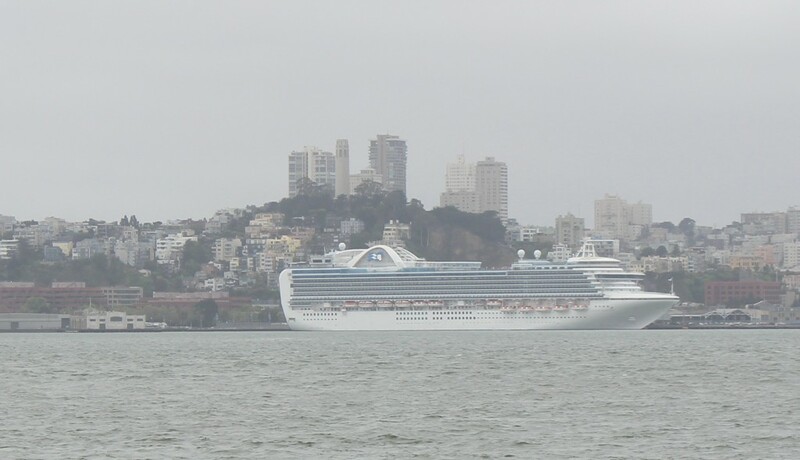 Centrally located, Clipper Cove provides views of key landmarks in all directions. 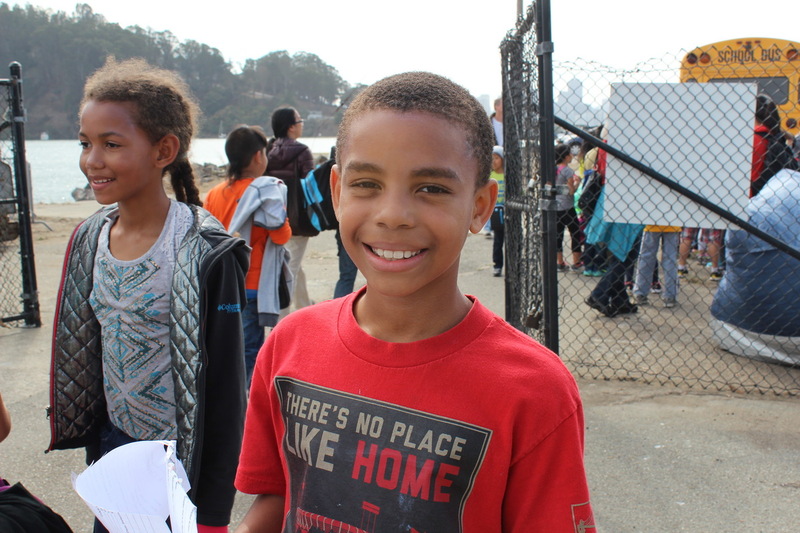 These fourth graders may some day attend UC Berkeley and look up at the iconic clock tower. 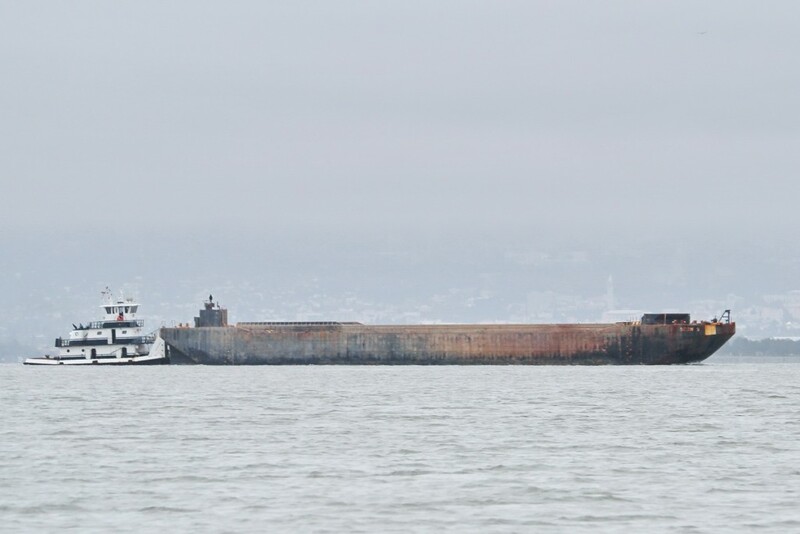 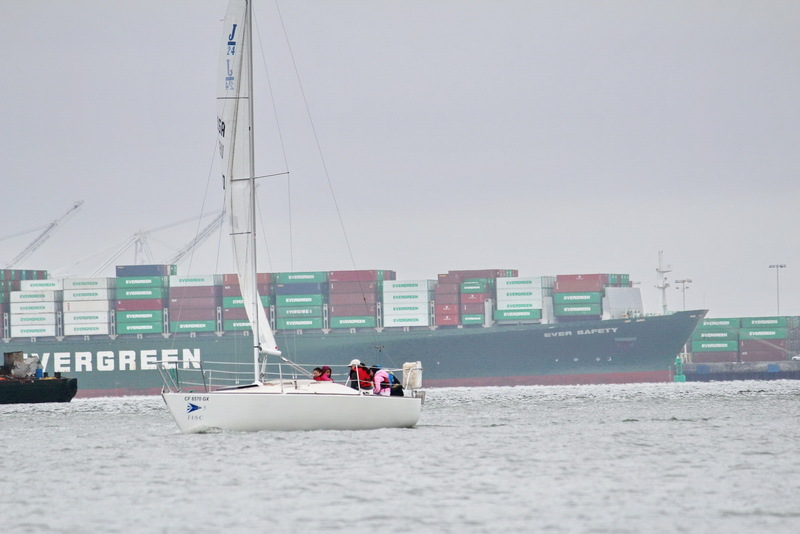 Or they may sail down to Alameda and see the massive container ships being unloaded. 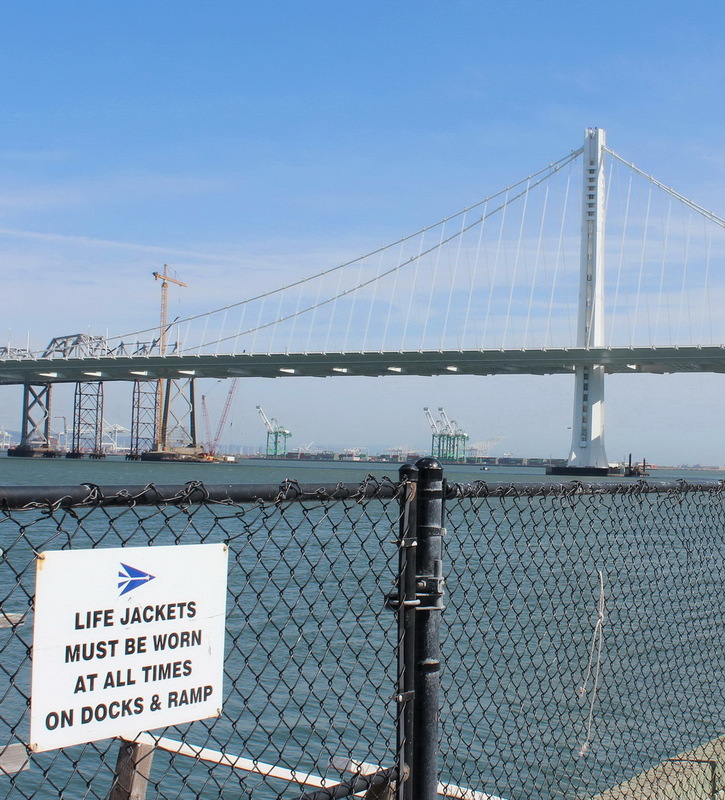 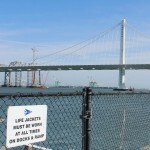 The huge Bay Bridge tower is clearly visible from the TISC dock. 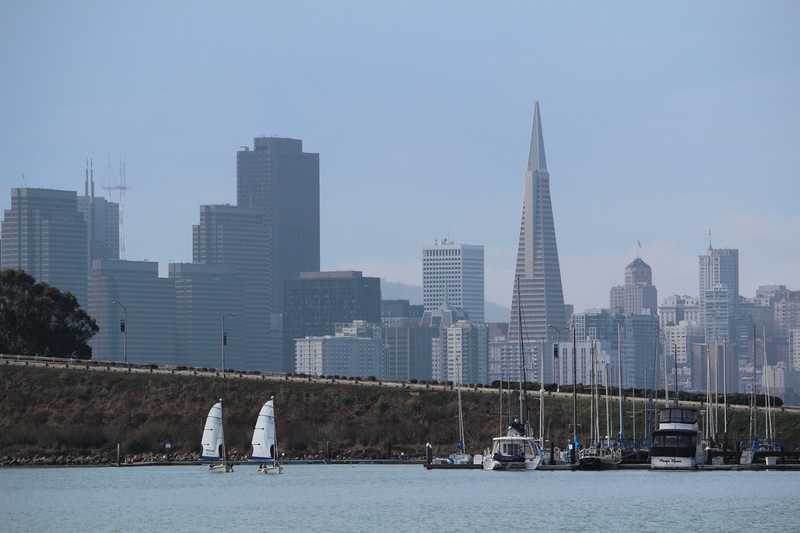 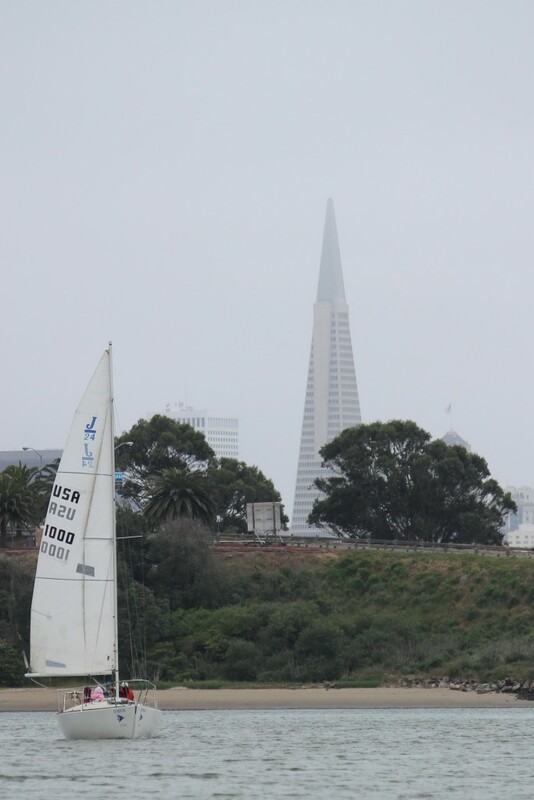 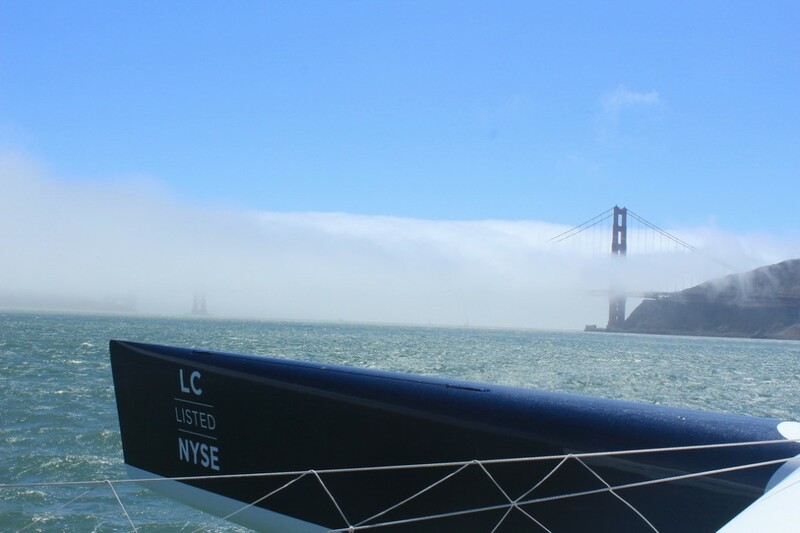 The camera lens can be deceiving, often giving the impression of sailing much closer to these SF landmarks that are so visible from Clipper Cove. 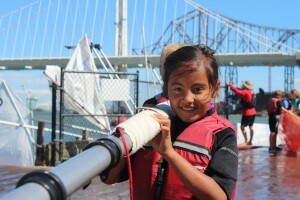 Sailing on Clipper Cove also provides fourth graders with the opportunity to see our world from a different perspective. 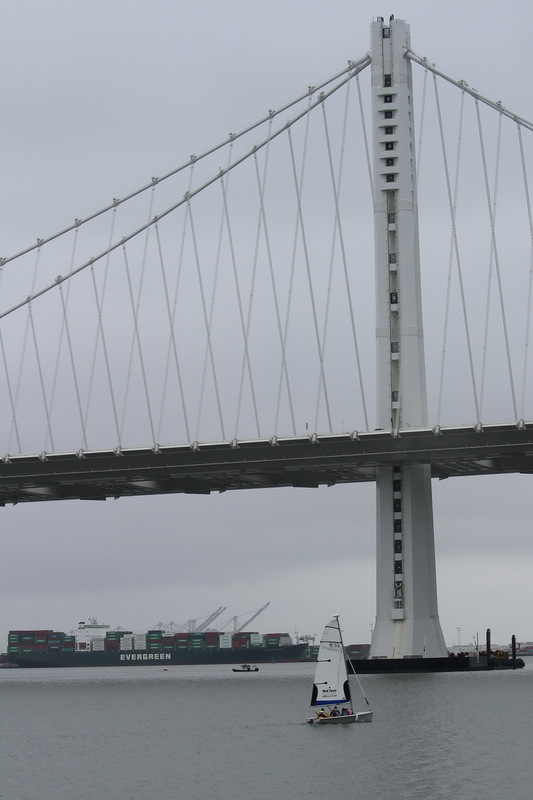 For example looking up at the Bay Bridge tower rather than down onto San Francisco Bay. 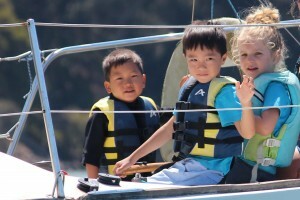 Of course no matter which direction the boats are heading the kids are clearly happy. 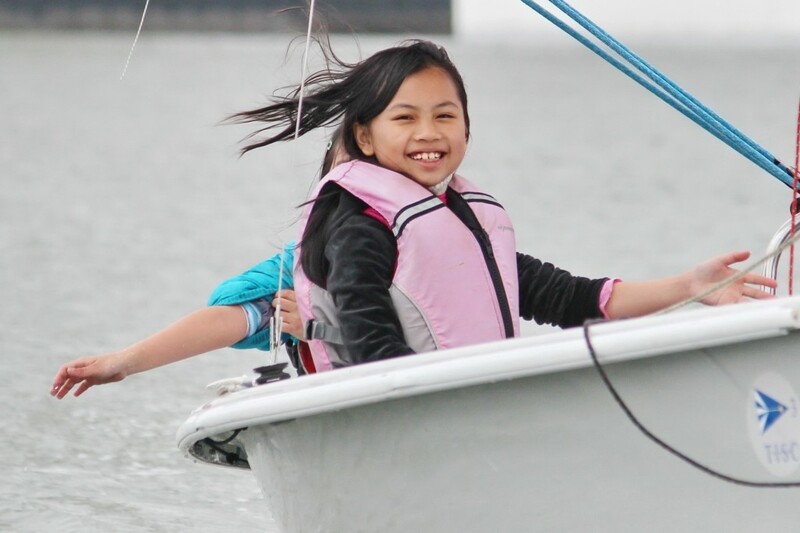 Smiles are standard issue for kids in boats. Here are more Clipper Cove smiles: July Smiles On Clipper Cove. 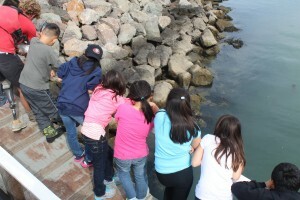 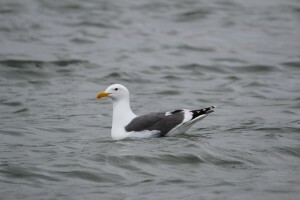 Other classes have studied about renewable energy and the ecology of the bay. 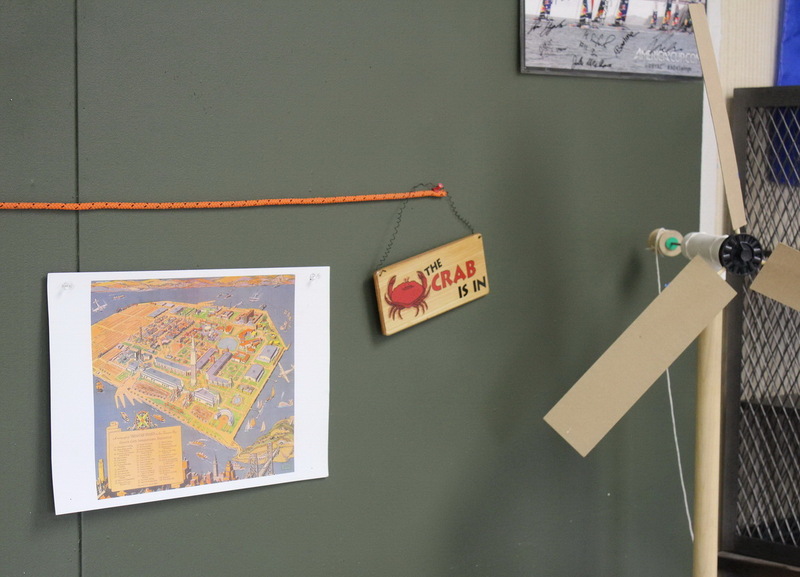 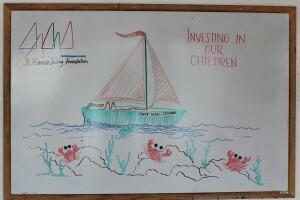 Here’s the story behind “the crab is in” sign in the activity center: JYC Kids’ Crabby Day at TISC. 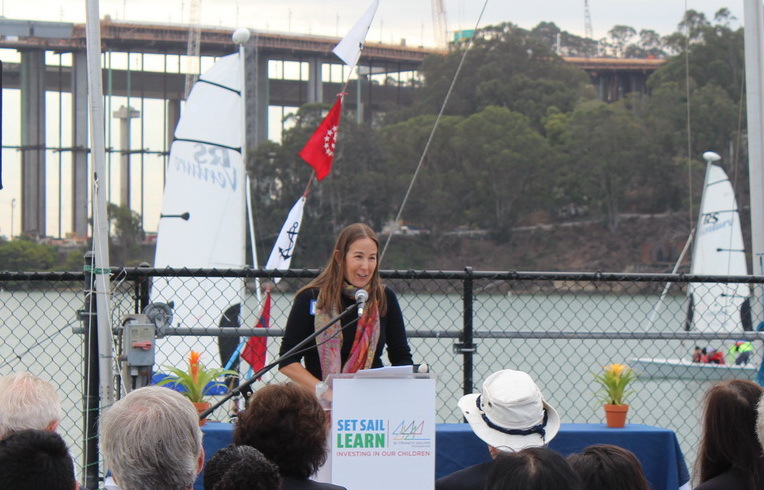 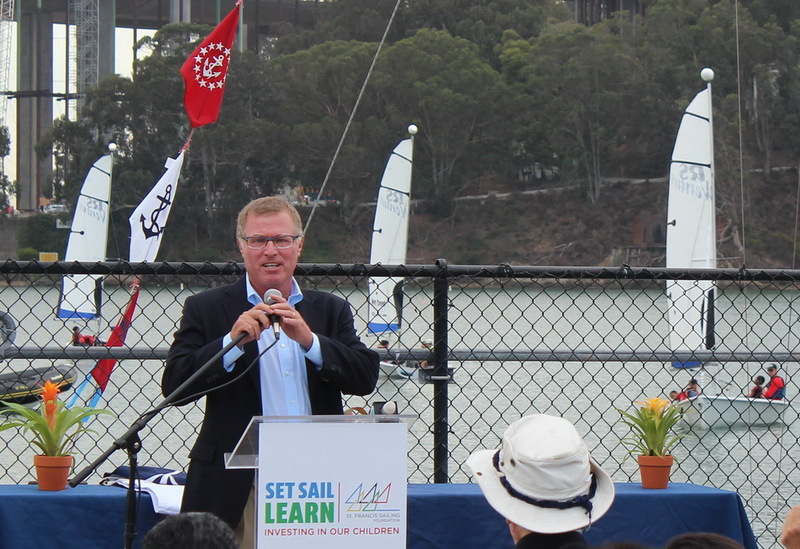 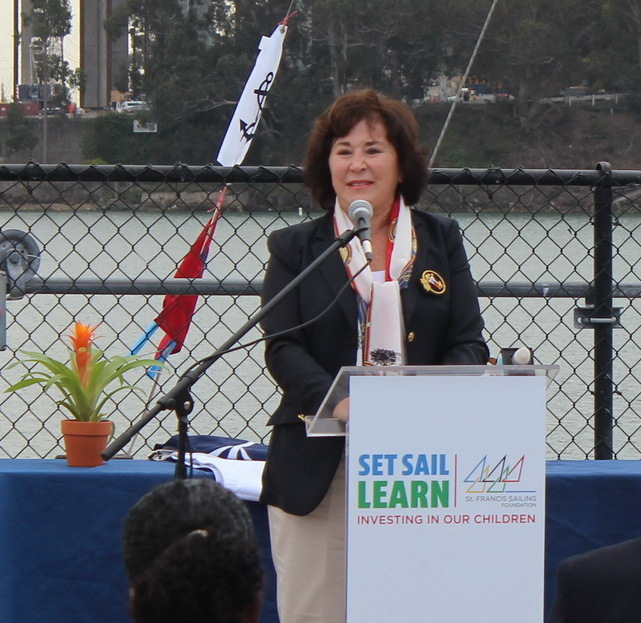 By the time we finish the Fall 2015 Set Sail Learn classes at the end of this month more than 3,000 San Francisco Unified School District fourth graders will have benefited from the TISC Set Sail Learn Program. 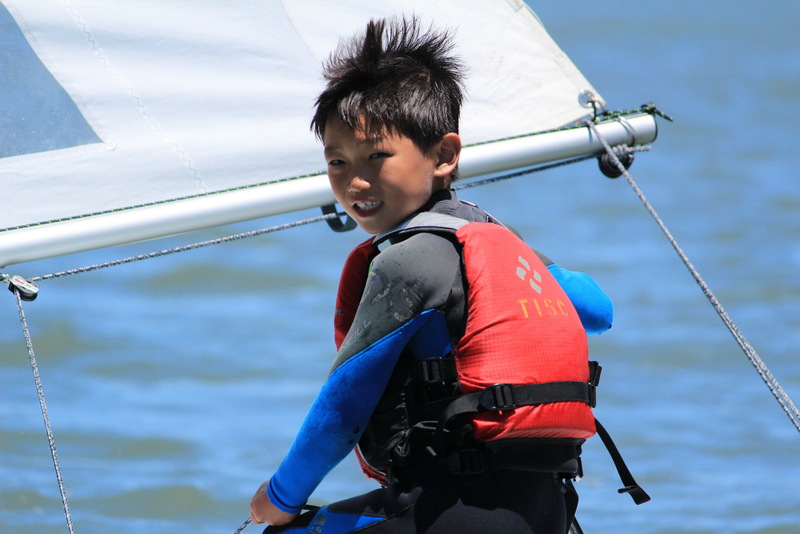 Here are links to previous SSL blogs with more smiles and lessons learned. 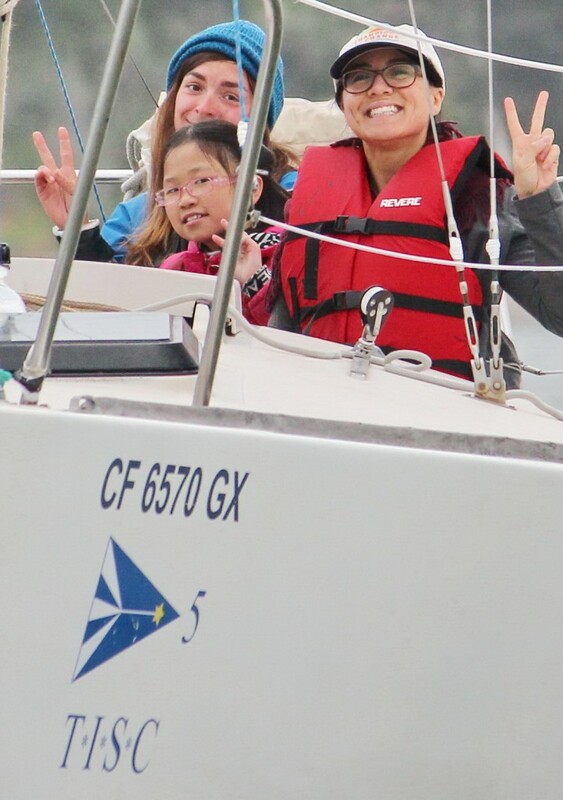 At first glance, I didn’t connect with Highlander 874’s stern graphic – something lost in translation. 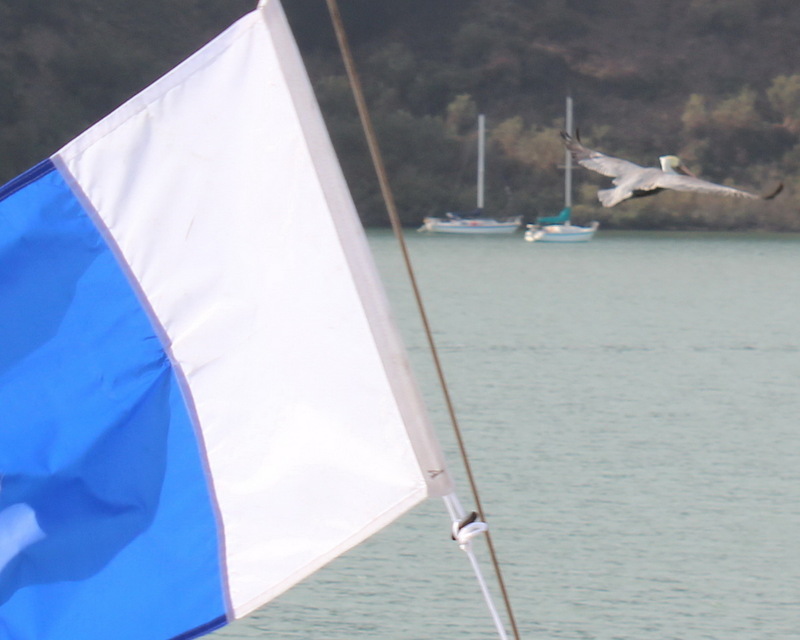 Then two ducks flew into the picture. 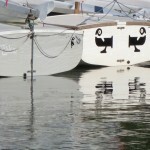 Two ducks? 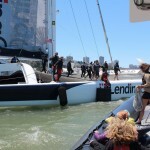 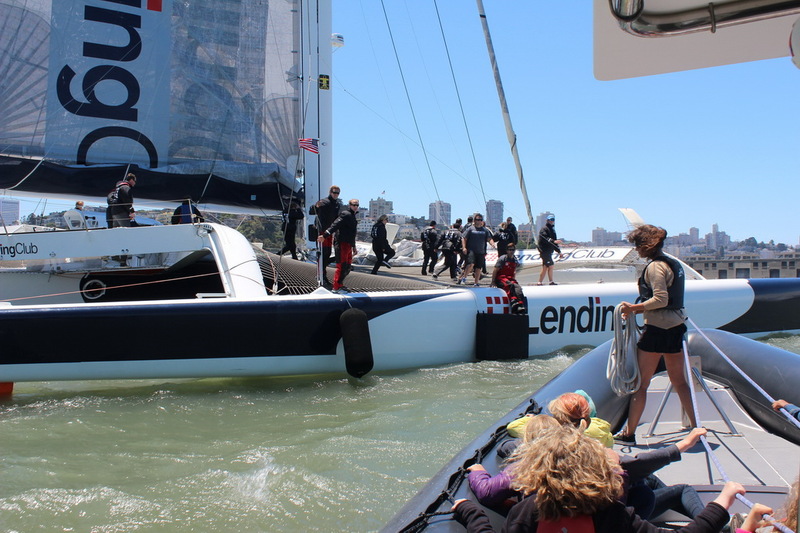 Visions of Jimmy Spithill showed up on the finish line of race seven. 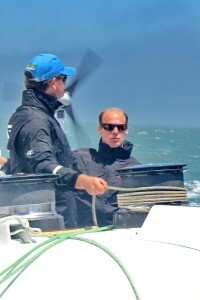 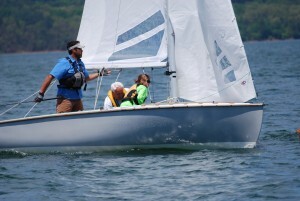 Last week I crewed for Bruce Busbey in the 2015 edition of the Highlander Nationals. Bruce is the son of my college swimming coach, life coach and sailing mentor Bob Busbey, the “Skipper” in Skipper’s Gift. 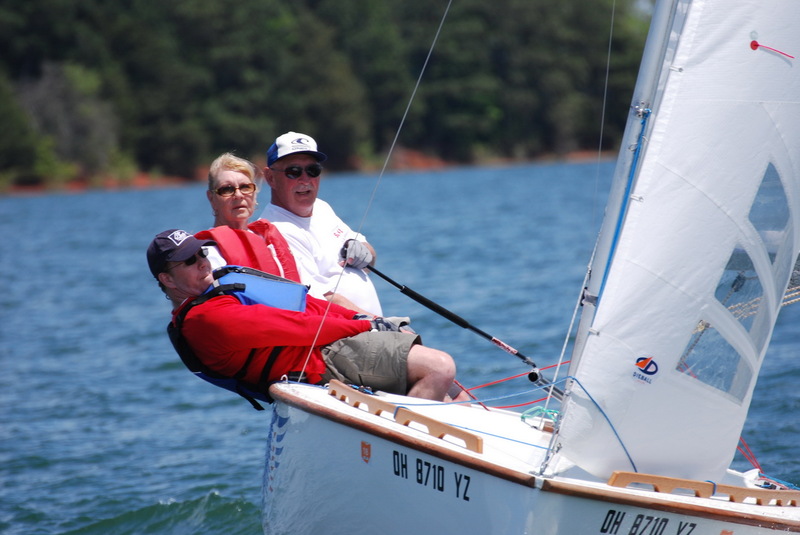 Joining Bruce and his son Justin was a real trip – east to Hartwell Lake at Western Carolina Sailing Club then down a 50 year old memory lane. 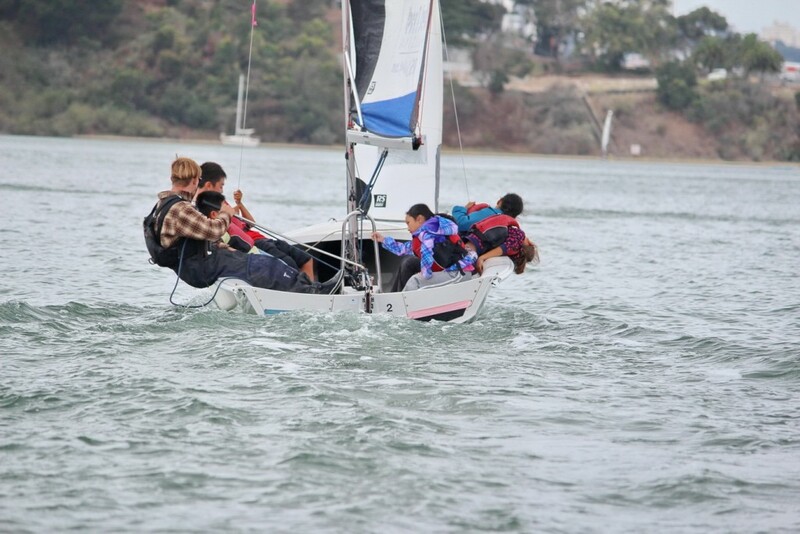 As the Highlander Nationals progressed, interesting stories and life lessons emerged, along with action-capturing pictures courtesy of Gayle Kaufholz. 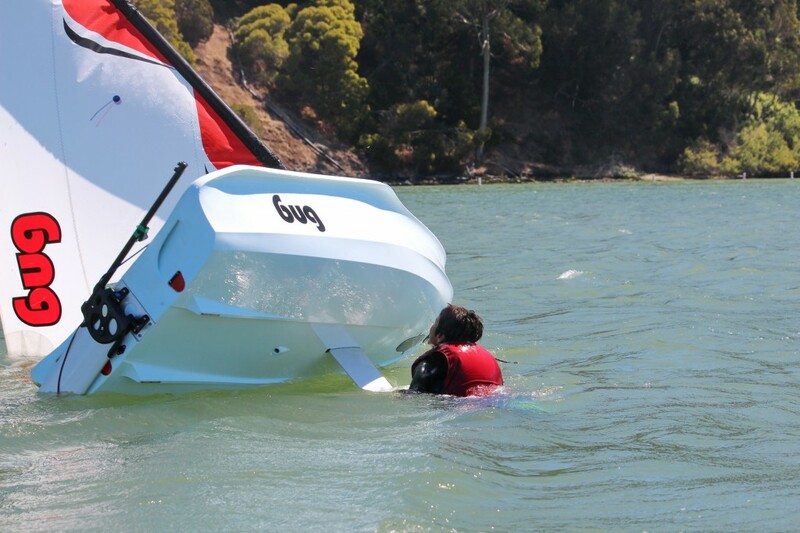 A great reminder on how to deal with snags, headers and glitches – whether sailing or not – flew in courtesy of “The Duck”. 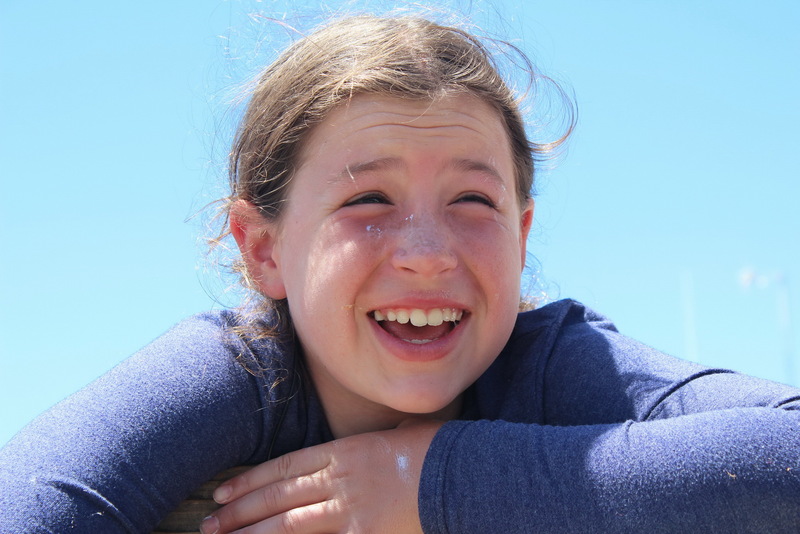 Simple explanation: Jen Kafsky always encourages her kids to shake off problems, not let them build up. 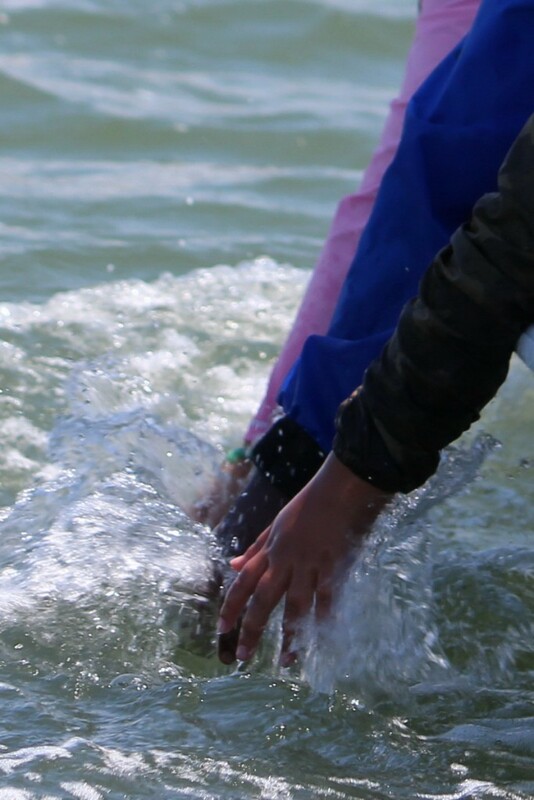 “Let ’em go, just like water running off a duck’s back”. 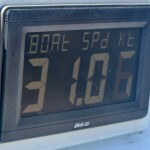 Hence their boat name – “The Duck”. 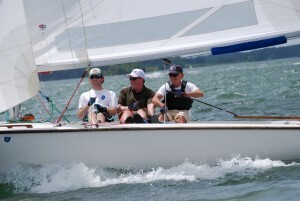 All sailors (well, most of us !) 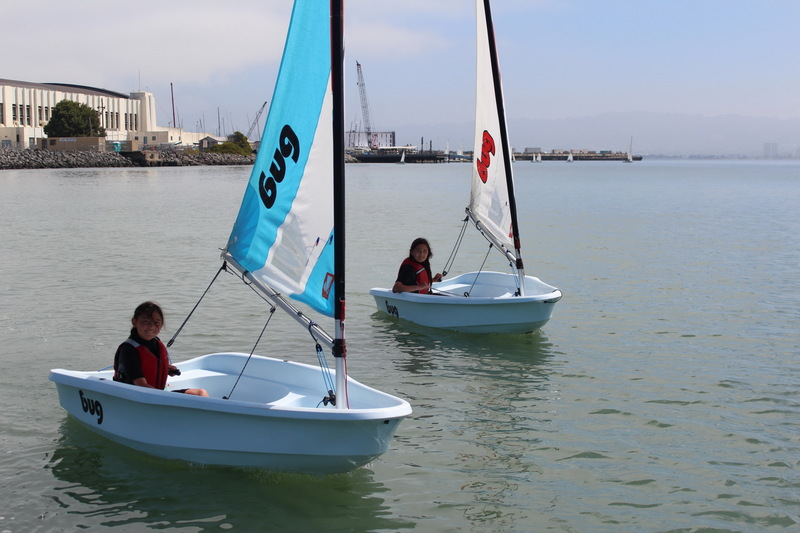 know skippering & crewing together makes for great family sport. 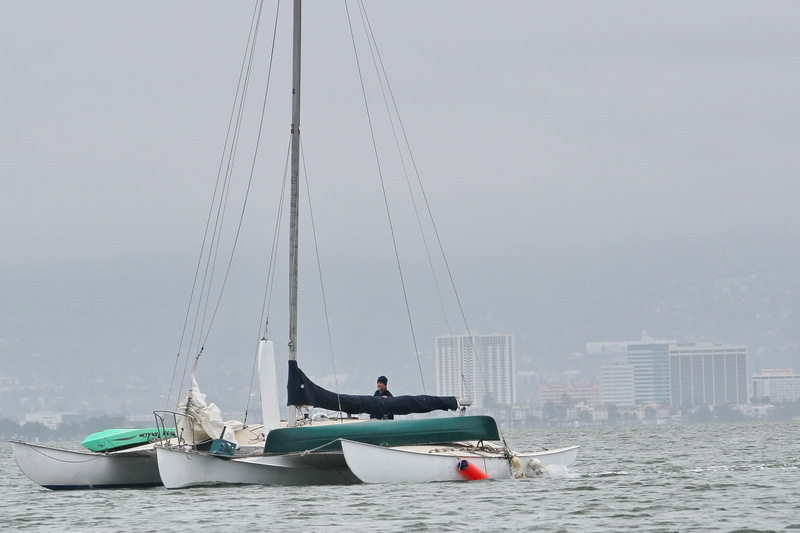 Family geometries became more evident as the Nationals played out around the buoys. 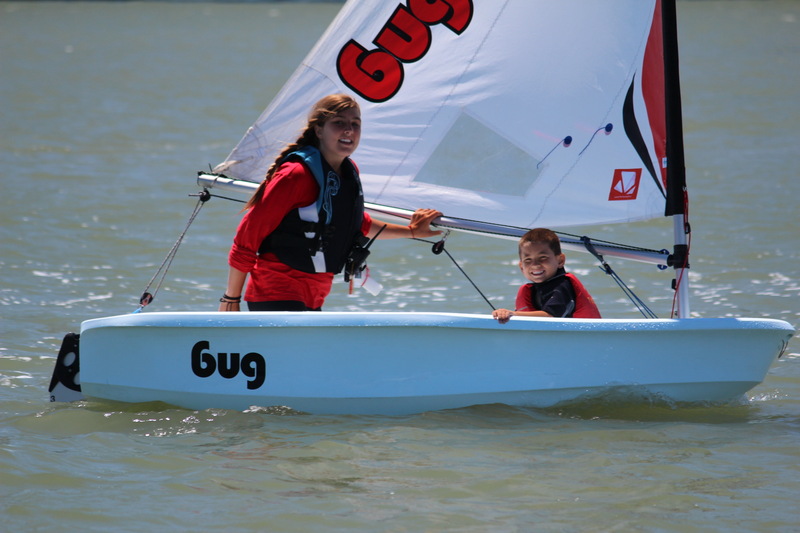 Many boats, including the winner of the Championship Division and third place in the President’s Division, were all-family. There’s more. The Bauer family had sailors on three different boats. 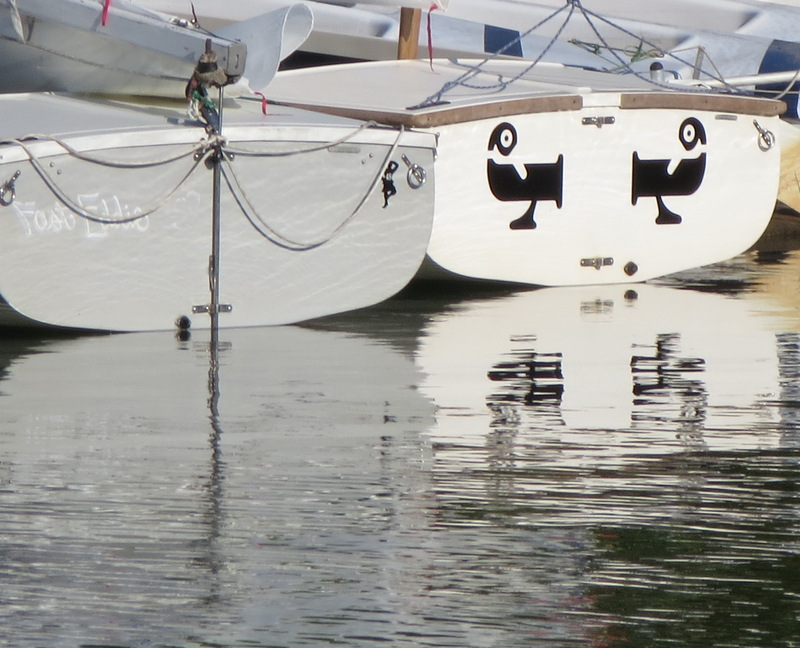 The Kafsky’s, including one of their daughters, skippered and crewed on two. 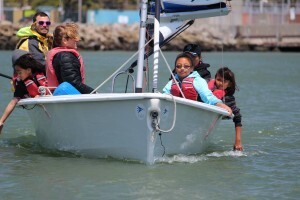 Not to mention on-the-water husband/wife teams plus grandparents and parents on shore duty with future sailors. 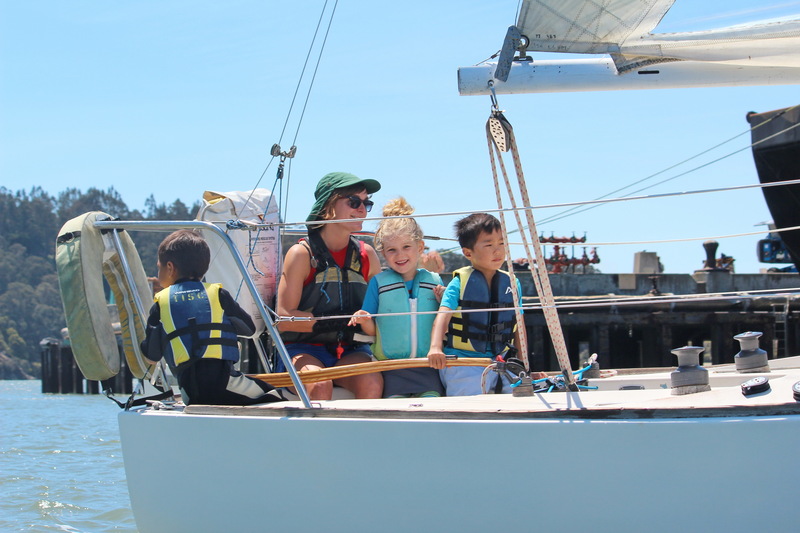 Family sailing doesn’t get any better than in the Highlander class! 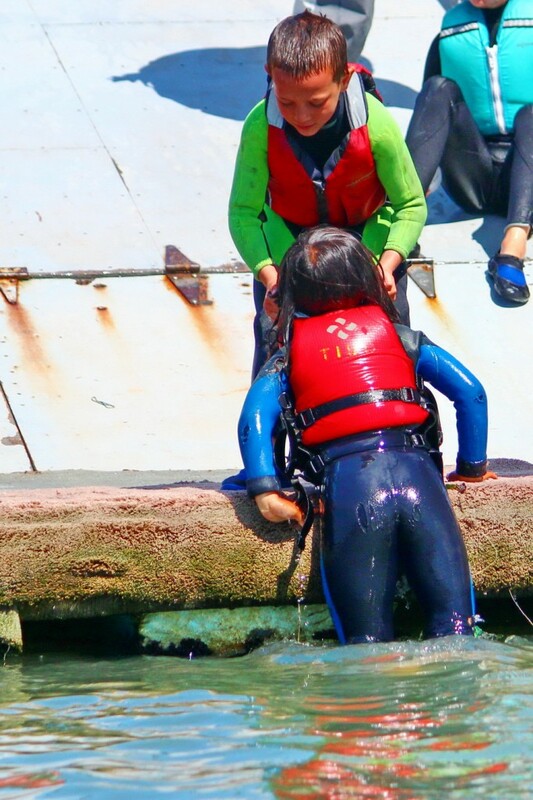 Back to life lessons. Lake Hartwell and Mother Nature served up a variety of wind conditions over the course of the seven-race / one-throw-out series. 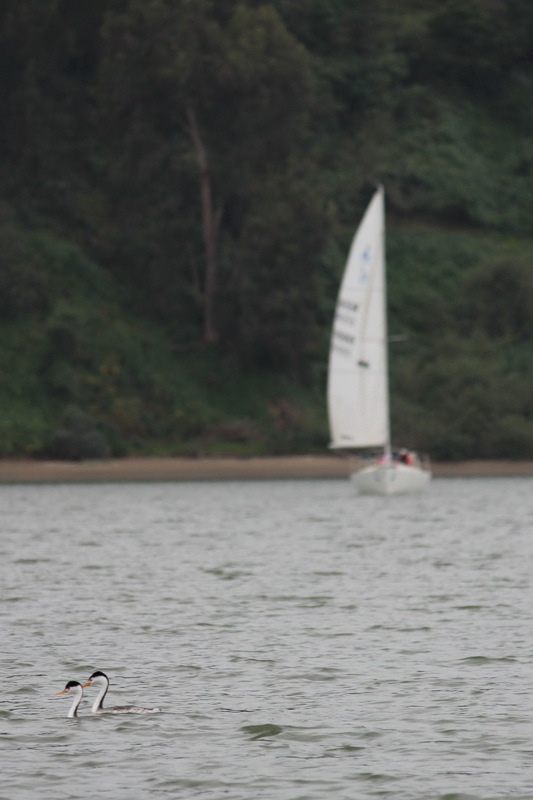 The lead changed five times. 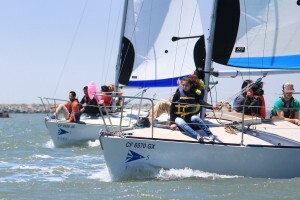 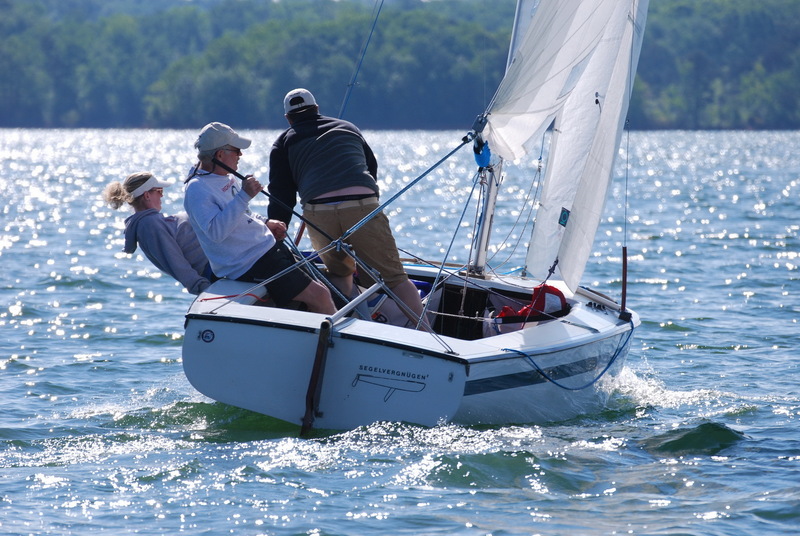 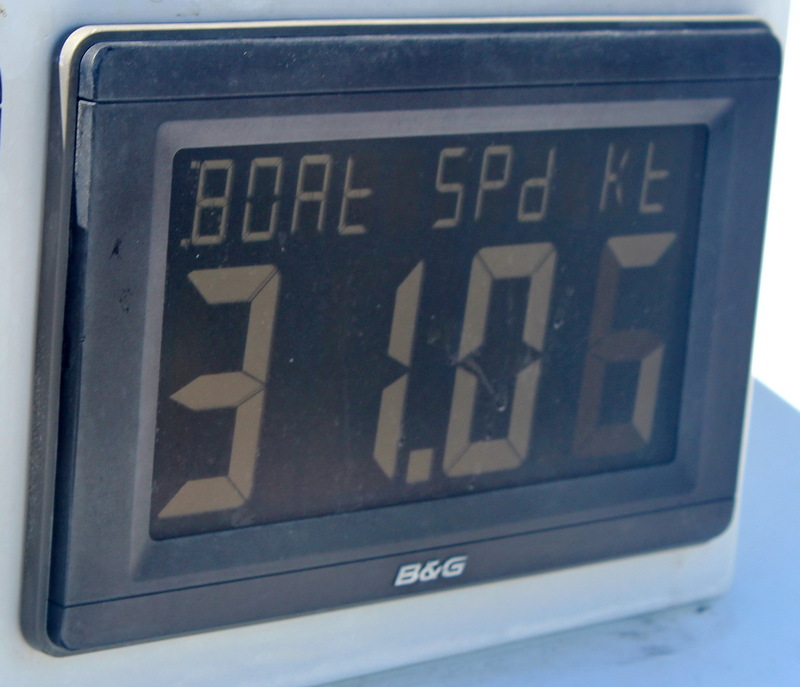 Thanks to a “Class A” WCSC race committee the sailing was impartial to the 24 competitors throughout the entire series – not easy, but fair to all. 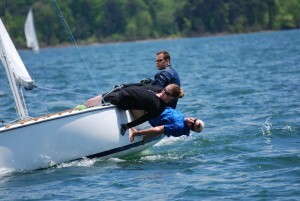 An important life lesson we’ve discussed in the past, never give up (Jimmy to Kids: “Never Give UP”), was clearly in play . 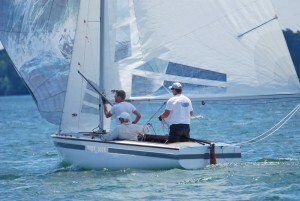 The winning boat tanked in race six then came back with a bullet in the last race. 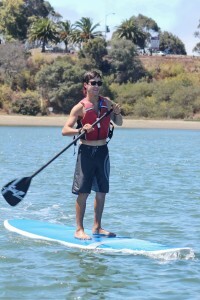 Hats off to Tanner Shultz along with his father and teenage son & daughter. 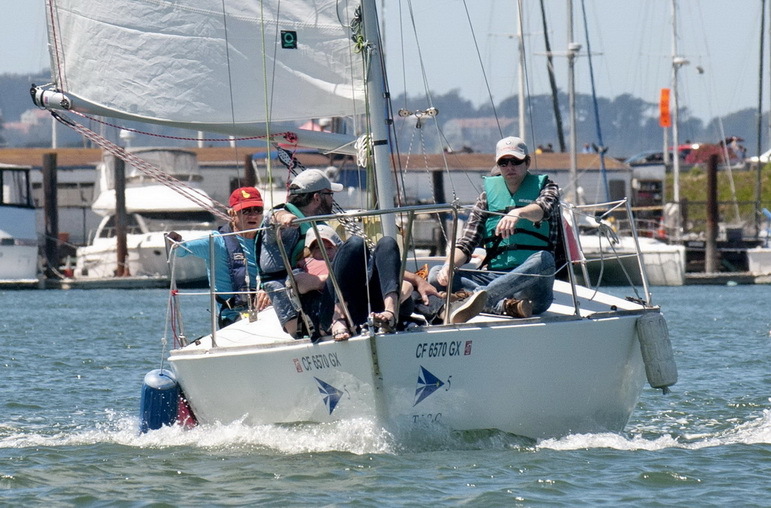 They sailed a solid series and didn’t let a catastrophic race 6 get them down. 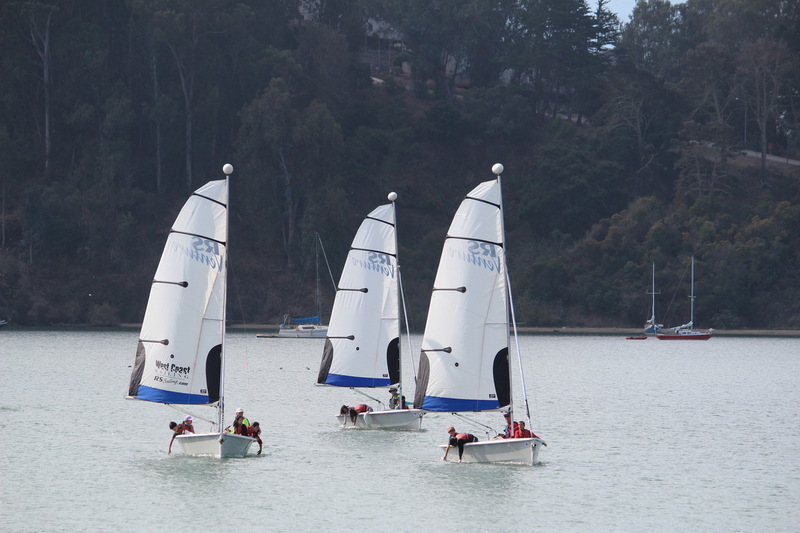 They made like a duck, cleared their minds and picked up a well-earned bullet in race 7 to win the Highlander Nationals in what turned out to be the closest finish in recent memory. 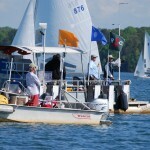 Going into the last race four boats were tied for third, a mere few points behind the first and second boats. 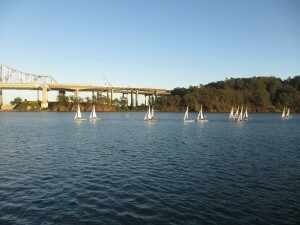 After the final gun only five points separated the top six boats. 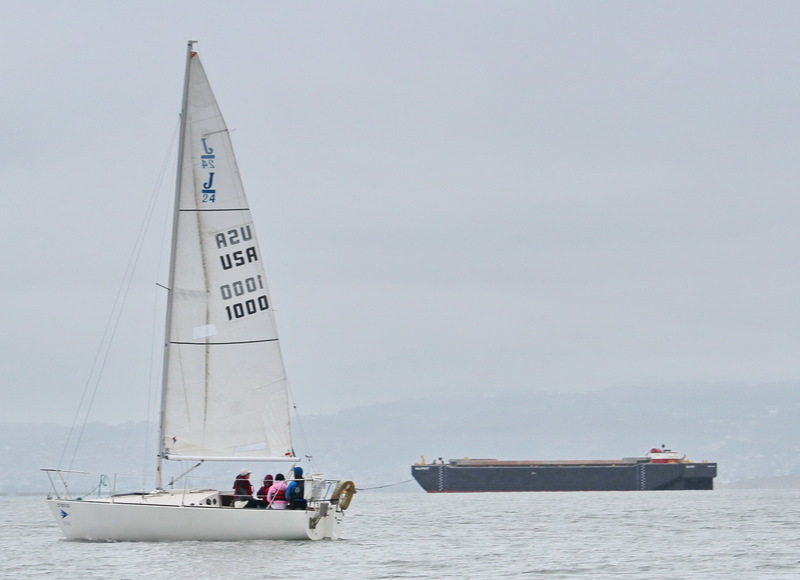 Did someone say competitive Highlander fleet? So the 2015 Highlander Nationals are history – and will be remembered for challenging races, close finishes, a nearly-clairvoyant race committee and outstanding shore-side southern hospitality. 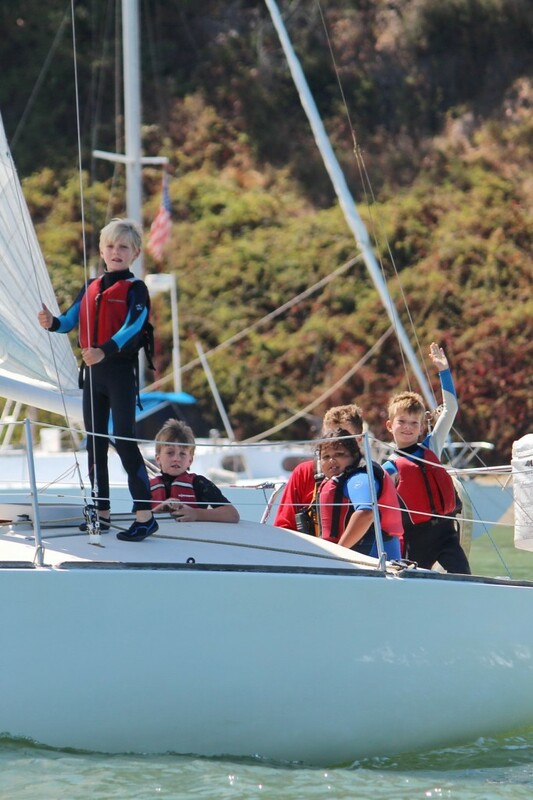 If you’re interested in getting a big dose of life lessons, teamwork, and a super family sport check out any of the Highlander Fleets back east. 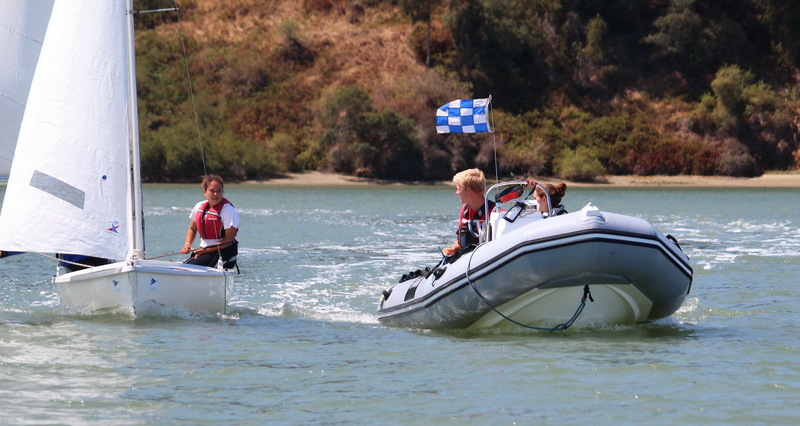 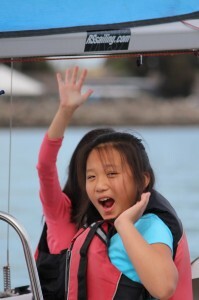 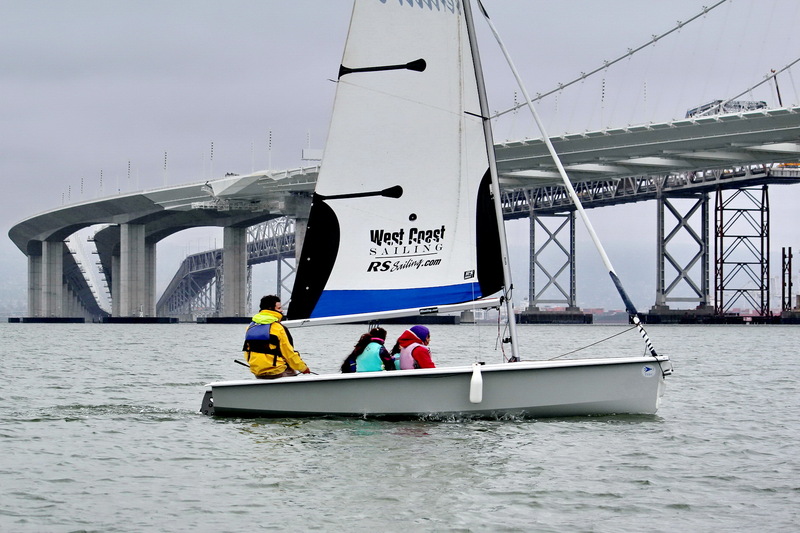 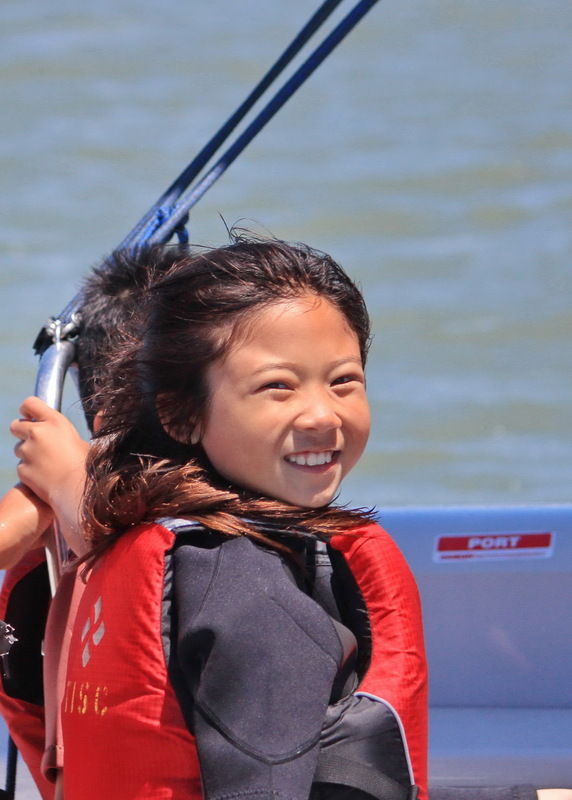 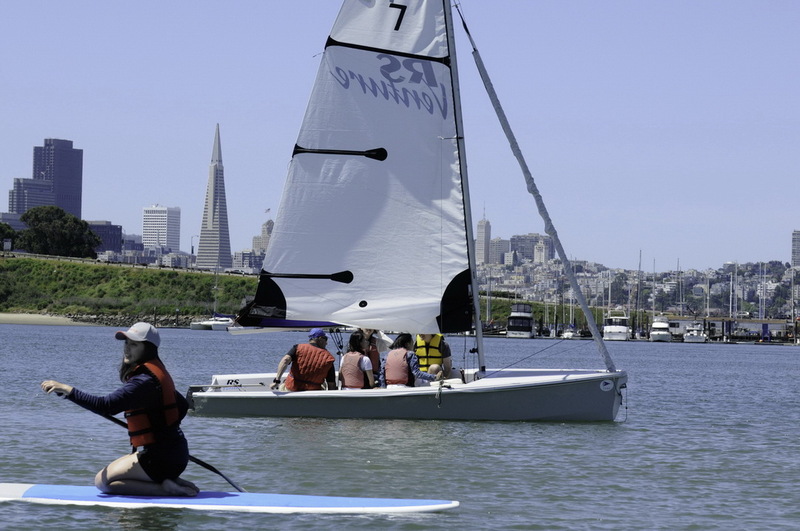 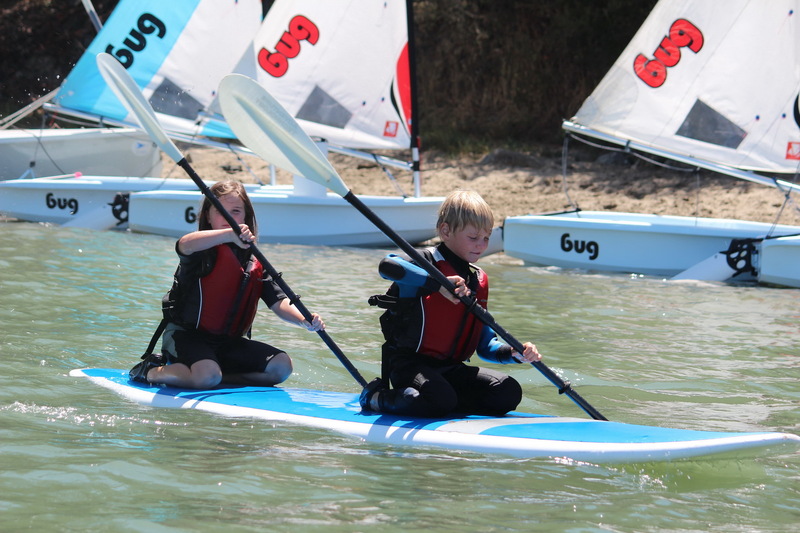 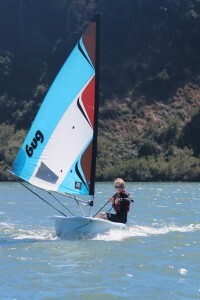 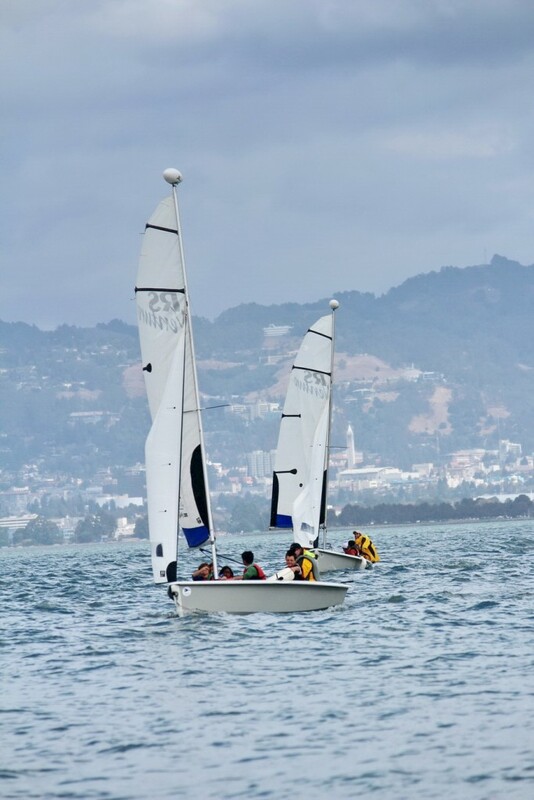 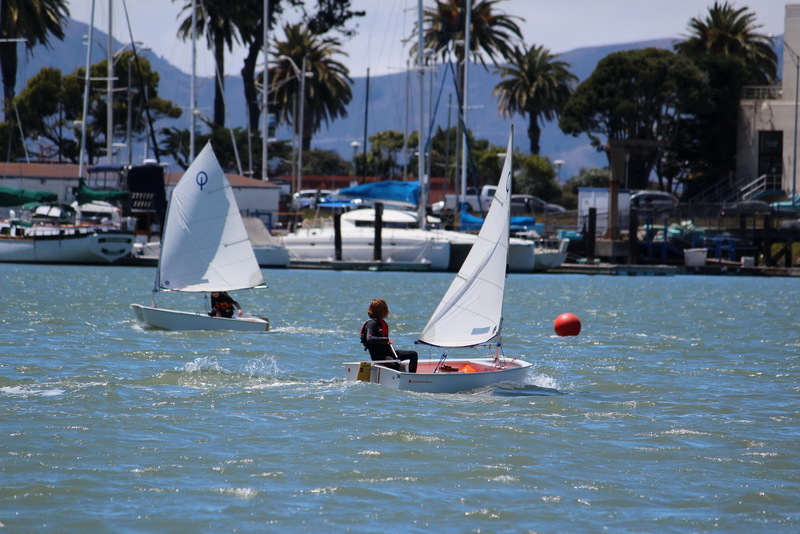 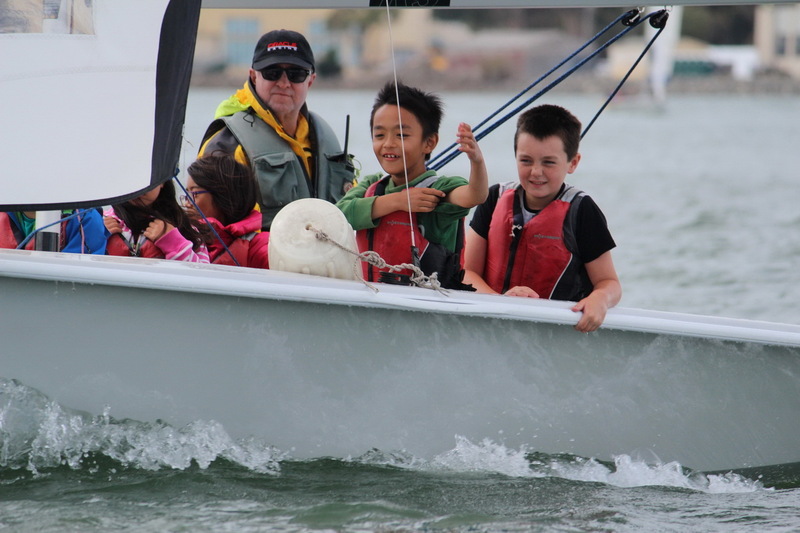 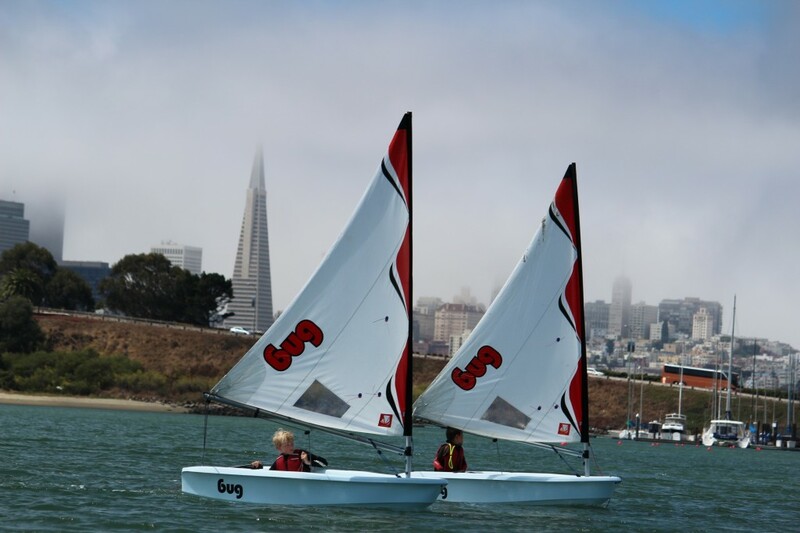 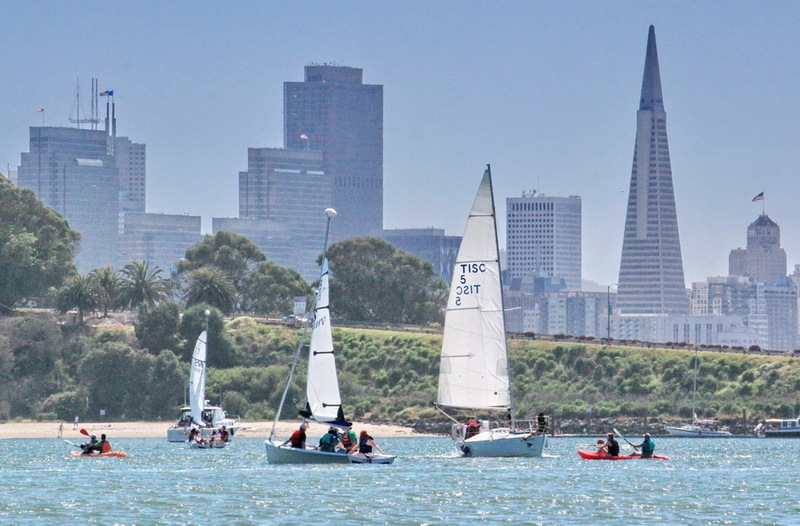 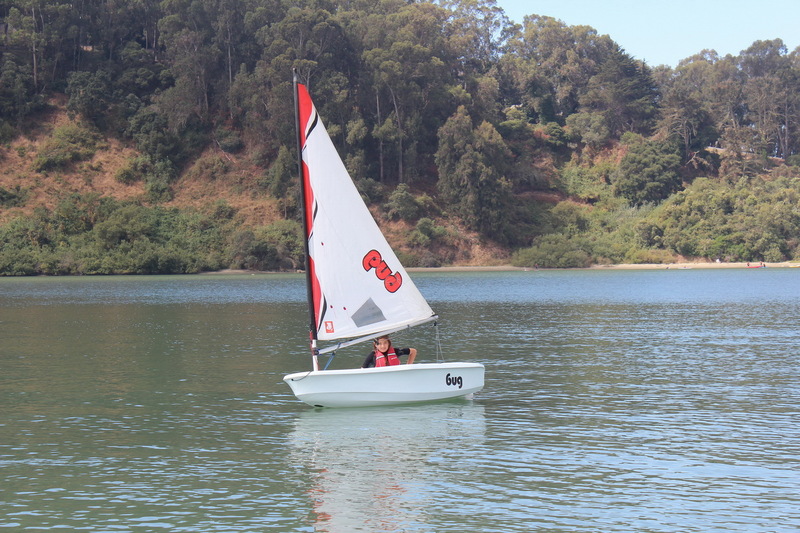 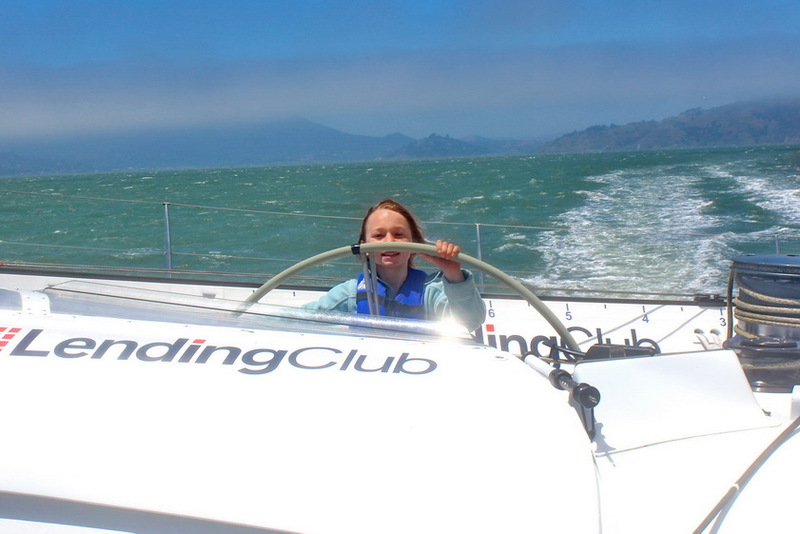 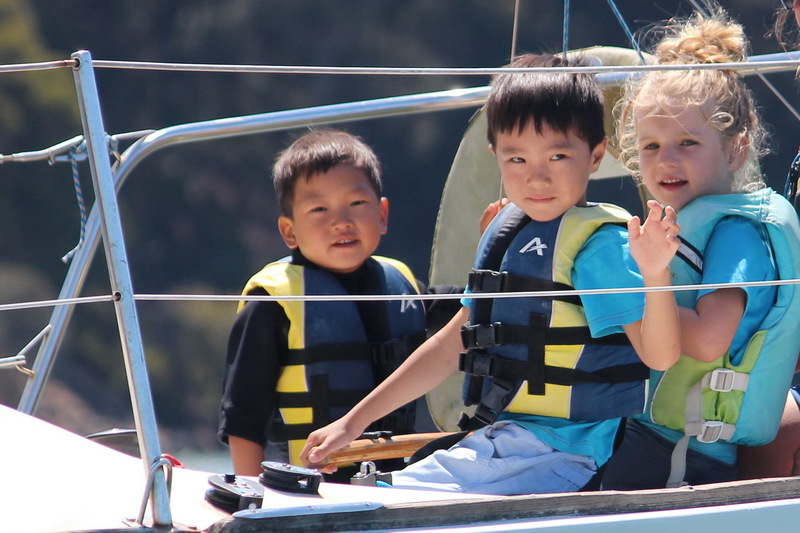 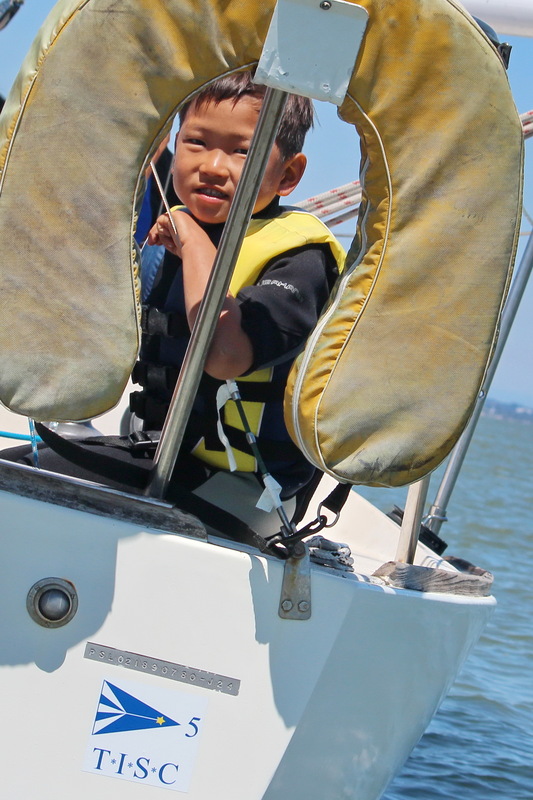 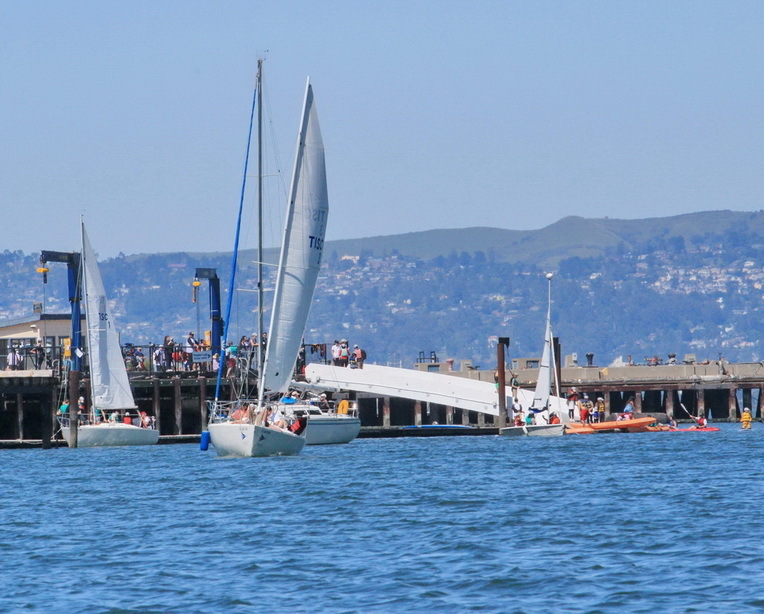 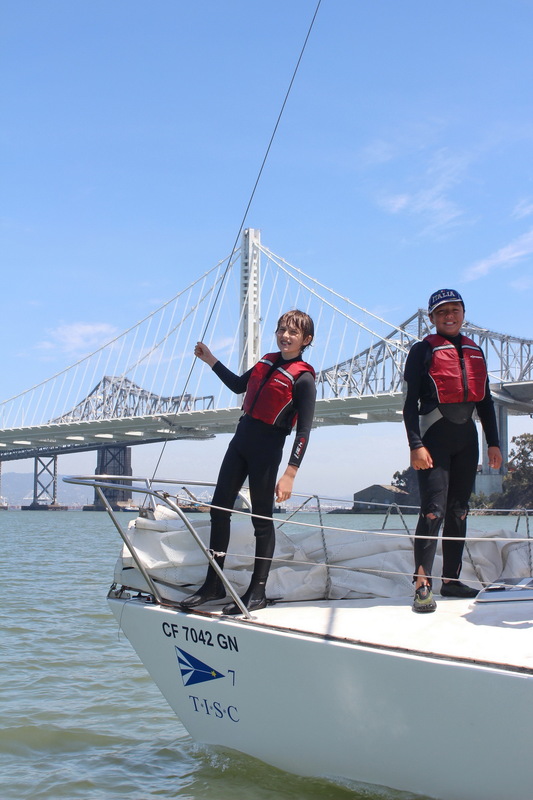 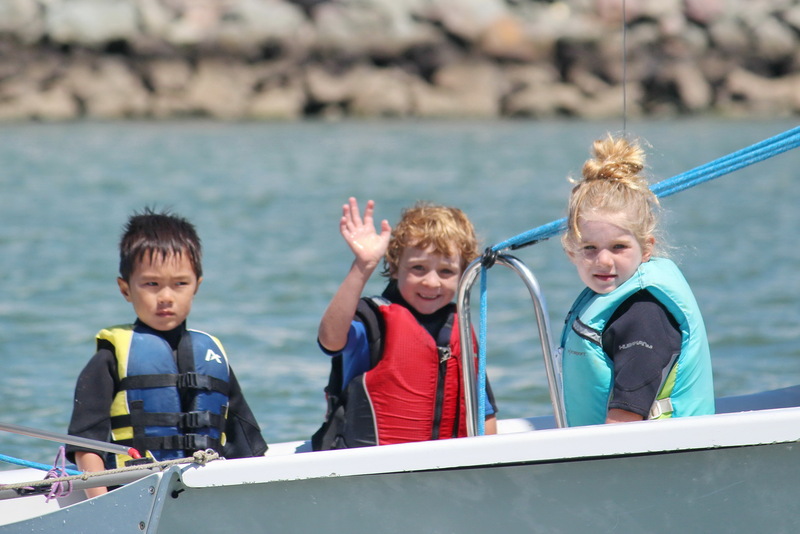 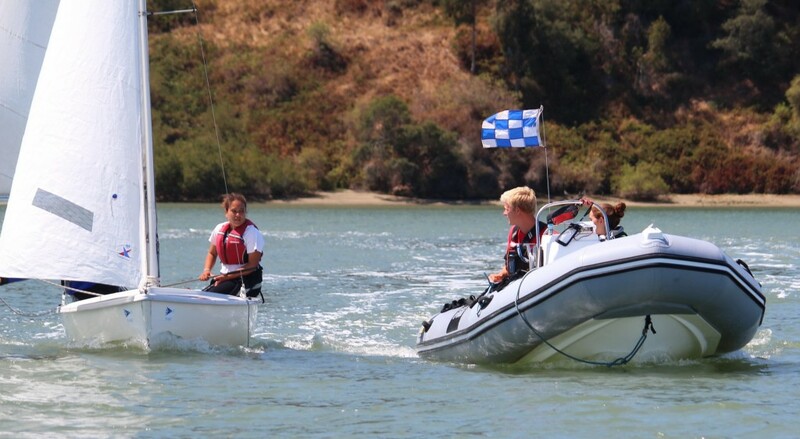 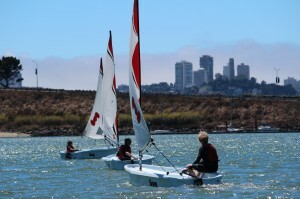 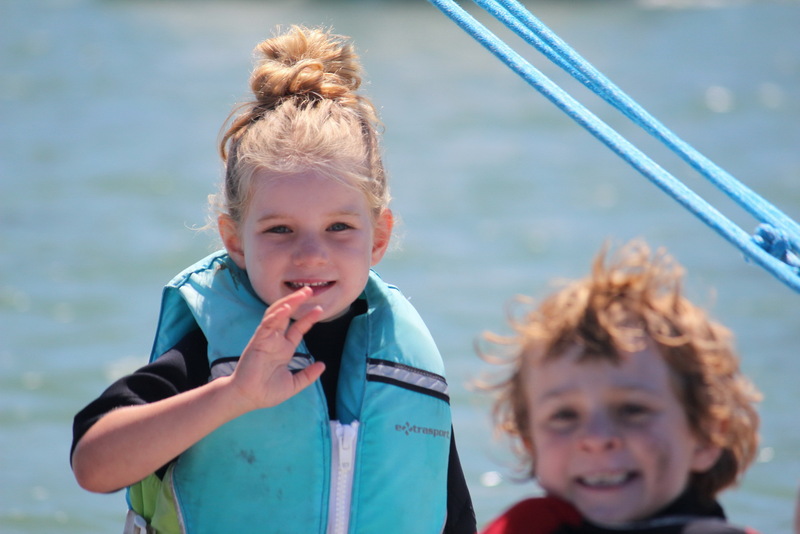 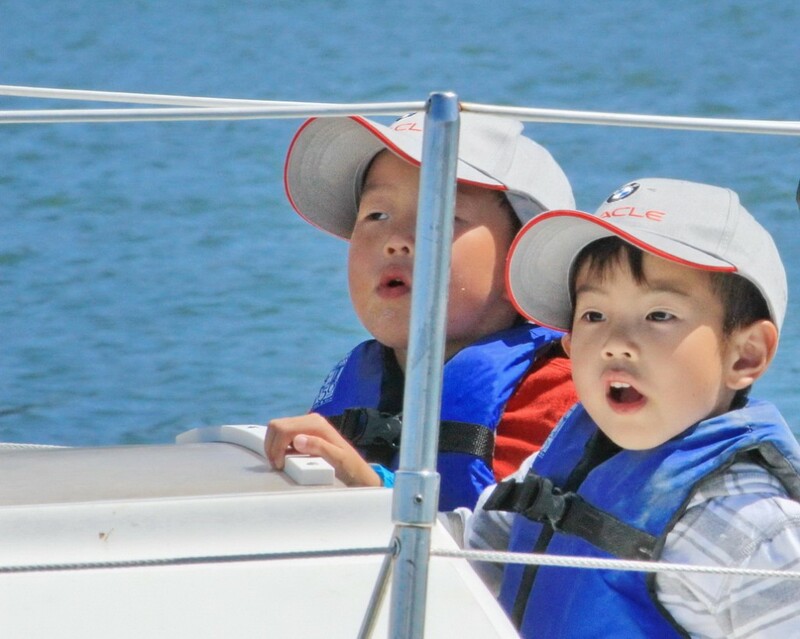 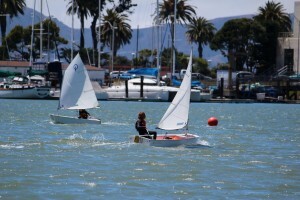 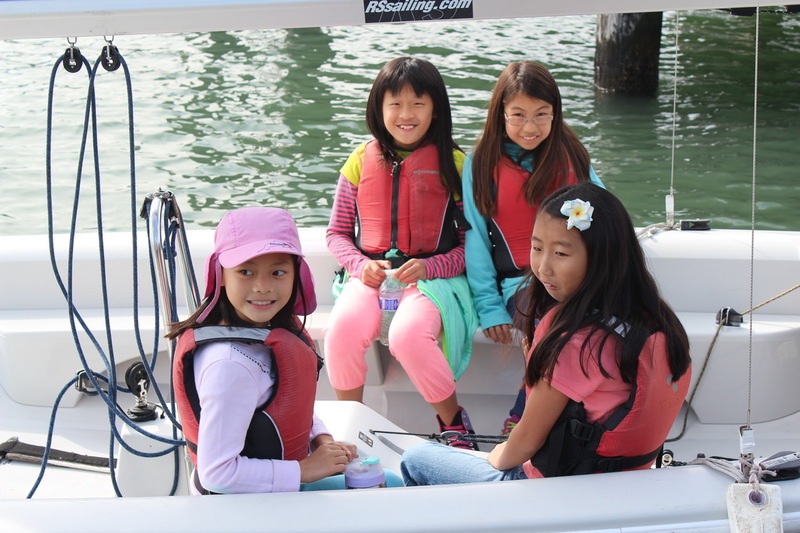 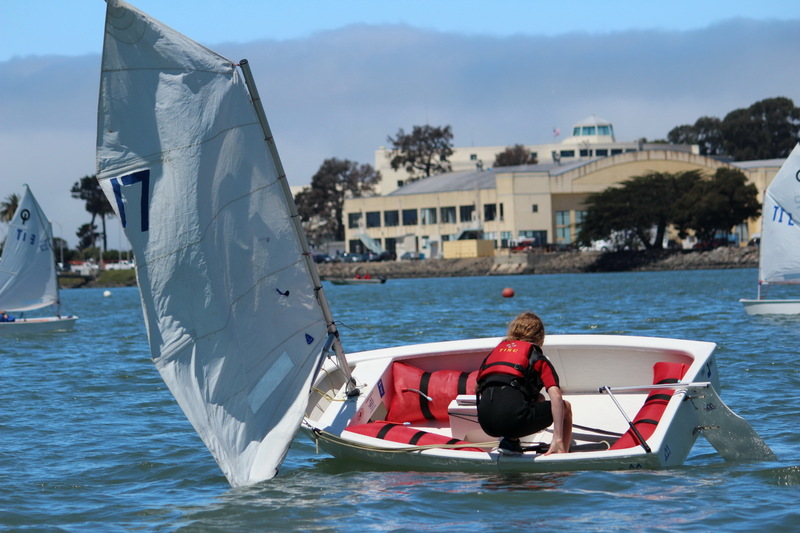 If you’re here in the Bay Area and you want to get your kids into sailing – or learn how to keep up with them on the water – check out the treasure chest of classes available at Treasure Island Sailing Center. 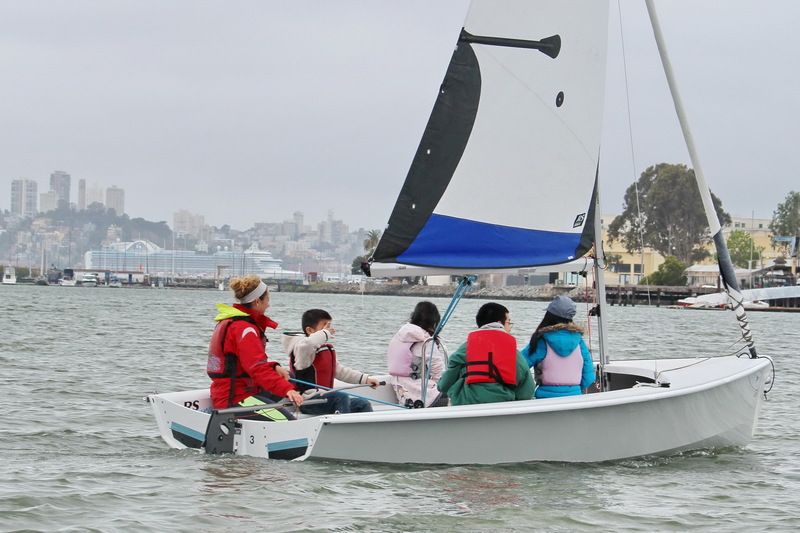 Wednesday’s chilly swirling wind on Clipper Cove – not an ideal setting for Envision Academy Sailing Team’s first day back on the water. Tack, gibe and intentionally capsize they did, however, with bright smiles and cool determination. 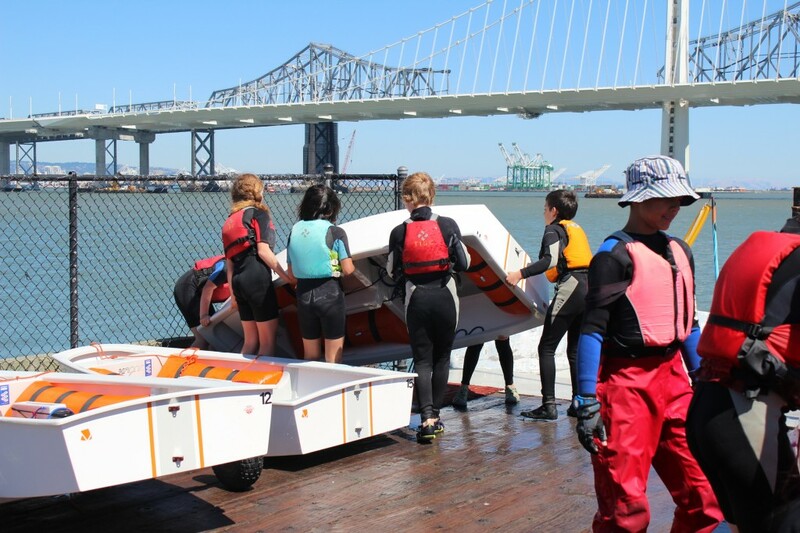 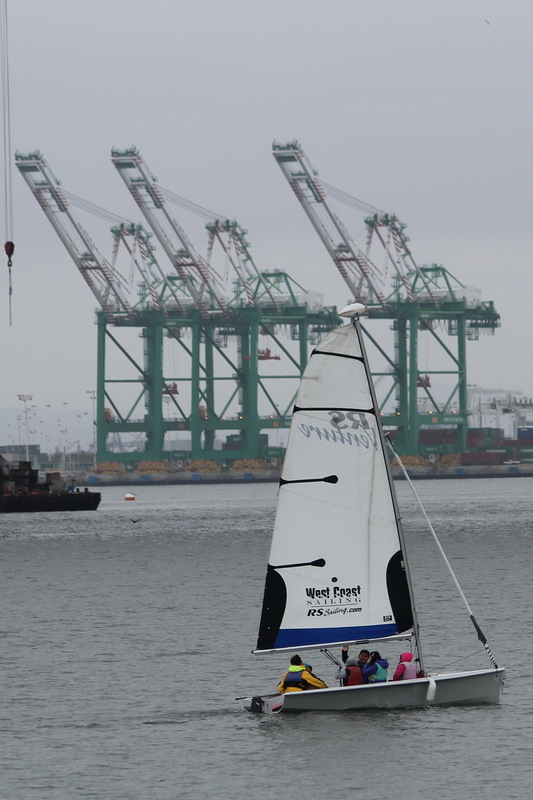 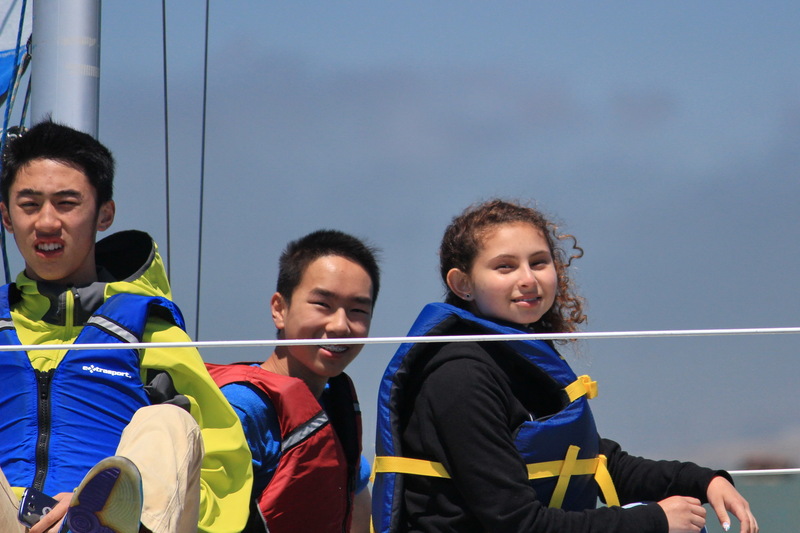 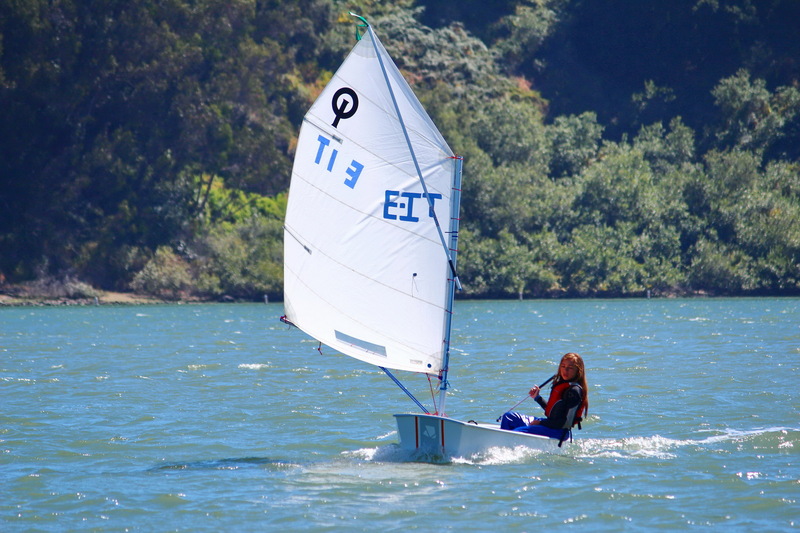 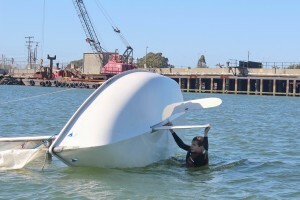 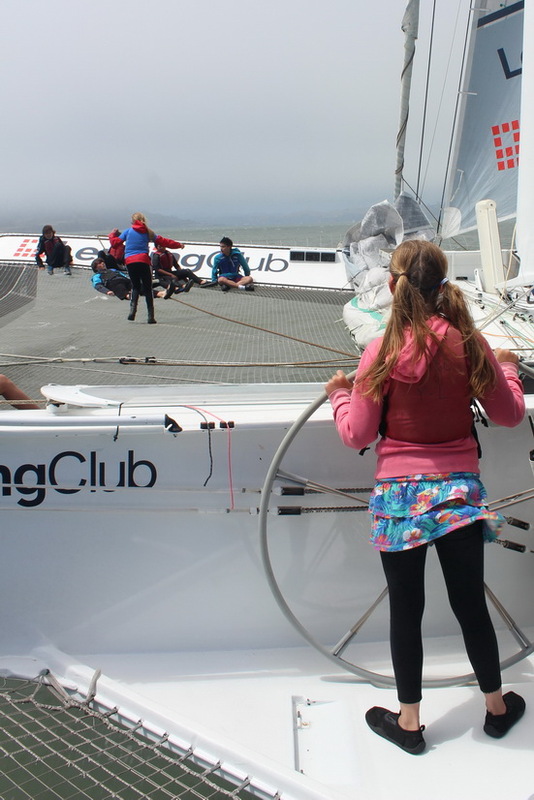 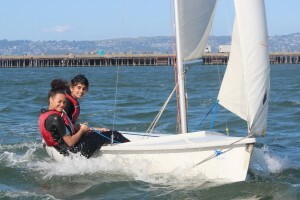 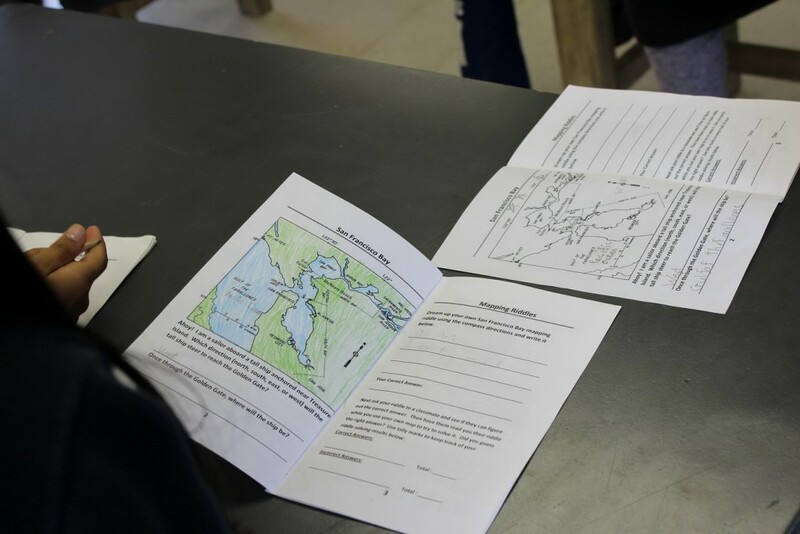 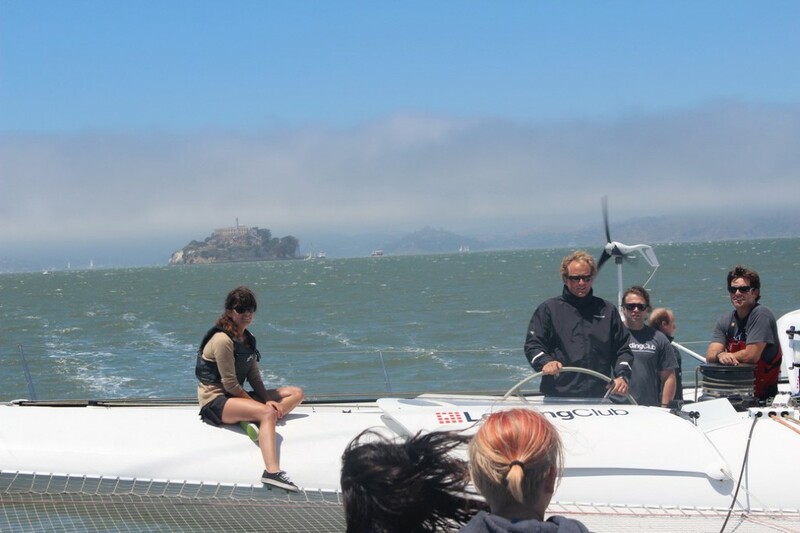 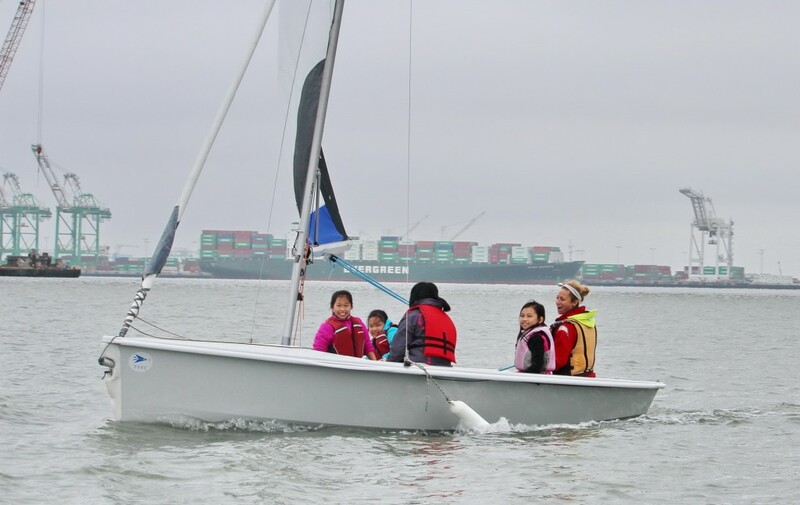 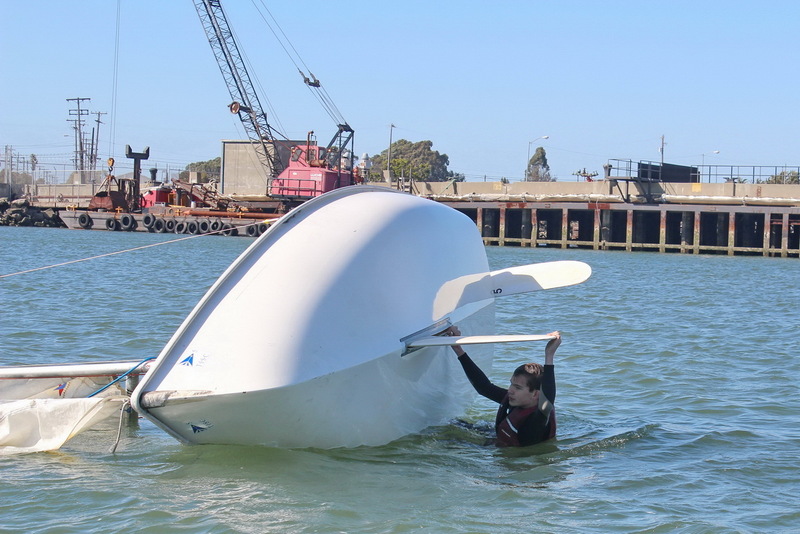 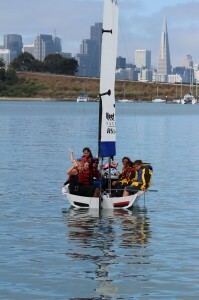 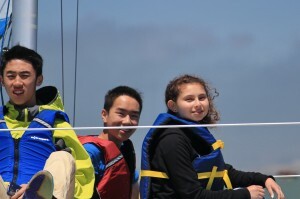 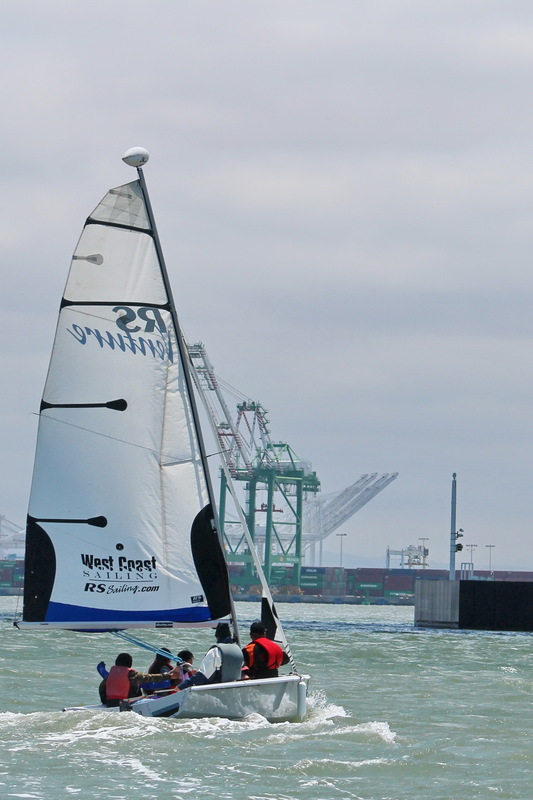 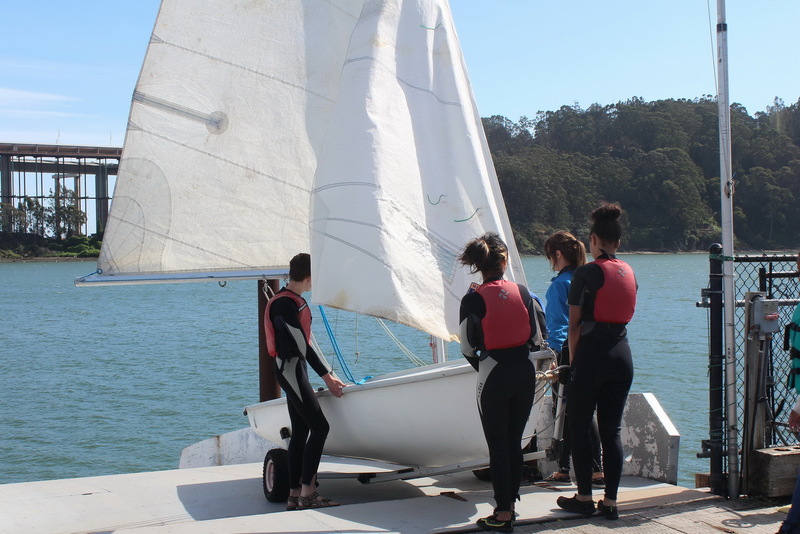 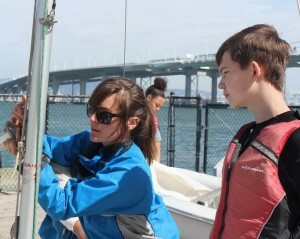 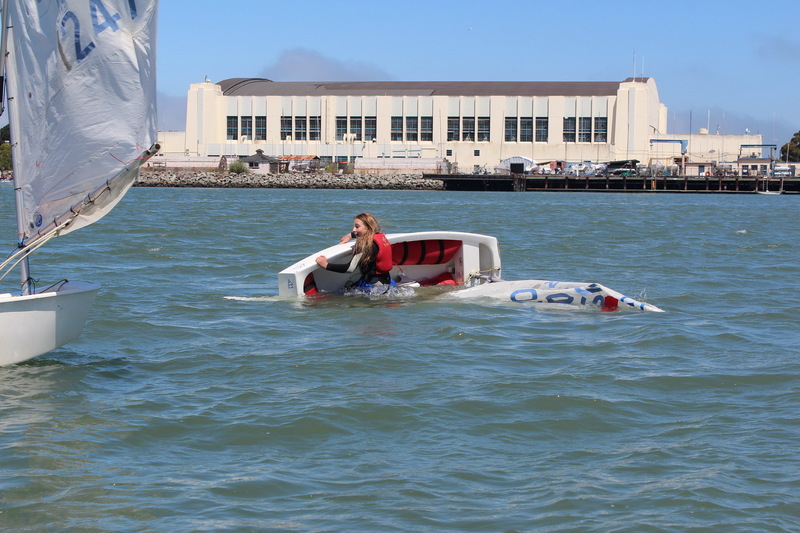 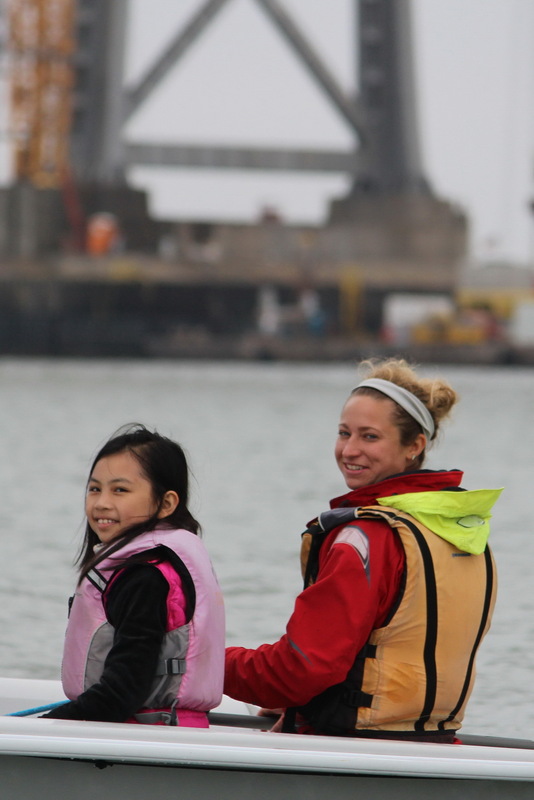 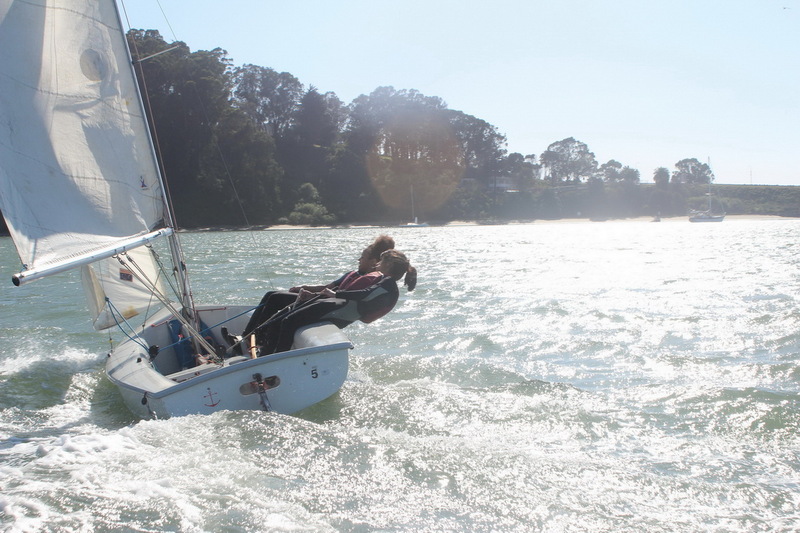 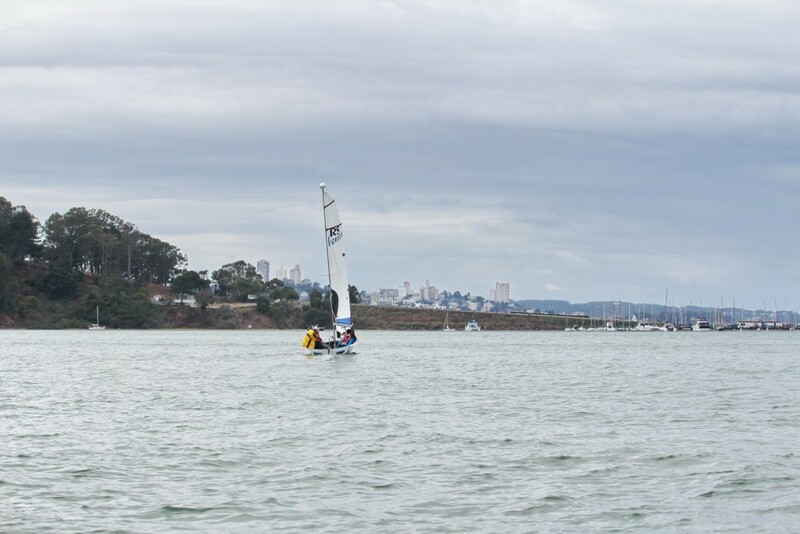 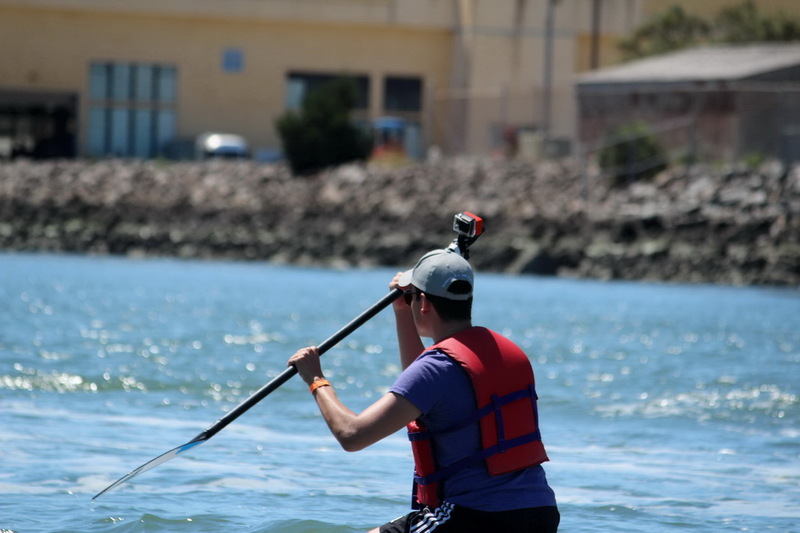 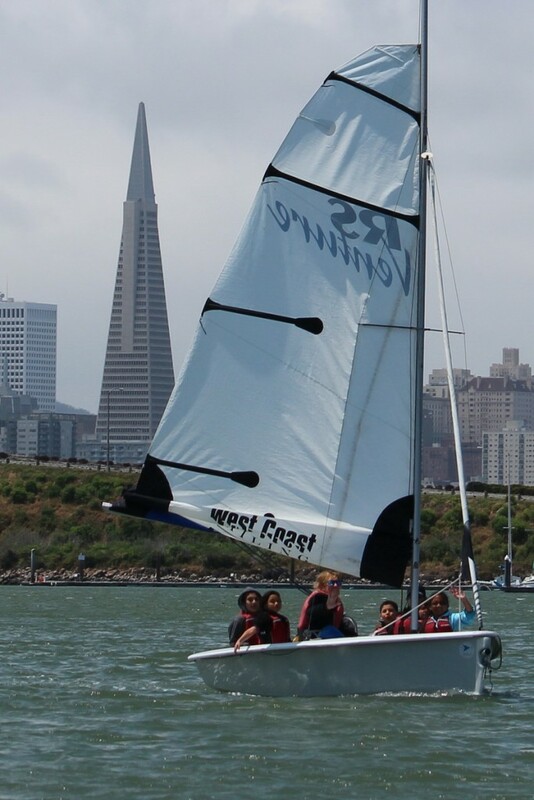 In 2014 Treasure Island Sailing Center and OCSC Sailing teamed up to provide an opportunity for all students at Envision Academy to learn about the Bay, winds, tides and the physics behind sailing. And to get a jump start on life lessons from two of the best teaching teams on San Francisco Bay. 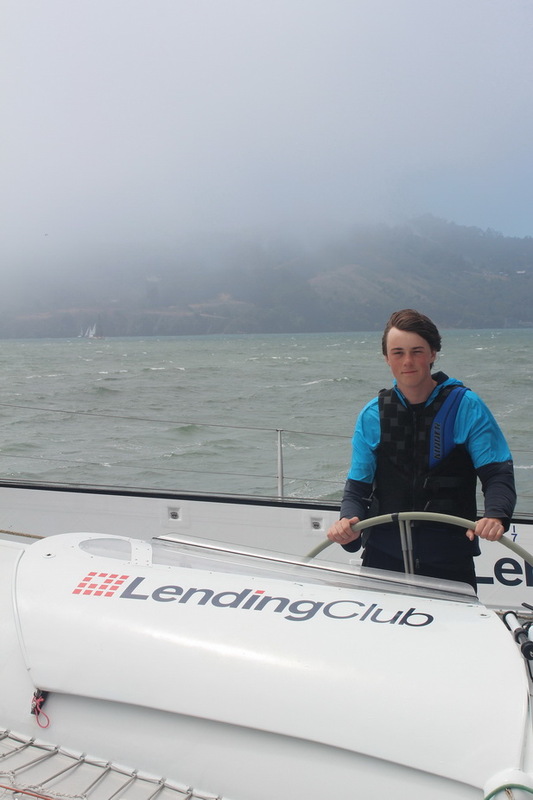 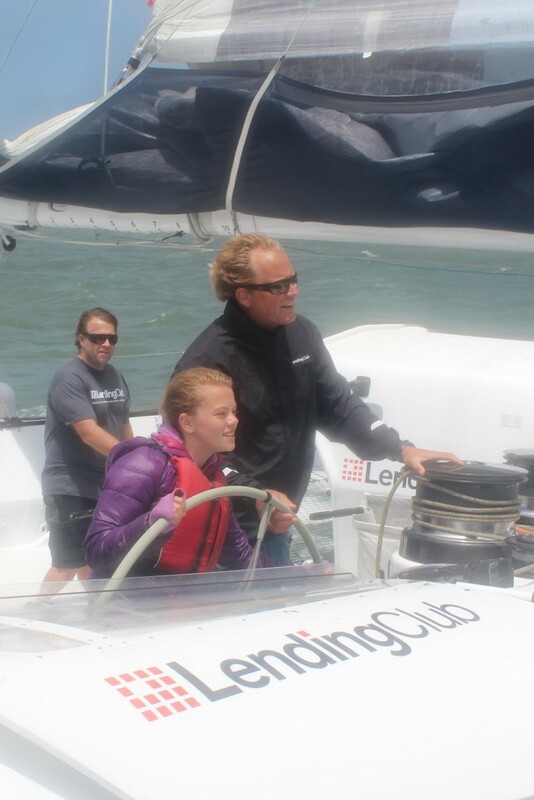 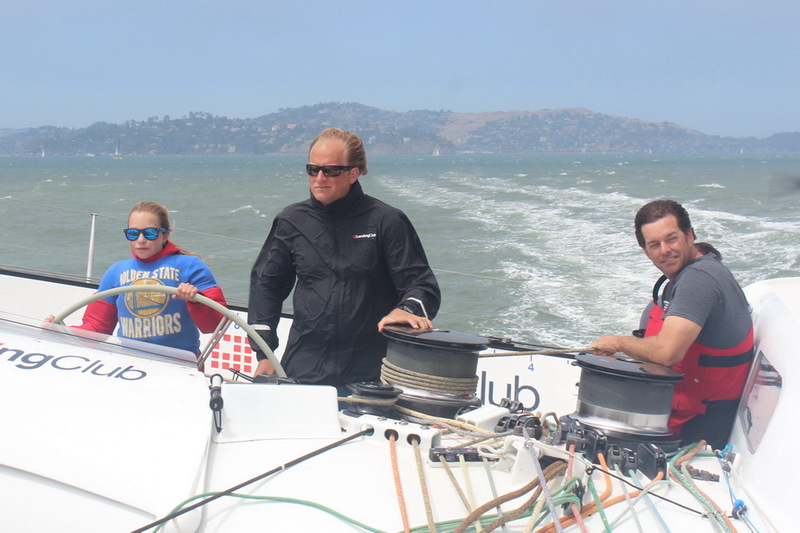 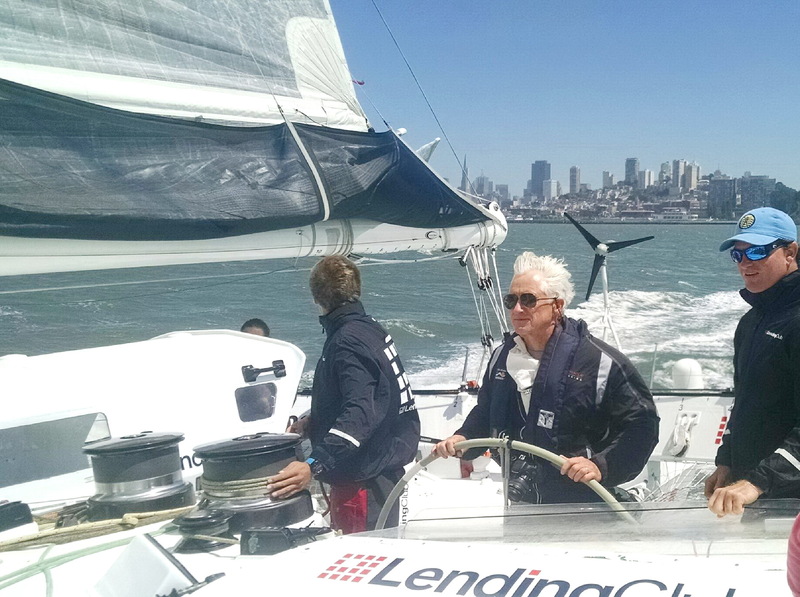 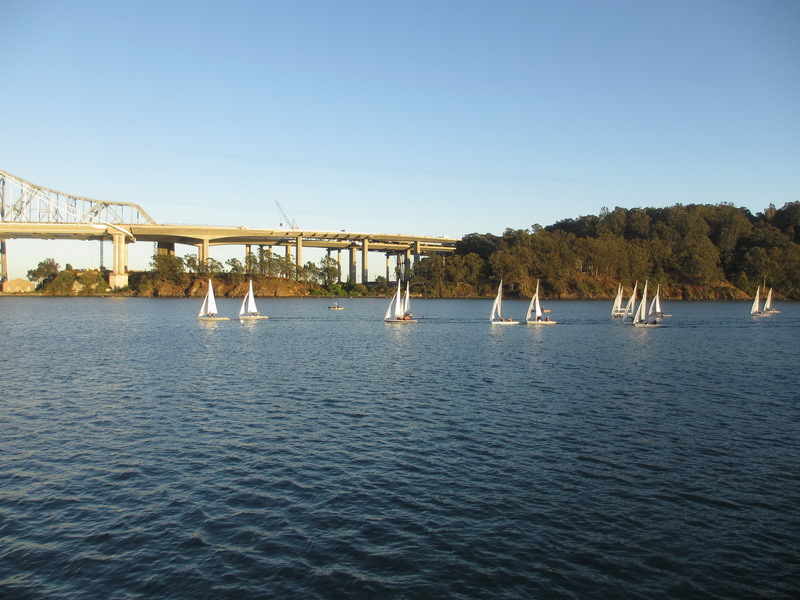 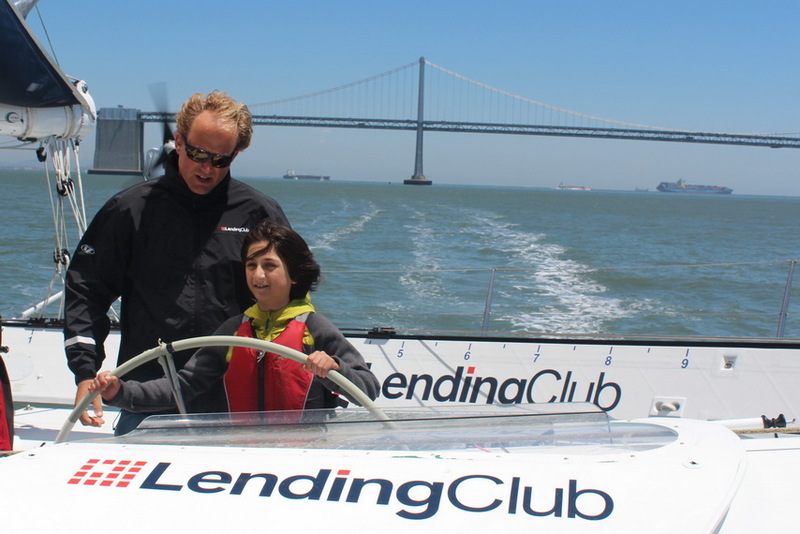 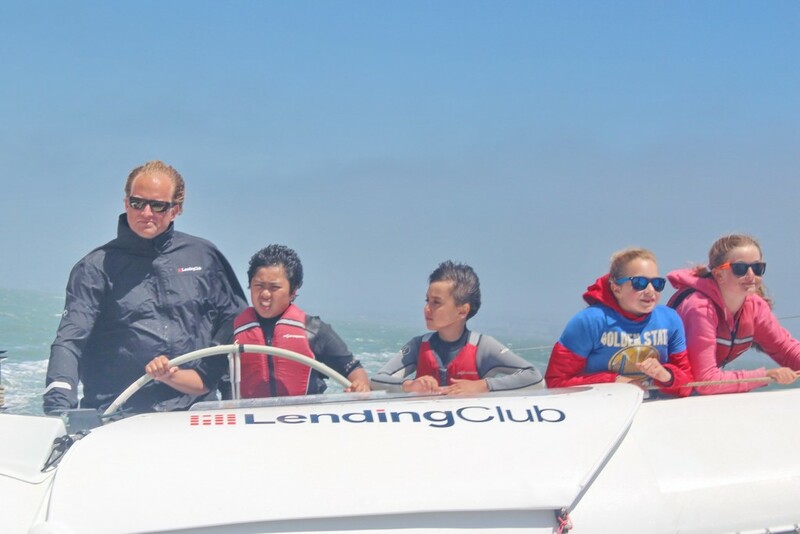 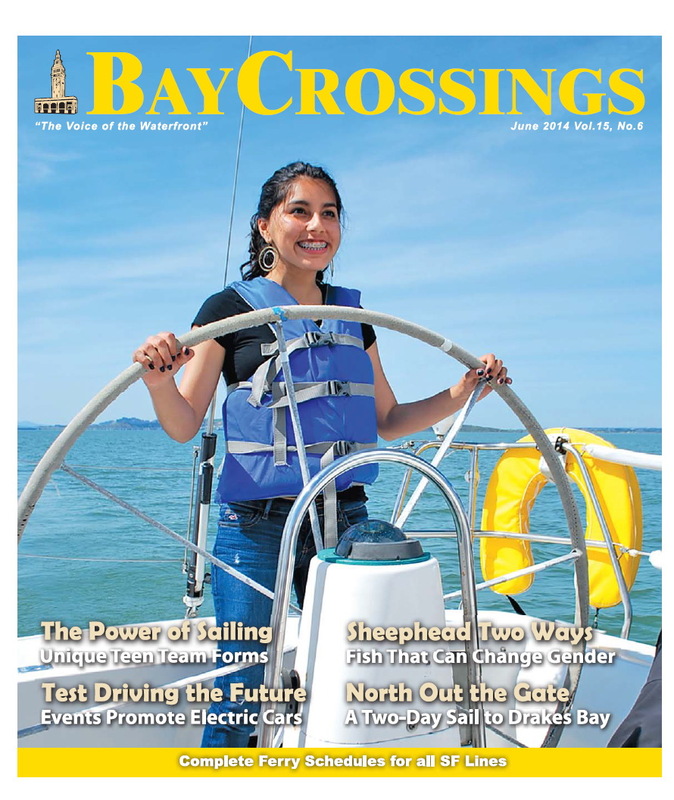 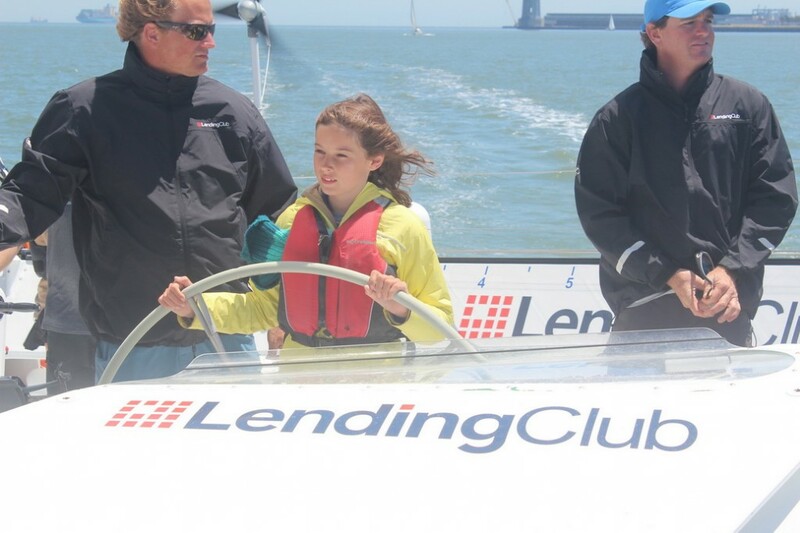 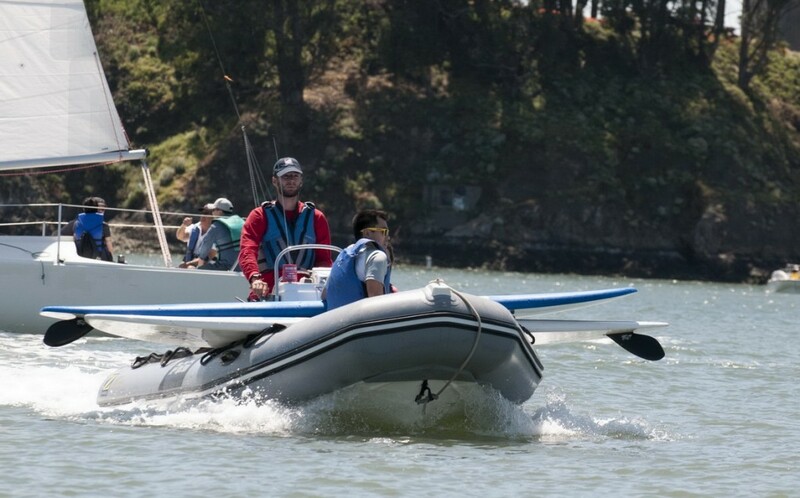 You can read more about that partnership in the June ’14 “Bay Crossings” article featuring an interview with Anthony Sanberg and his new goal – to offer the experience of sailing to hundreds of Oakland teenagers. I spent April Fools Day – no joke – with five members of the Envision Academy Sailing Team (E*A*S*T) during their first on-the-water training session of 2015. 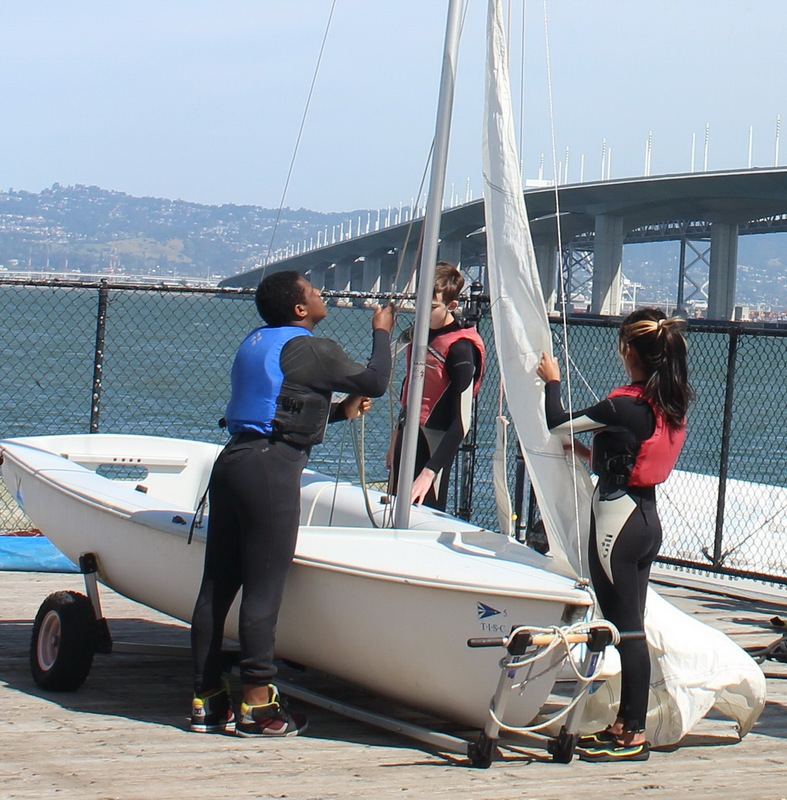 Although our head instructor Annie Butts has been working with the kids at EA in Oakland on chalk talks and PE since their team training ended last fall, Wednesday was their first time on Clipper Cove this year. 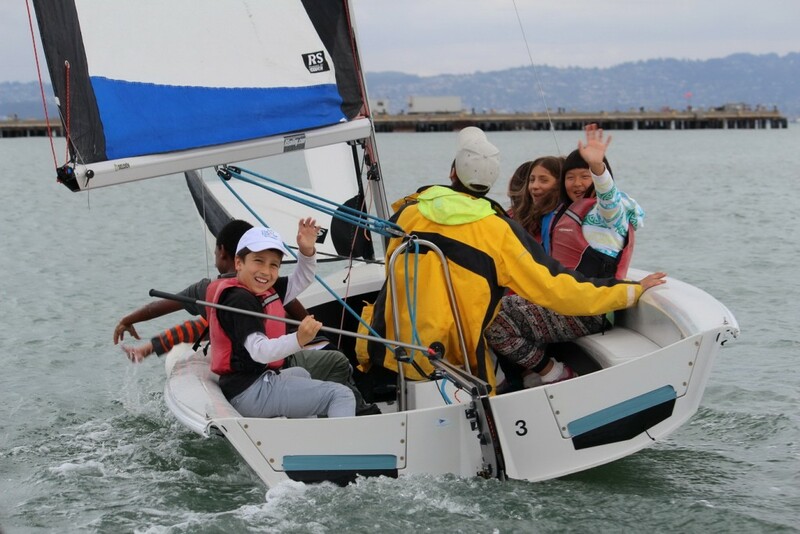 With the temperature at 61 and gusty winds of 15+ the kids did not get a warm welcome from Mother Nature. 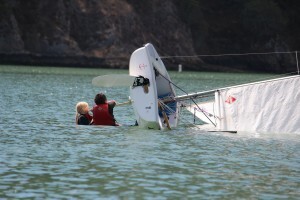 Undeterred they rigged and launched. 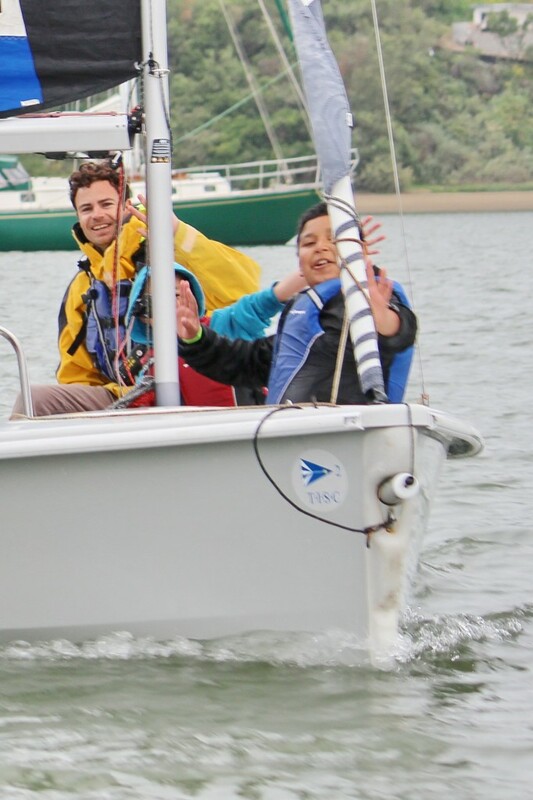 Then with Annie standing by in the safety boat they executed the capsizing and righting drills so important in all our youth sailing classes. 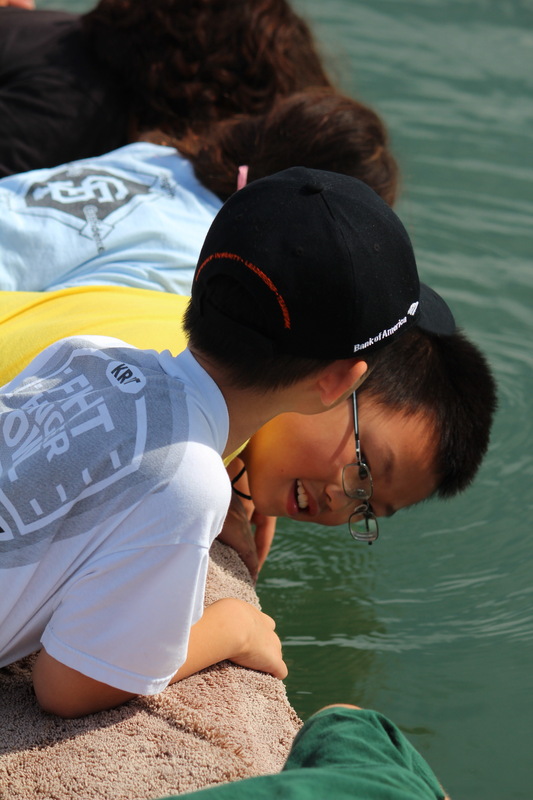 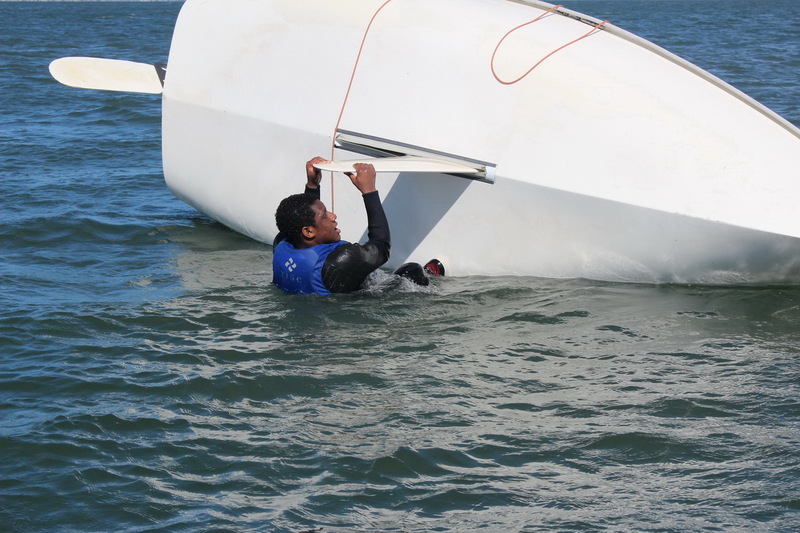 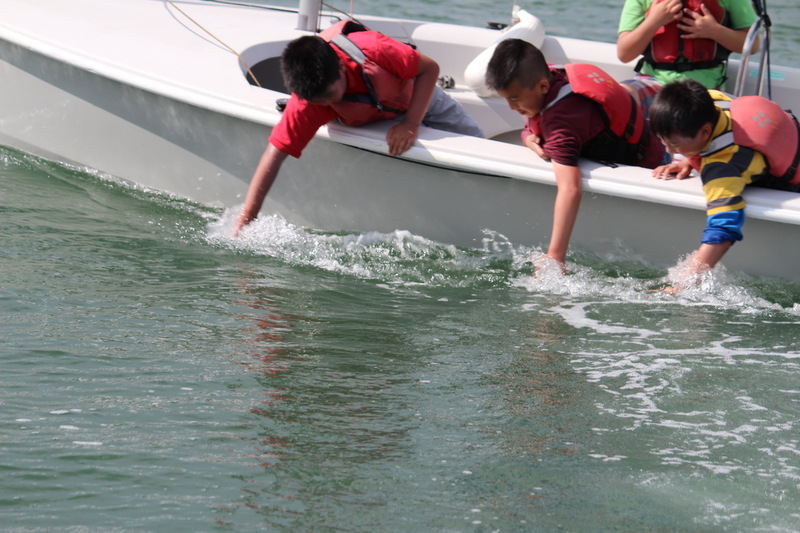 Whether 8 or 18, TISC kids must know how to self-rescue from any boat they sail – from Bugs to FJ’s to RS Ventures. 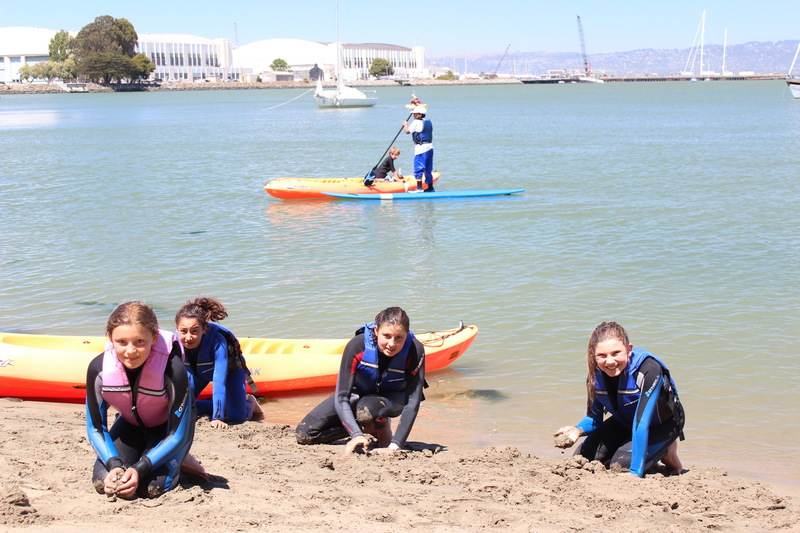 Raise your hand, zip up your foulies and head for Clipper Cove if you can do a pull-up wearing a wet suit and water-laden life jacket ! 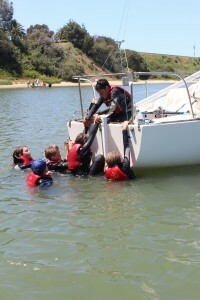 We’ve discussed life lessons in past blogs – like teamwork, for example. 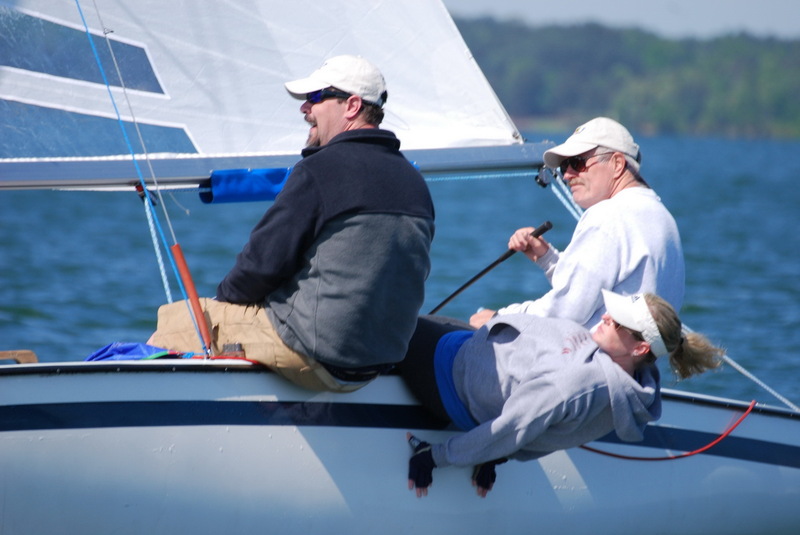 Righting a sailboat quickly and safely requires many of the same skills – goal setting, communications, teamwork and leadership – stressed at Envision Academy and drilled in by instructors at TISC and OCSC on a daily basis. 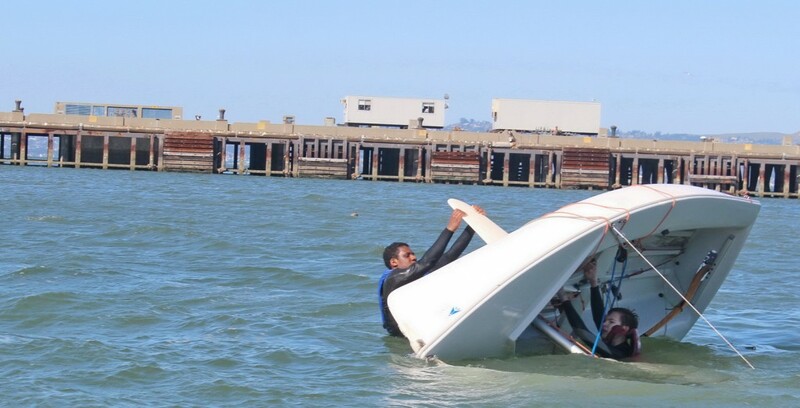 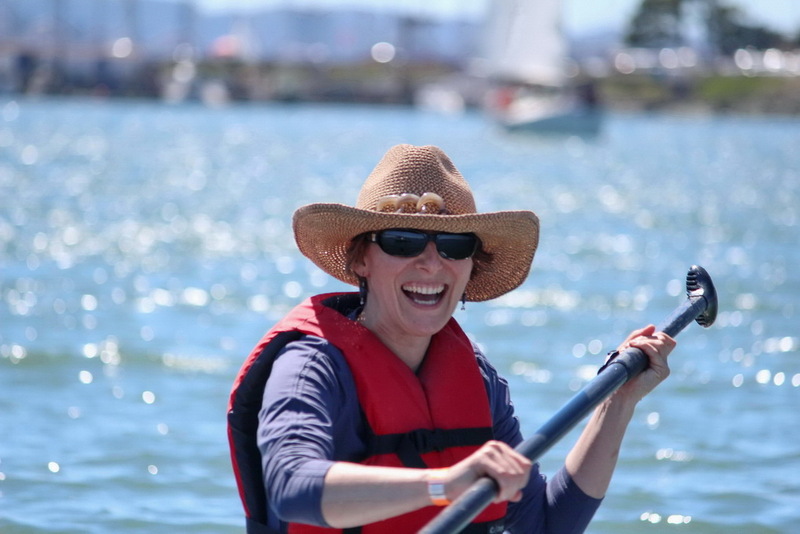 Oh – and be sure to smile after the capsize drills. 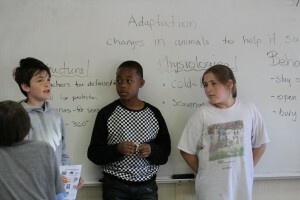 It helps to hide some of the inevitable angst and tends to build confidence in other students. Those of you who’ve raced on Clipper Cove know the wind gusts can be pretty squirrely as they blast east toward the Emmeryville Flats. I was impressed by the degree to which these EA students – remember they just started sailing last year – kept themselves and their boat flat and in good form (how may sit-ups can you pull off these days?) 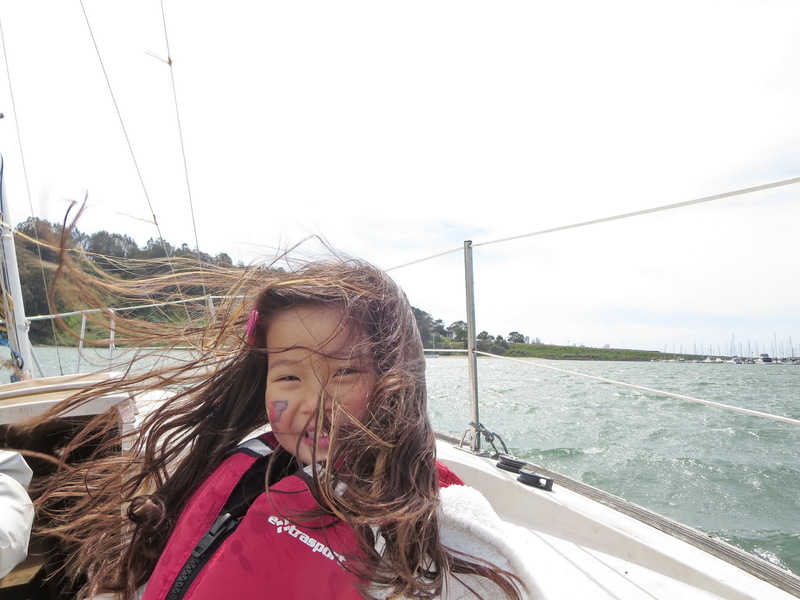 on this blustery day. 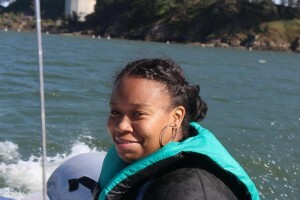 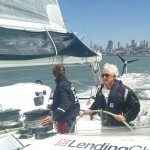 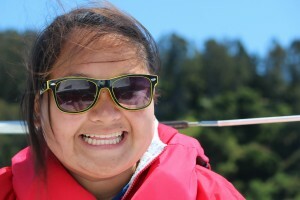 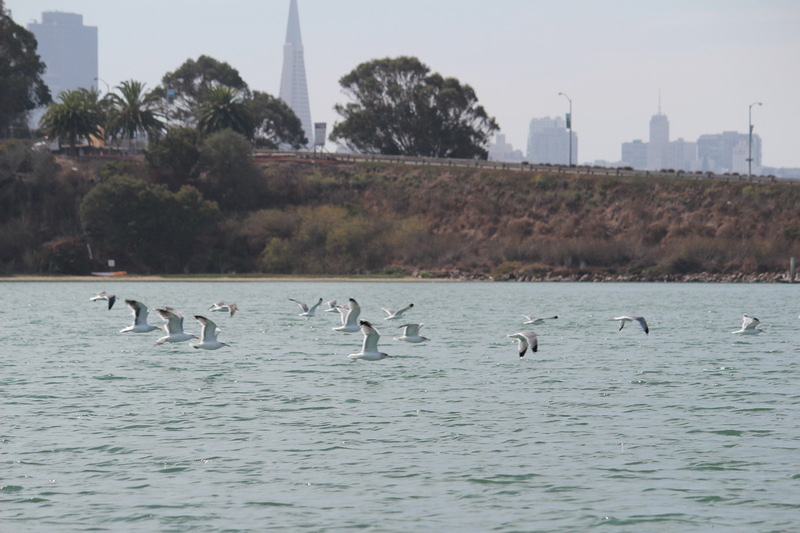 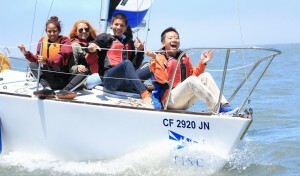 Anthony and his team are “all in” on getting teenagers sailing on SF Bay. 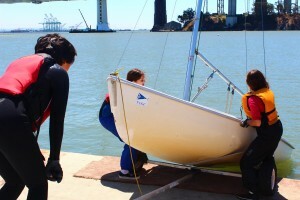 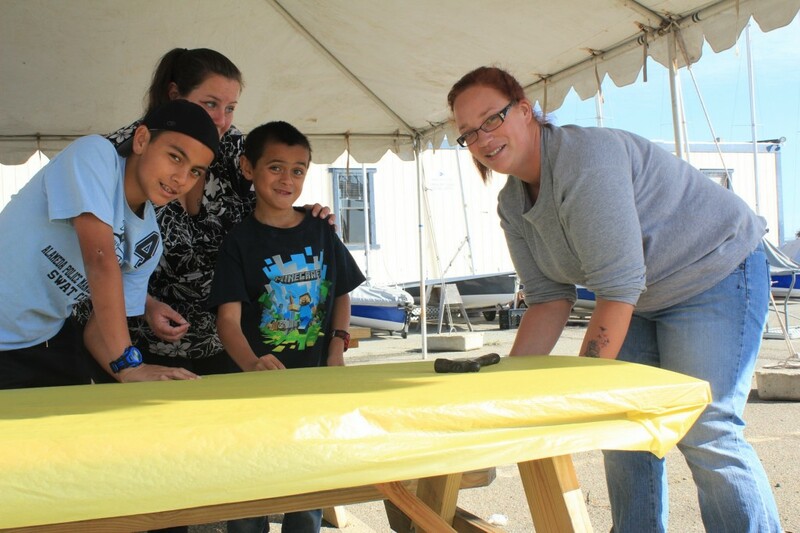 His instructors are volunteering their time, owners are making their boats available, and OCSC members are donating time and money to support the program. 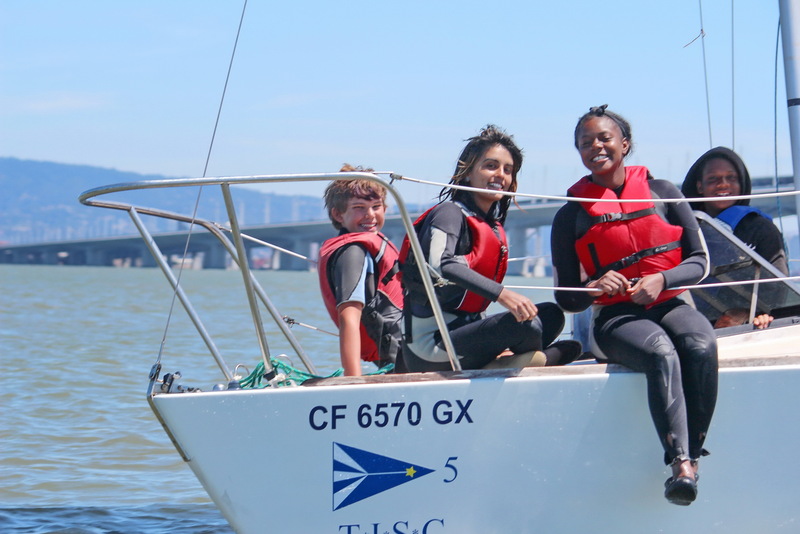 TISC is underwriting the project and has launched a fundraising campaign to continue the E*A*S*T racing program. 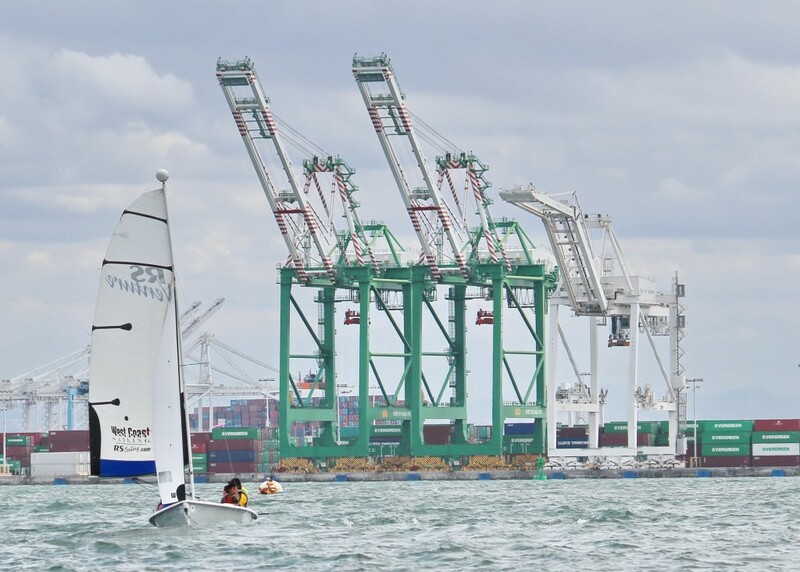 You can add your support here: Sponsor a Sailor. 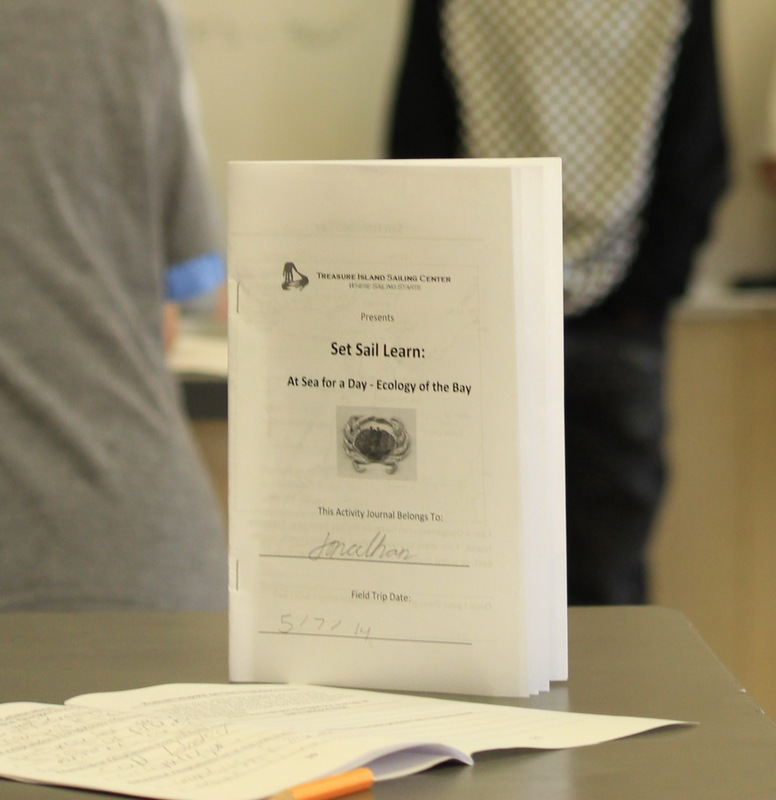 Here’s a short video on Envision Academy’s philosophy and approach to raise the graduation and college matriculation rates: Envision Philosophy. 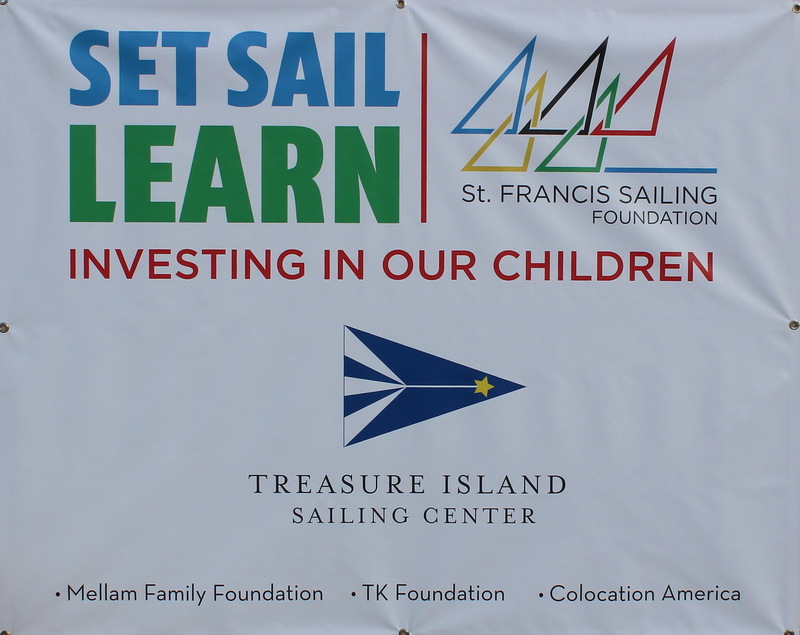 A generous grant from the St. Francis Sailing Foundation could provide $10,000 for our children and youth programs. 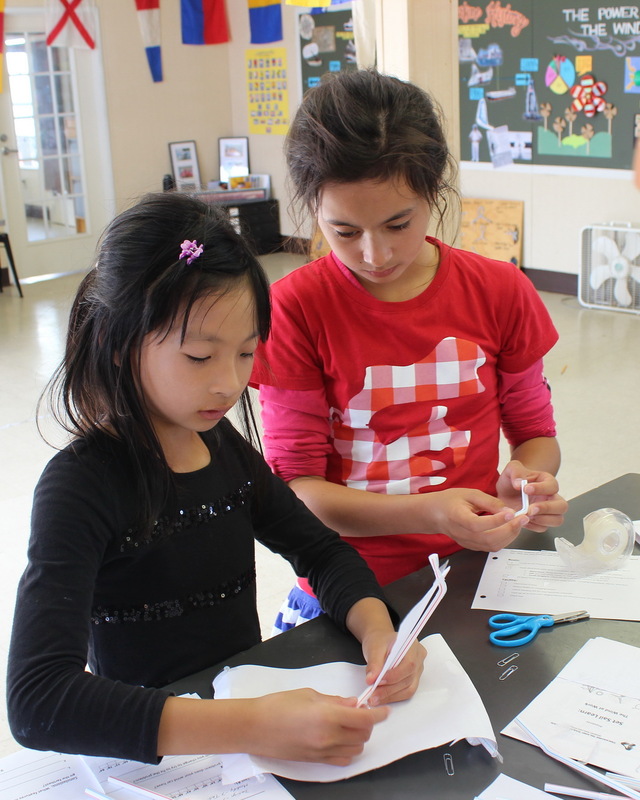 We need to match this $5,000 challenge grant by year- end. Can you please help us help a child learn to sail? Every $1 you donate by December 31st means our youth programs will receive a $2 contribution toward children and youth sailing programs, community outreach and our innovative Sailing into Schools programs for 4th graders. To fully cash in on this matching grant we need to match the $5,000 challenge by the end of the year (Donate On-Line HERE). 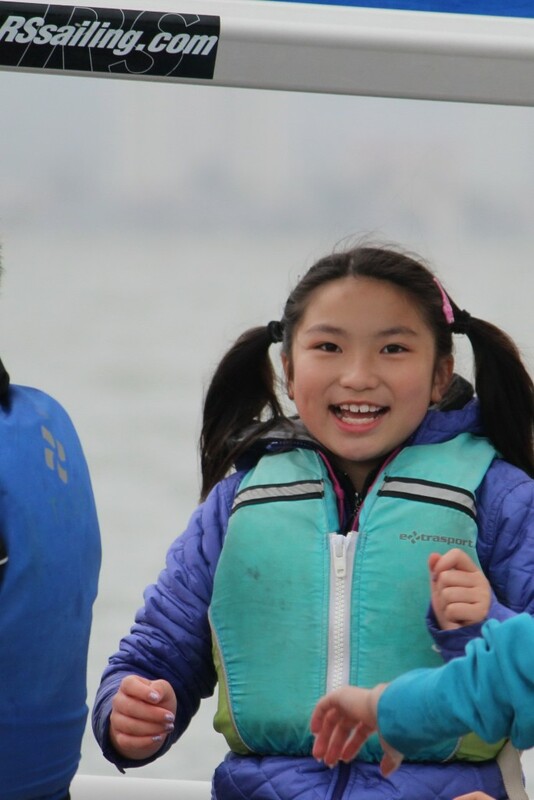 Our goal is to raise $5,000 in the next five weeks in order to match every dollar in this gracious donation. 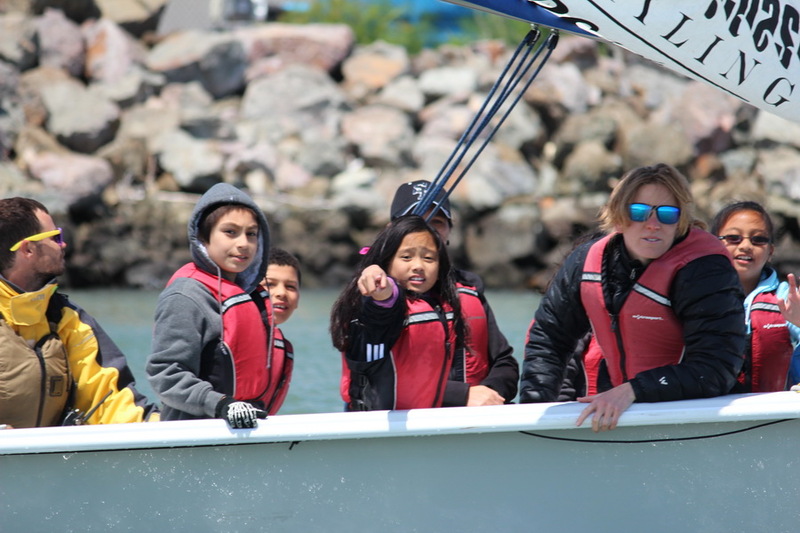 The resulting $10,000 would mean a lot to kids who depend on TISC fundraising to provide them with the opportunity to learn important life lessons through sailing. 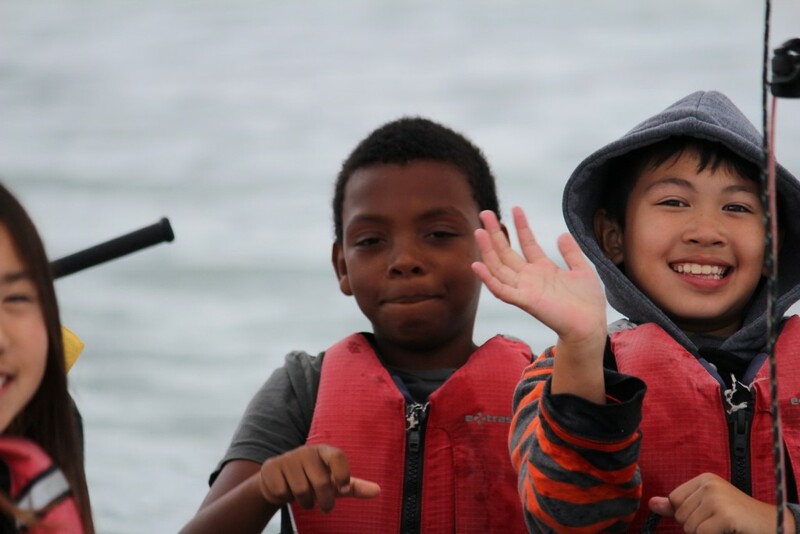 As you plan your year-end giving please consider support for a child, or a group of after-school students or a class of 4th graders. 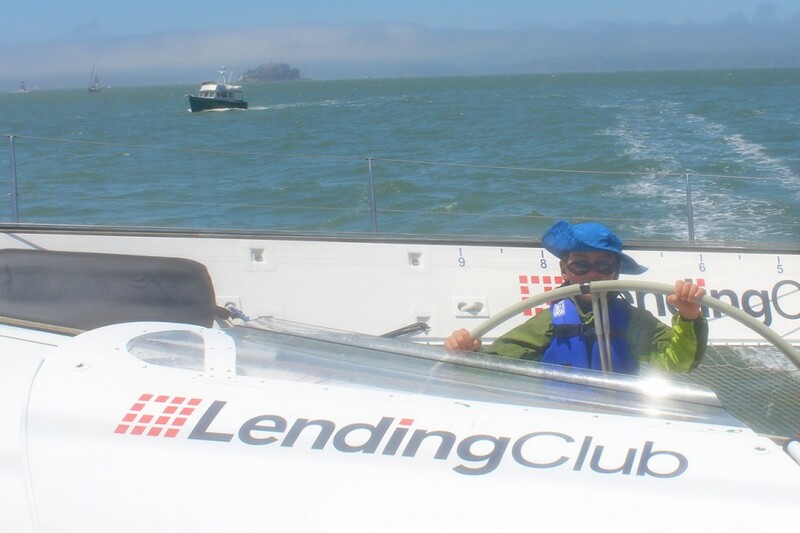 Your donation in any amount (perhaps your employer has a matching-gift program as well?) is greatly appreciated and can be made quickly and simply using the TISC Secure On-Line Donation Page. 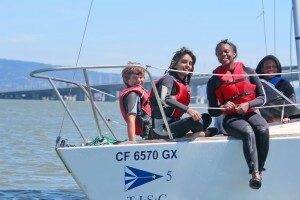 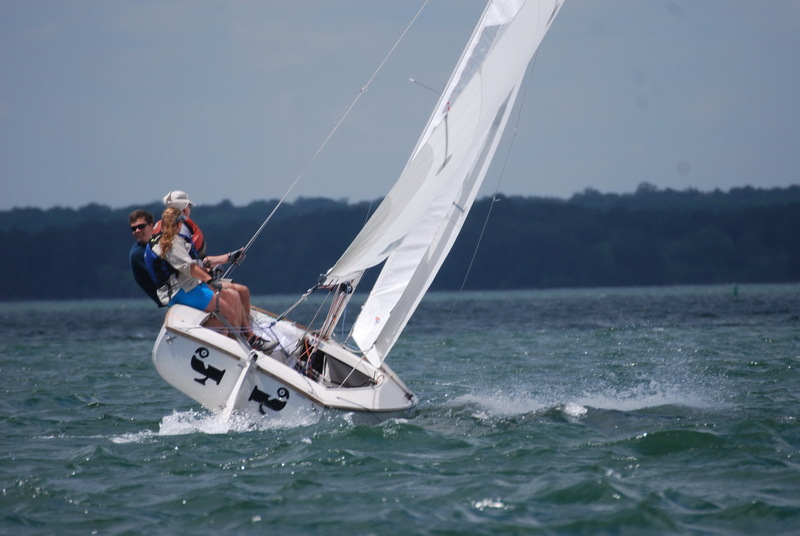 TISC uses sailing as a platform to teach life lessons including goal setting, teamwork, communications, and leadership. Our higher level objectives are to provide access to the bay, instill a feeling of stewardship, and develop self-esteem. 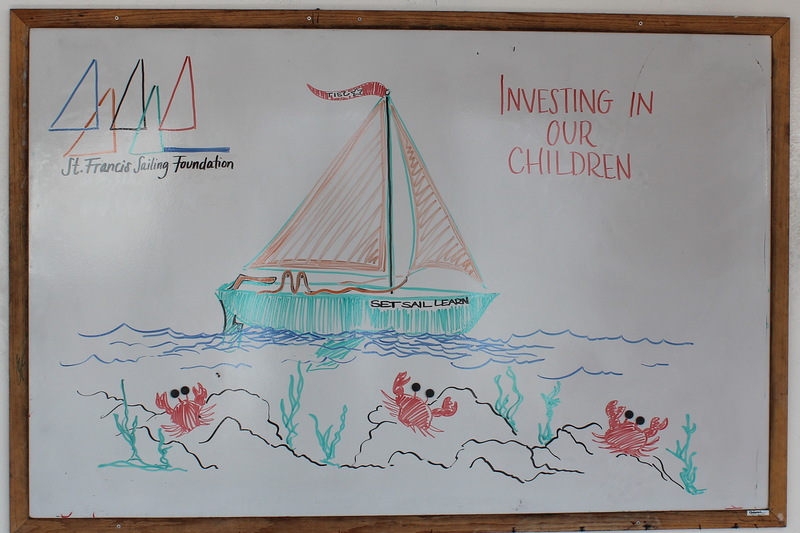 We raise money for scholarships so that no child is ever turned away in order to reach these objectives. 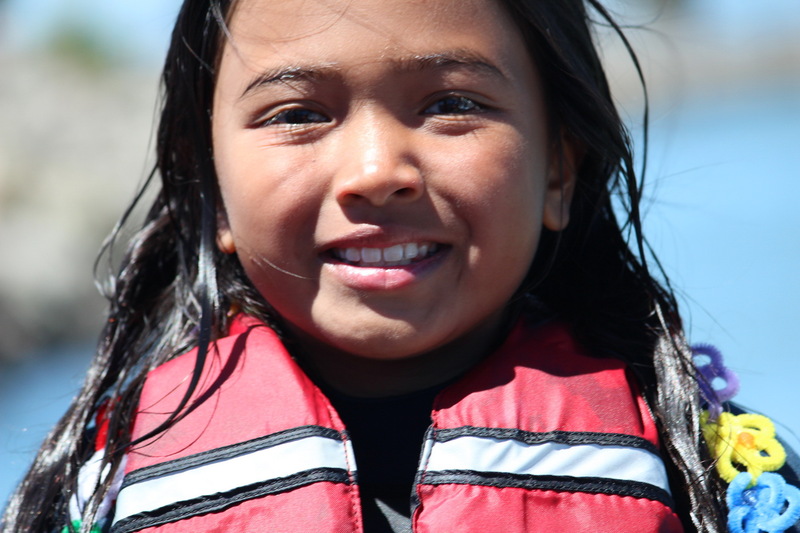 We’ve included a few 2014 smiles from kids who benefited from your 2013 generosity. 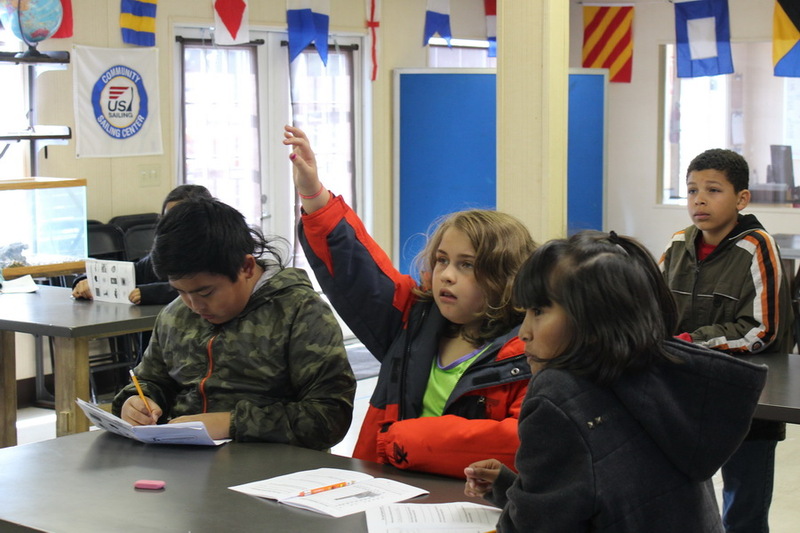 Goal setting is one of the first life lessons taught in our classes. 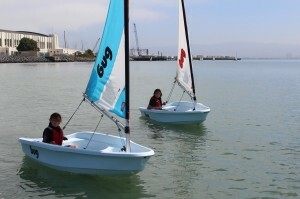 Sailing up wind is not obvious to newbie sailors. 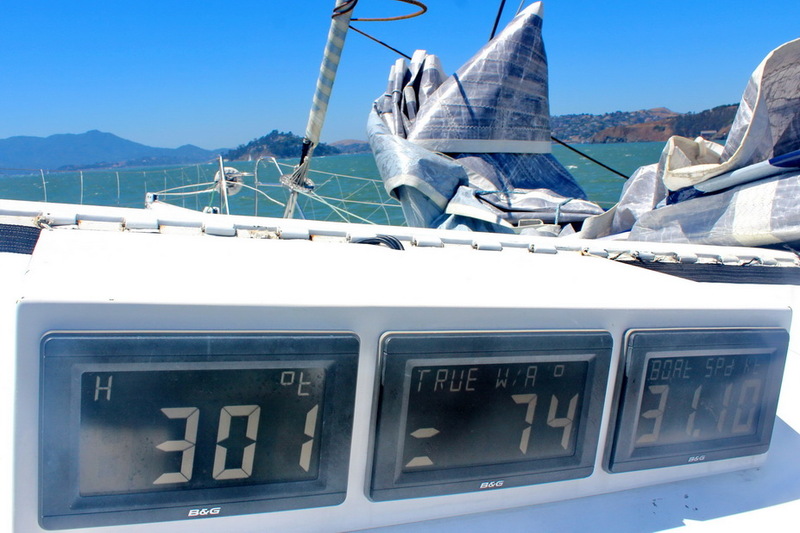 That is often one of the first goals – sail west toward San Francisco. 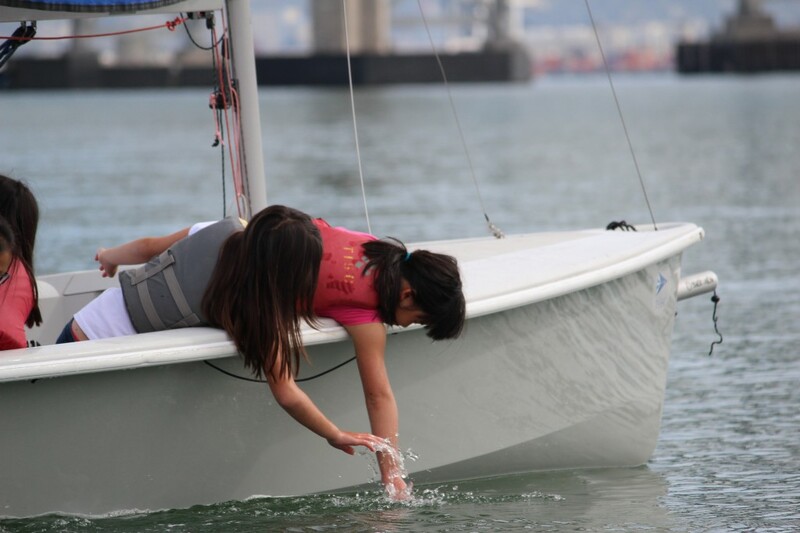 These kids mastered that skill. 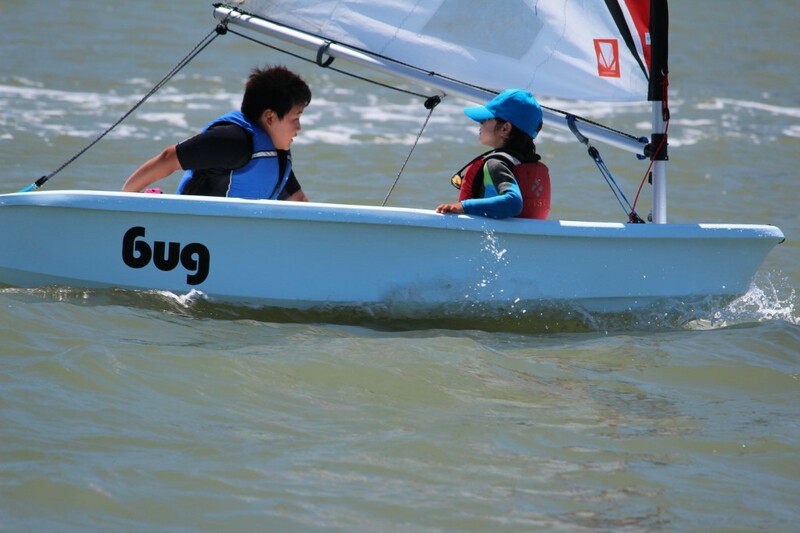 Teamwork is the easiest of the skills we teach because sailing is all about working together. 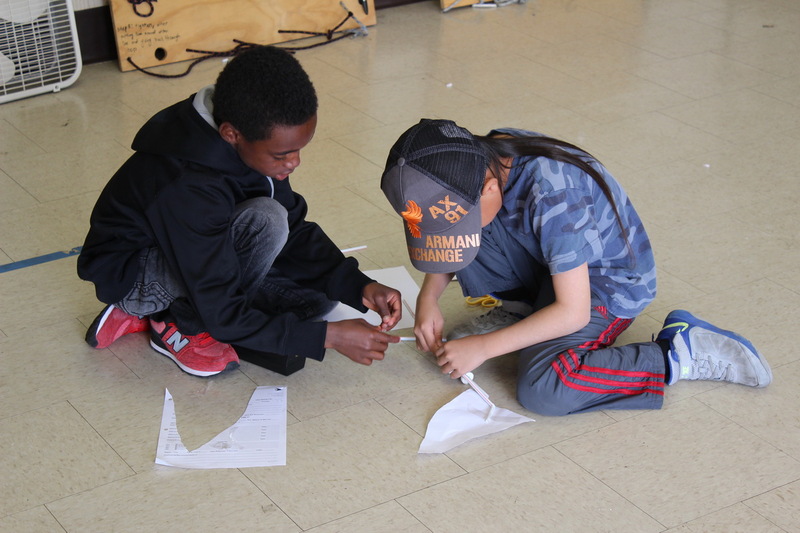 Setting up, crewing, hauling out and cleaning up all work much better when teamwork kicks in. 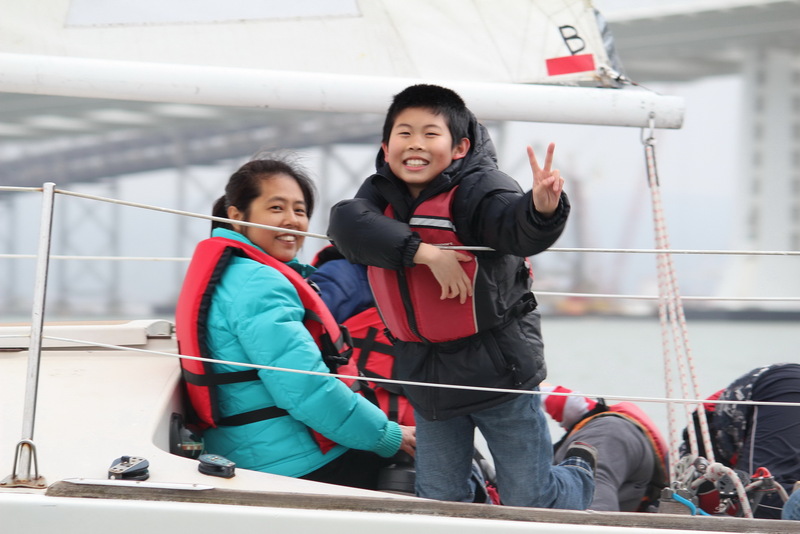 Parents are a valuable part of our team and often join in for special event. 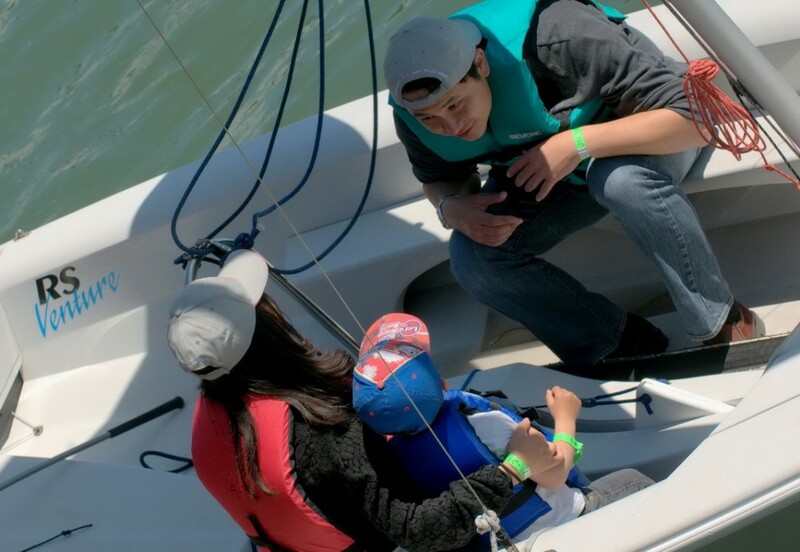 Parents are a valuable part of our team and often join in for special event. Our first co-able class took teamwork to a whole new level by forming teams of kids with varying levels and types of disabilities to work together as first-time sailors. 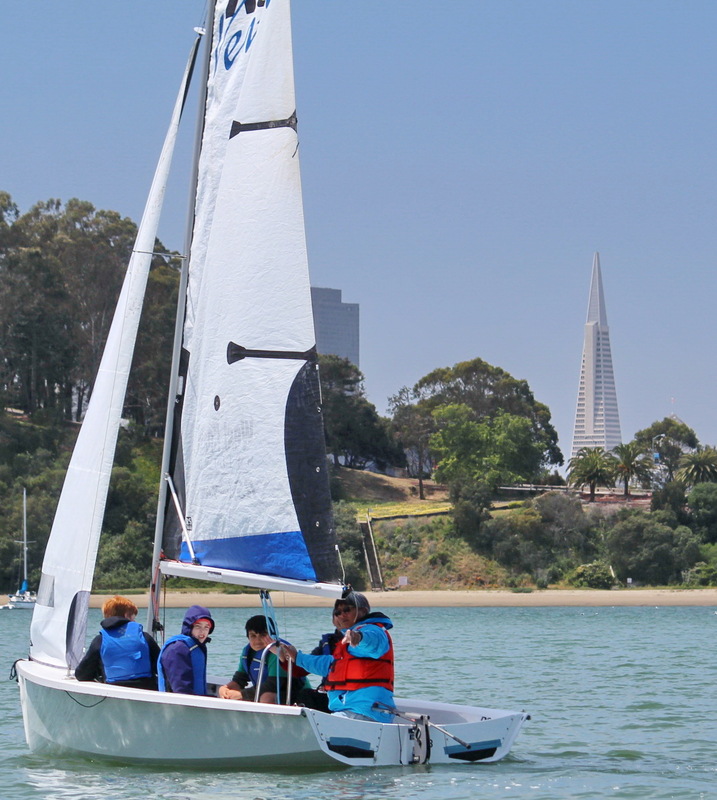 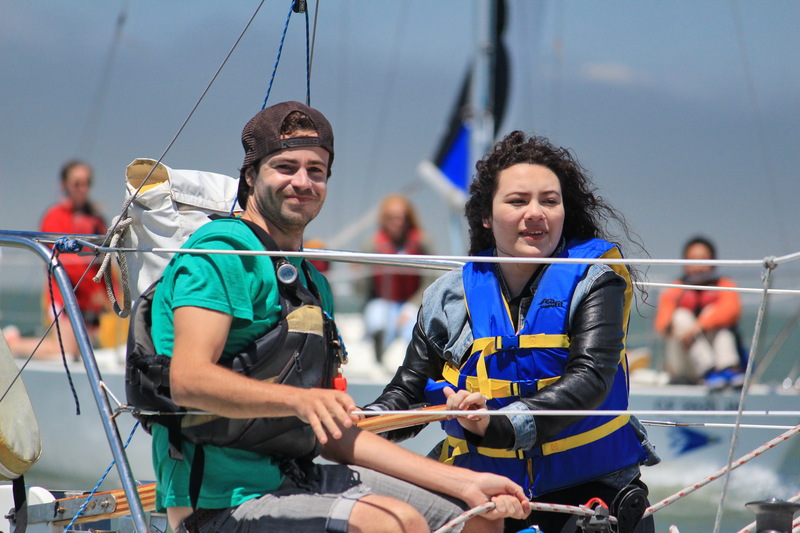 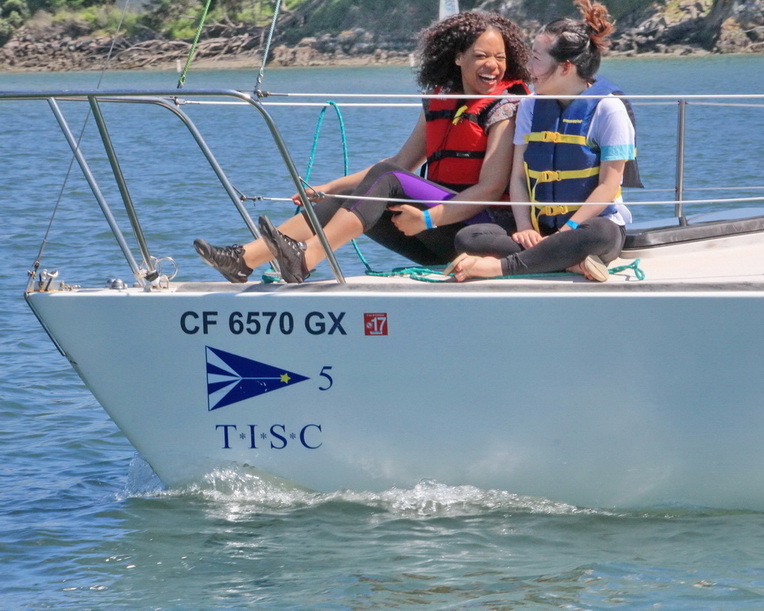 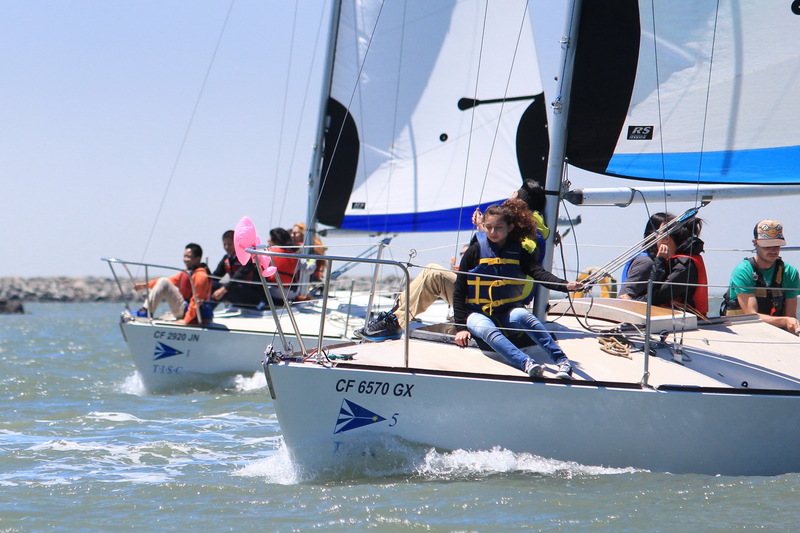 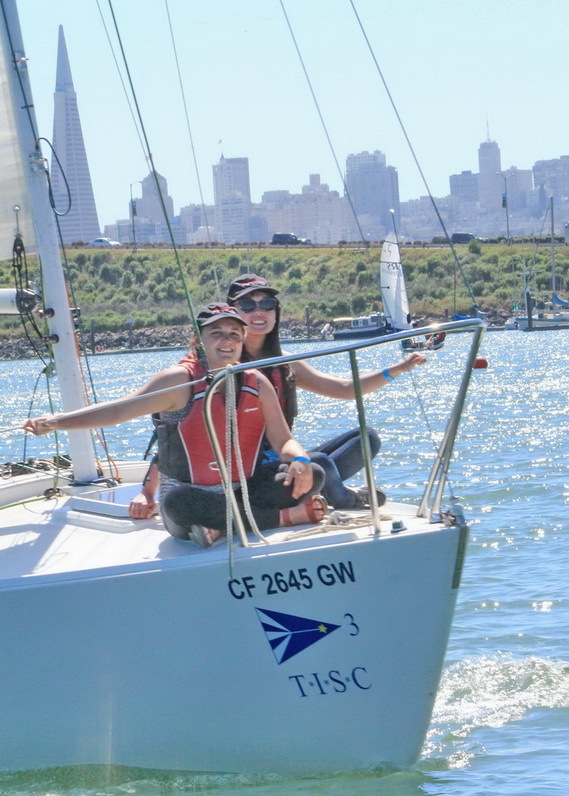 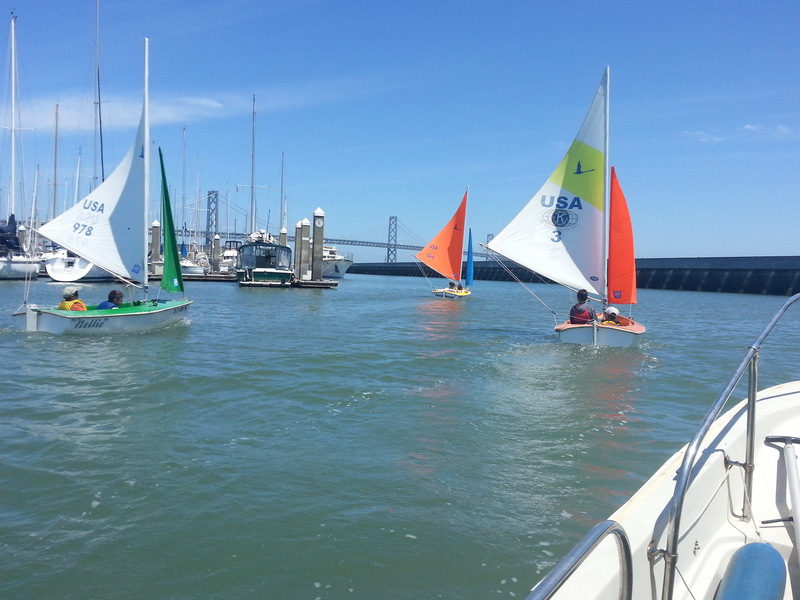 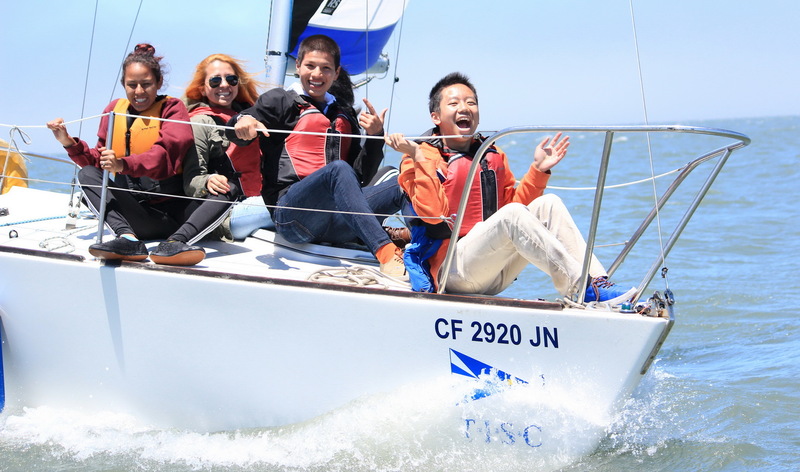 TISC joined forces with Bay Area Association of Disable Sailors last summer to run the first-ever Co-Able Sailing Camp on San Francisco Bay. 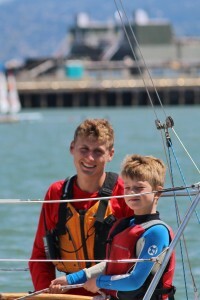 Communications between skipper and crew can be difficult with new sailors. 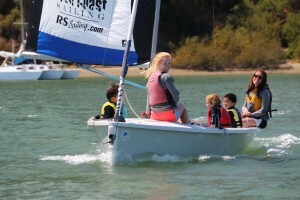 We often team up more experienced with less experienced kids. Its not unusual to find one of our instructors or junior instructors to hop in a boat with kids to help them tune up these skills. 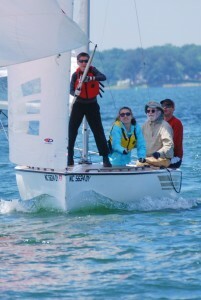 Leadership skills emerge as experience builds. We see it in small ways weekly and over the course of the summer in our older youth. 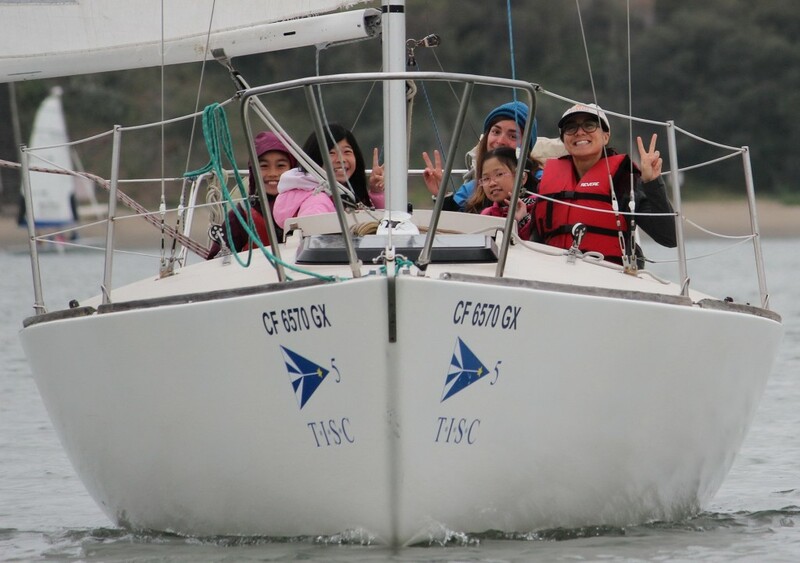 Many TISC junior instructors have “come up through the ranks” to become excellent full time instructors. 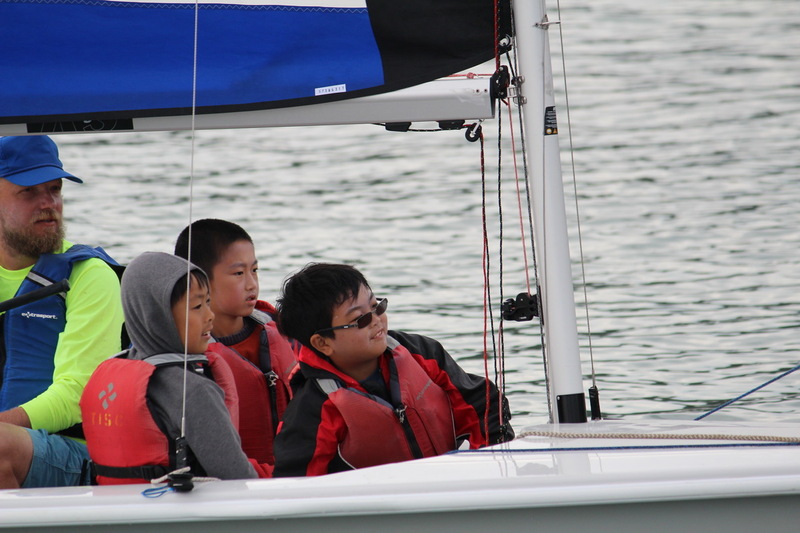 Confidence and self esteem are some of the most important byproducts the TISC sailing program. Many of our summer students have not sailed before their first week of classes. Some have been around the water, most have not. Drills such as capsizing can be scary. 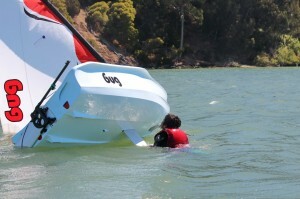 After several days I’m amazed at how many kids proclaim “capsizing was the best part of the day”. Confidence at its best! 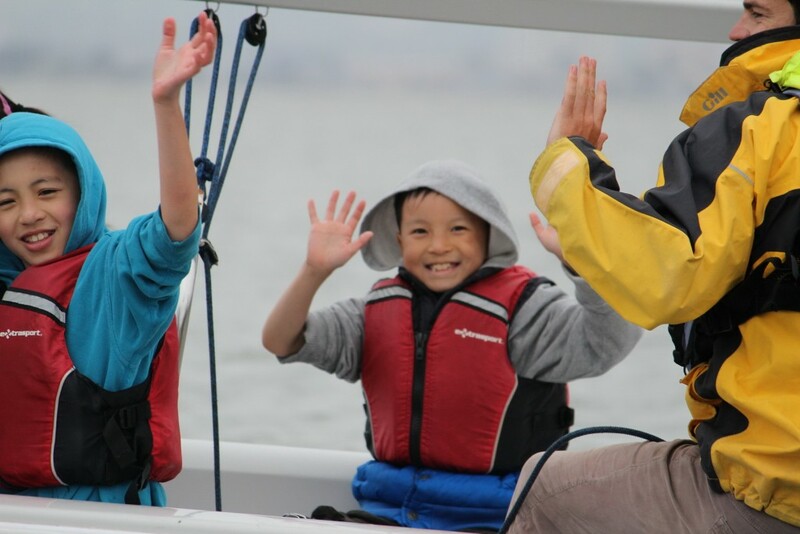 Community outreach programs provide Bay Area Children and Youth with the opportunity to enjoy San Francisco Bay from aboard a sailboat. 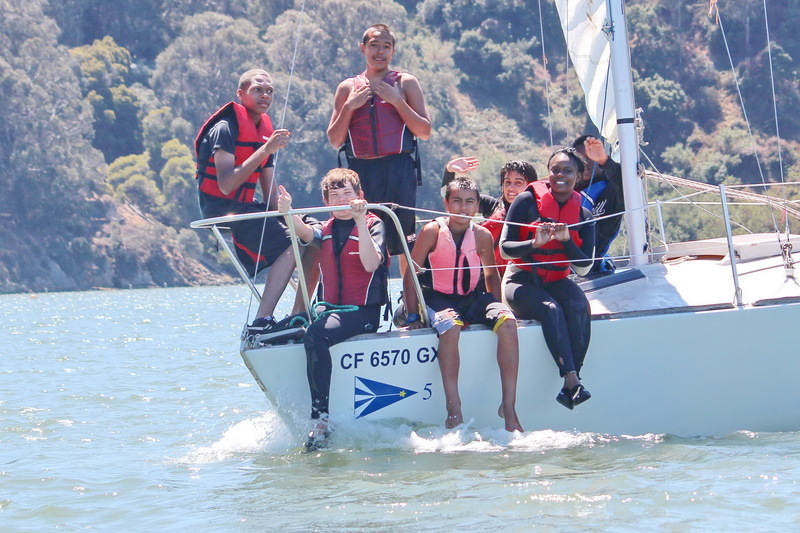 These programs run nearly all year long and provide opportunities with youth from over 35 of our partners after school in the spring and fall and during the summer. 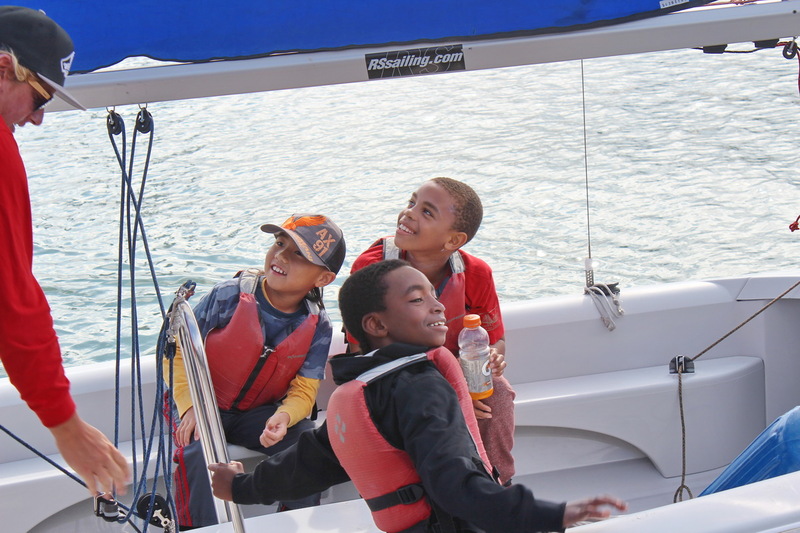 We partner with agencies who provide outreach and learning for youth as well as children. 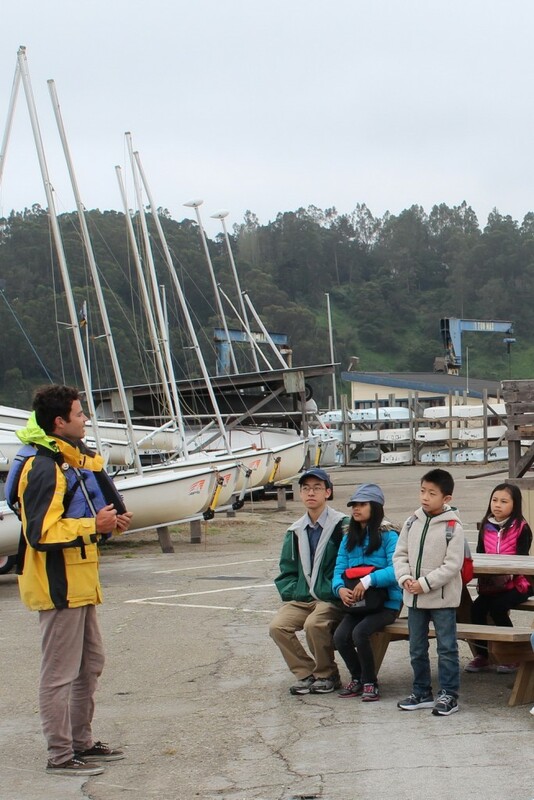 These soon-to-be young adults are an ideal age to understand all about bay ecology and stewardship. They “get it”. 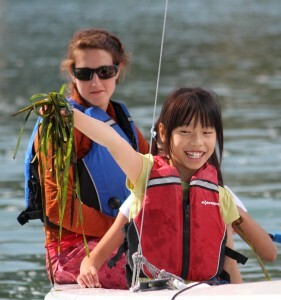 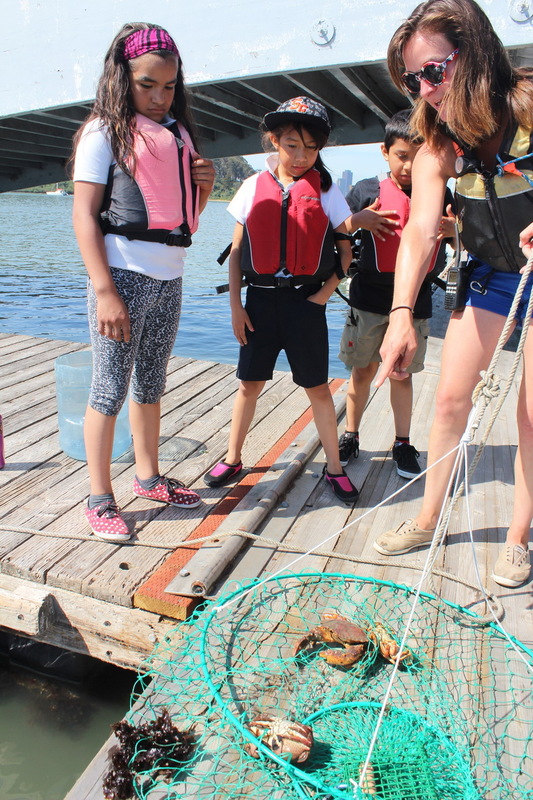 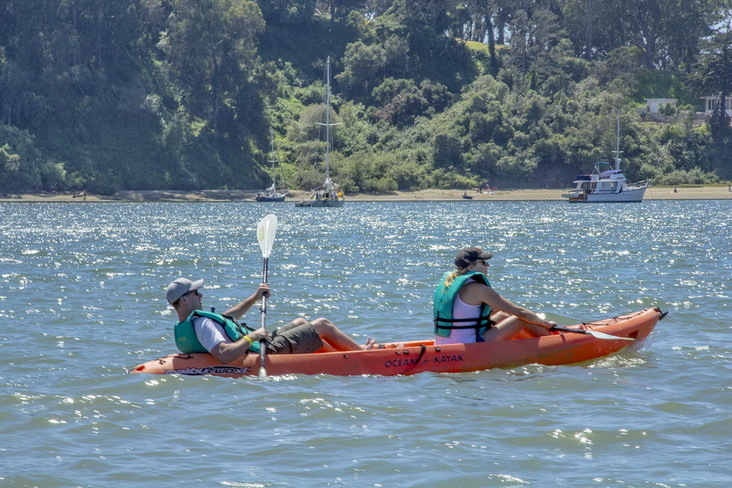 Our Set Sail Learn (SSL) classes provide opportunities to get on the bay – to touch the water, grab a handful of seaweed and take a look at Clipper Cove “residents” large and small. 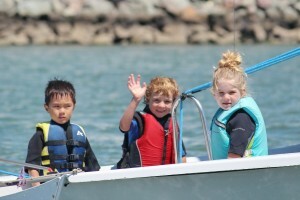 These kids leave with a much better appreciation of the water, wind, tide, sailboats and creatures who hang out here. Great way to develop future bay stewards! 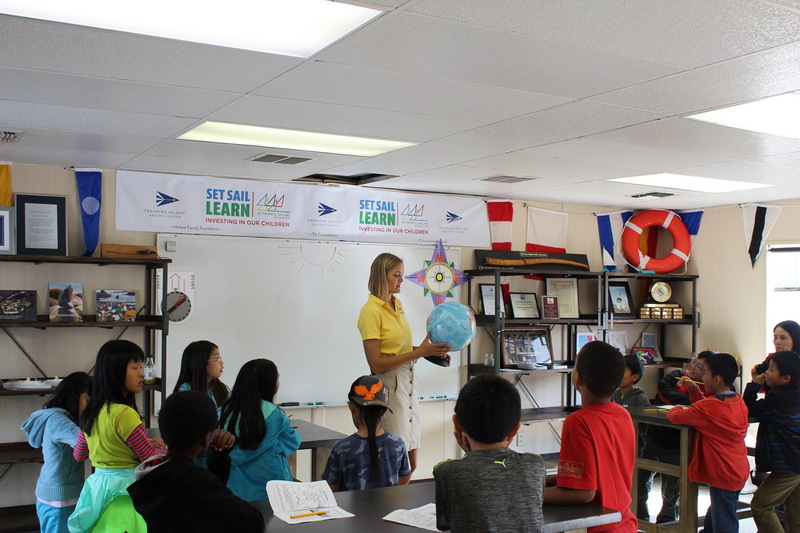 Our innovative SSL experiential learning classes also provide an opportunity for kids to communicate with their classmates and lead discussions. 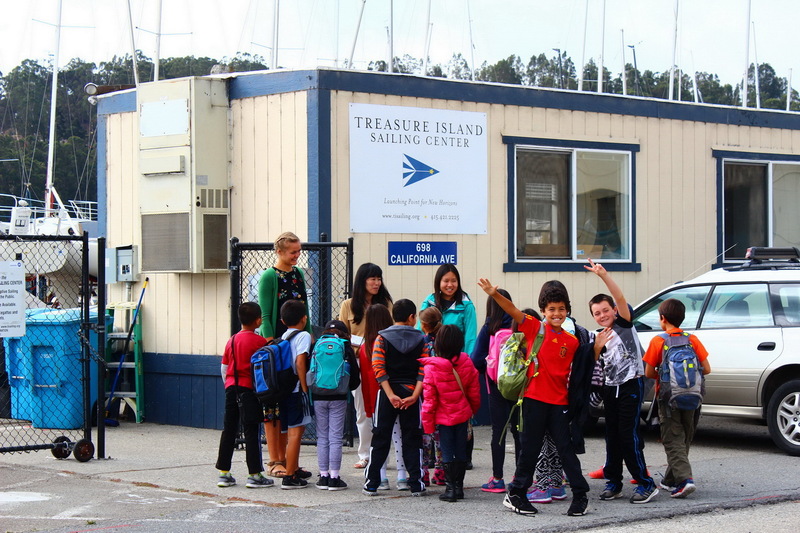 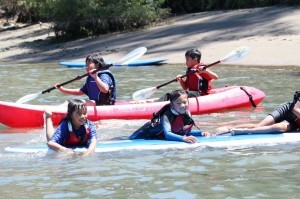 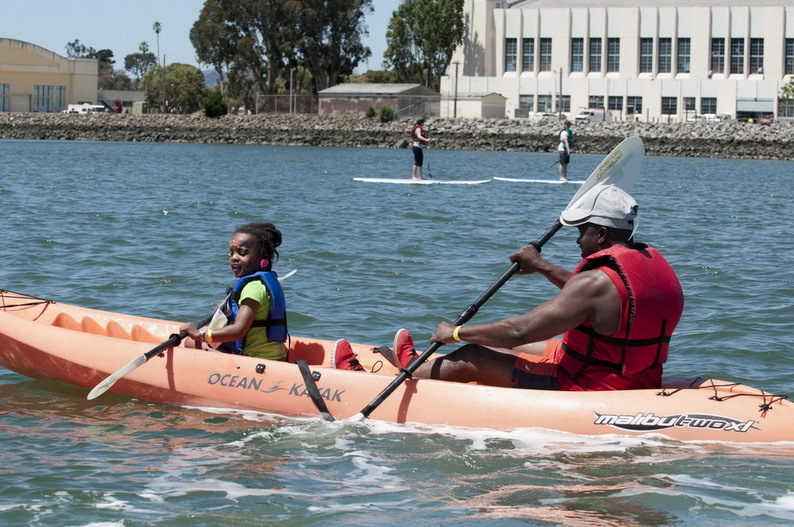 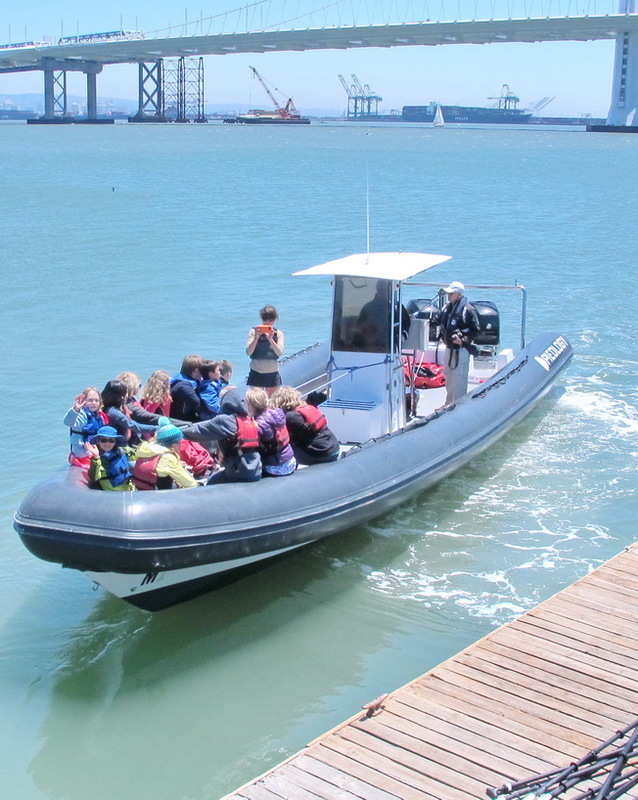 TISC provides curriculum, bus transportation, instructors, boats and skippers at no charge to SFUSD fourth grade classes.